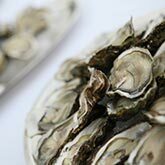 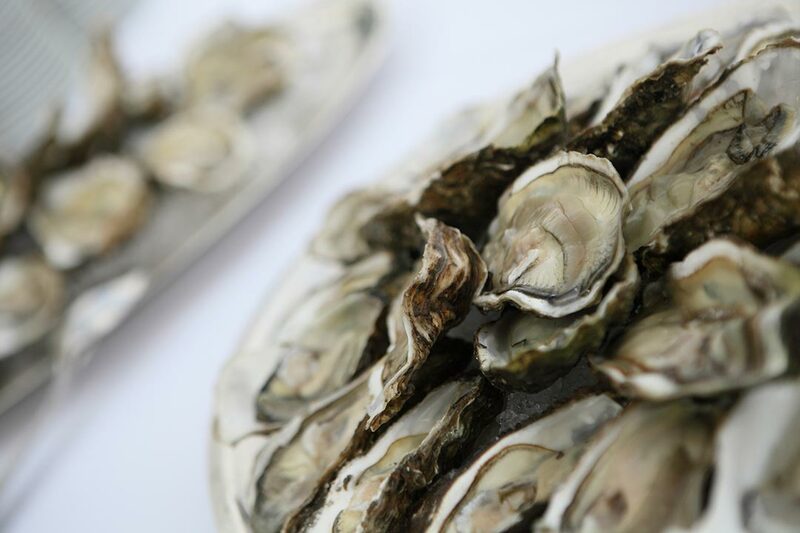 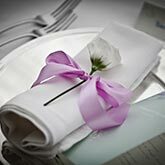 All the services you require will be tailored to your needs and provided by our professional suppliers. 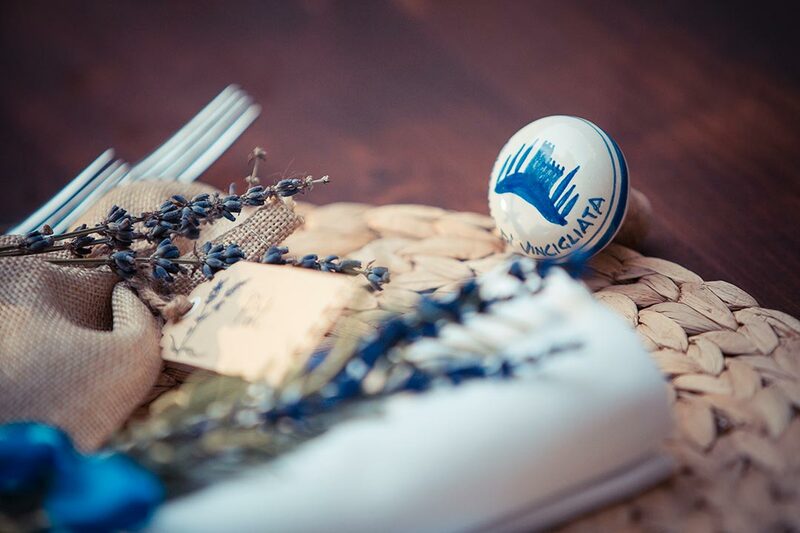 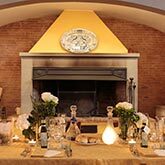 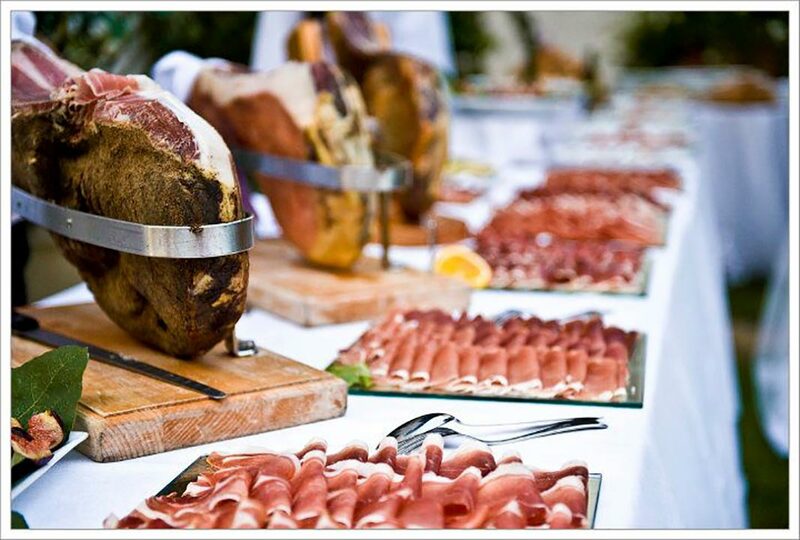 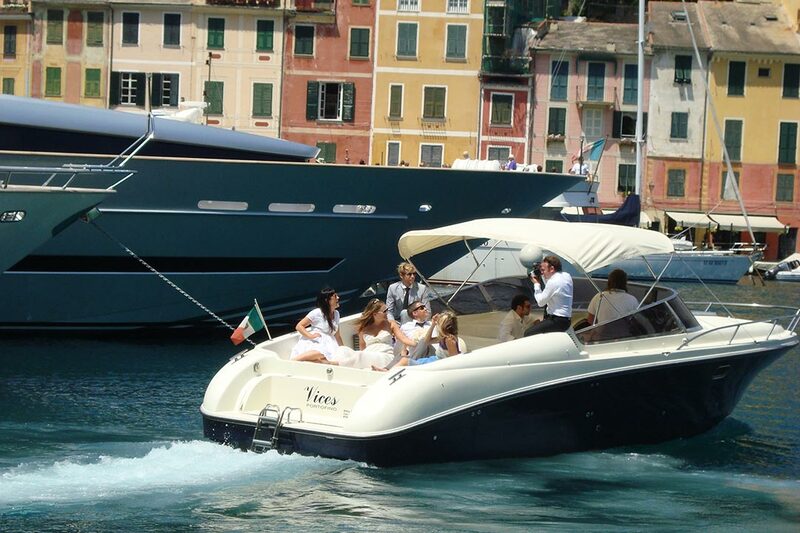 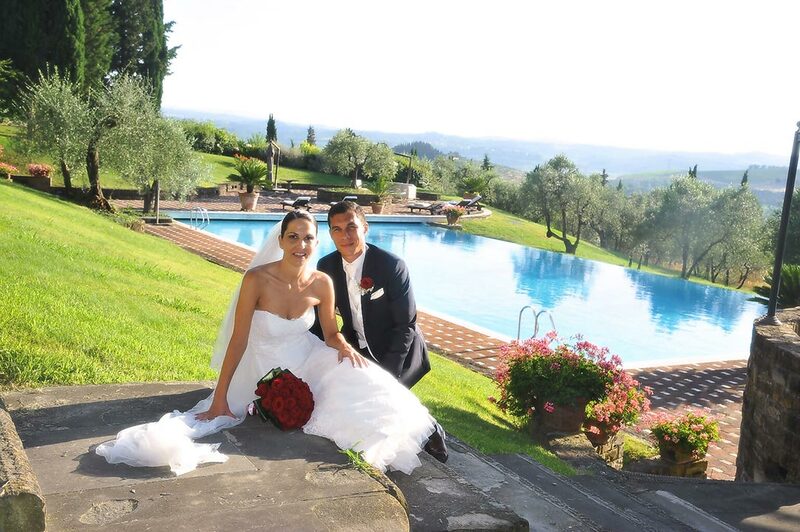 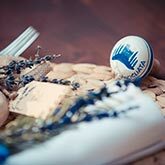 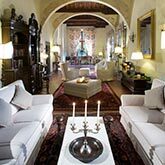 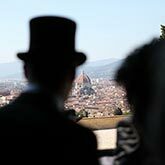 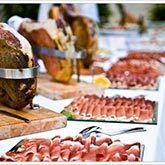 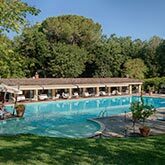 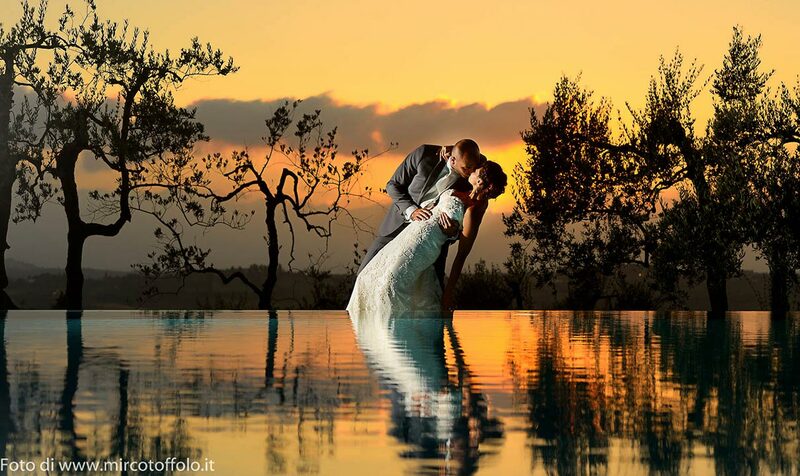 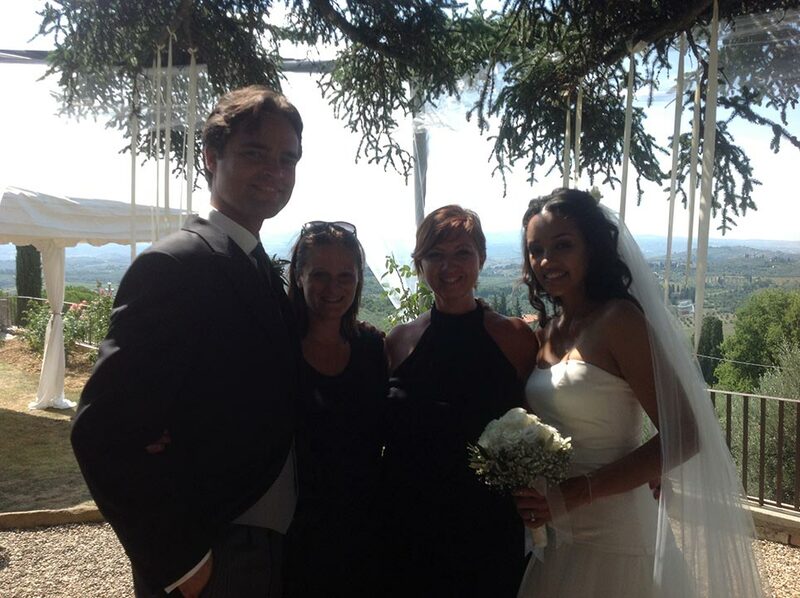 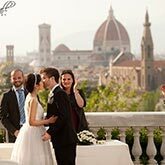 Besides wedding services, we can also arrange all the details of your entire stay in Italy for you as well as your guests. 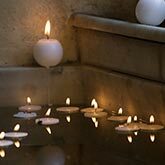 It is up to you what kind of assistance you would like us to provide. 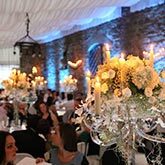 We offer you the wealth of our knowledge and experience in presenting to you our selection of venues and trusted suppliers. 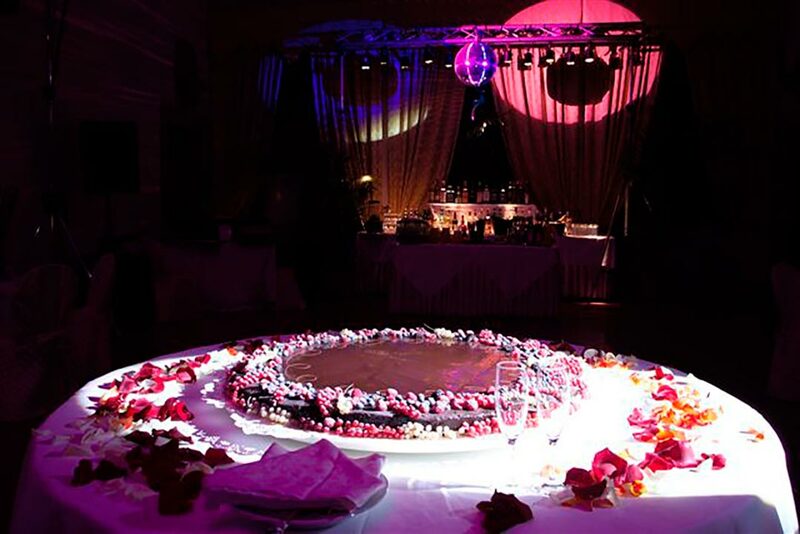 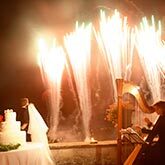 From the ceremony and reception design, to flowers, catering, photography, entertainment, the wedding cake, transport and your honeymoon, we offer you options that reflect the type of experiences and celebration you are seeking. 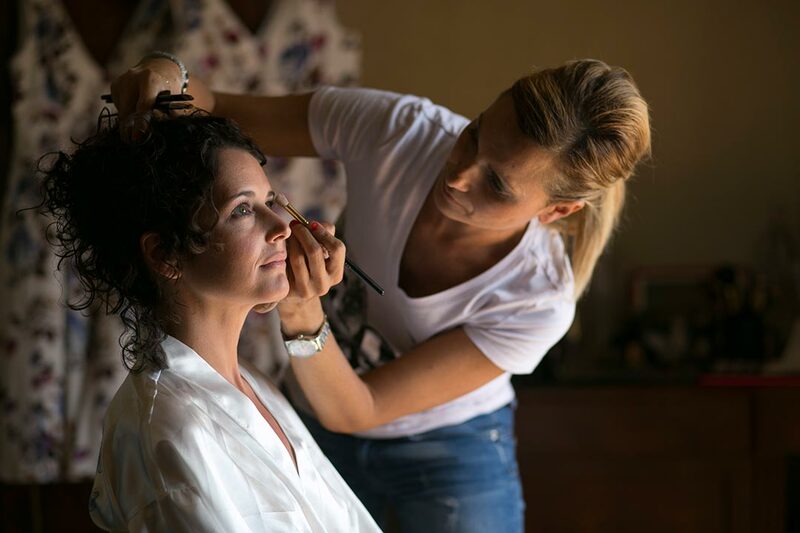 We can arrange personalized services, meetings with stylists and make-up artists, and as travel agents we offer assistance with accommodations and a full concierge service for you and your guests. 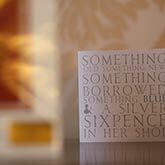 W · Why Choose Happening? 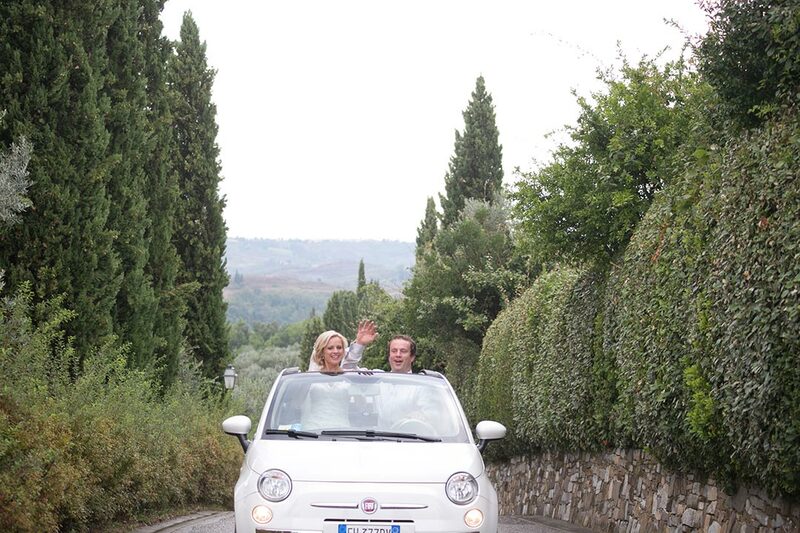 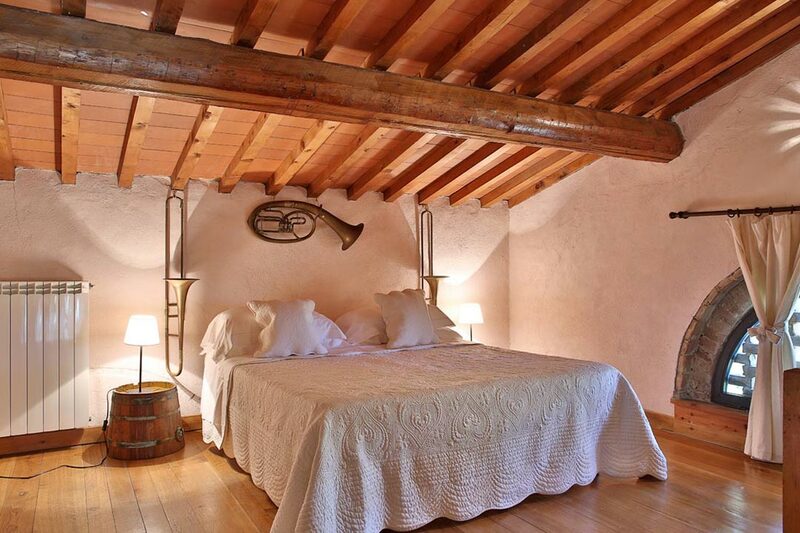 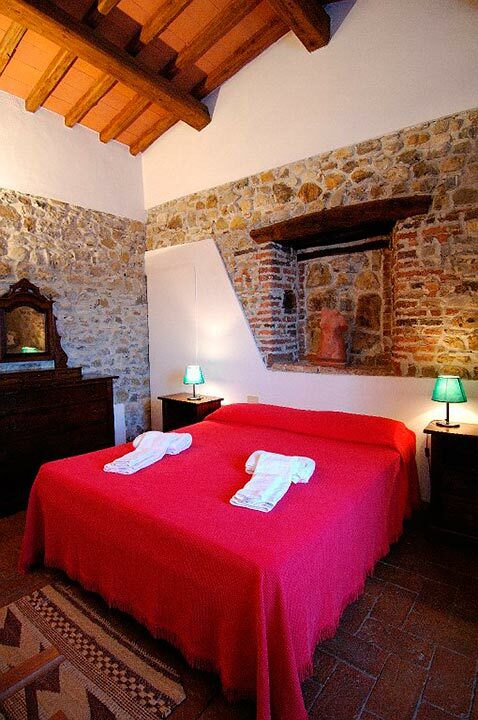 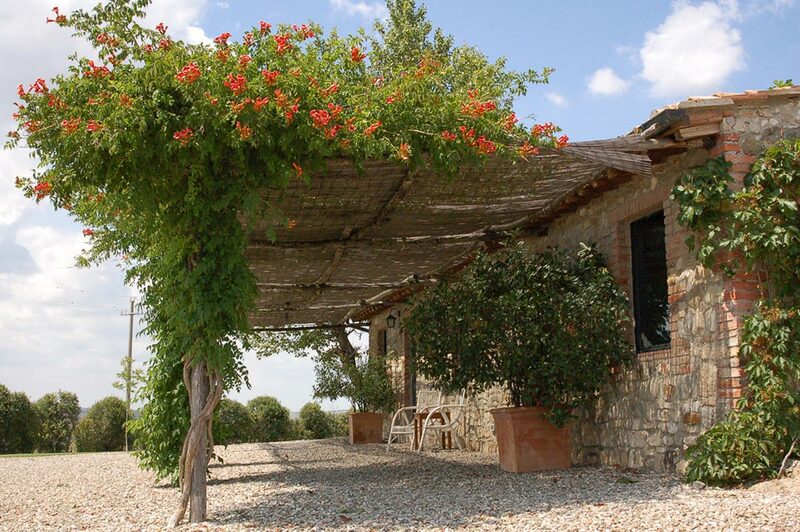 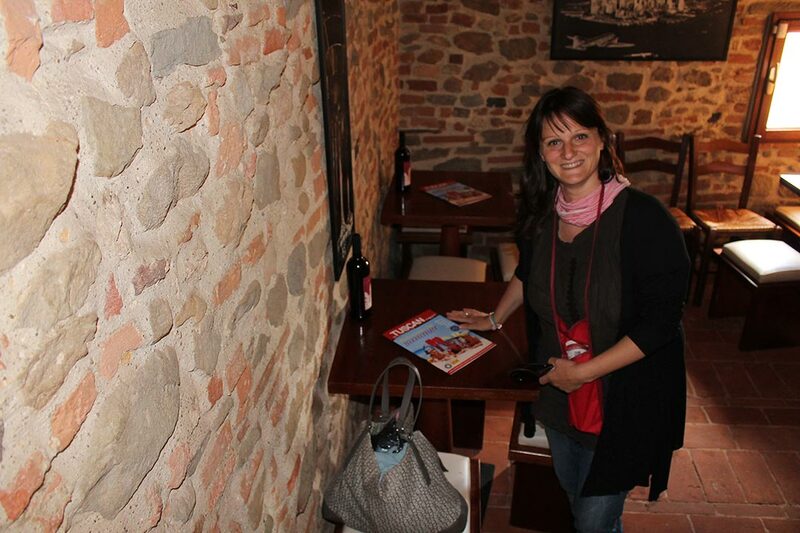 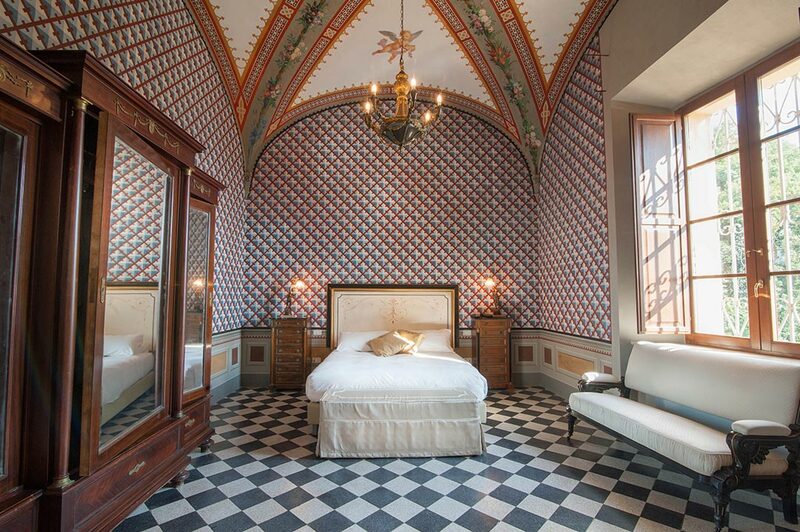 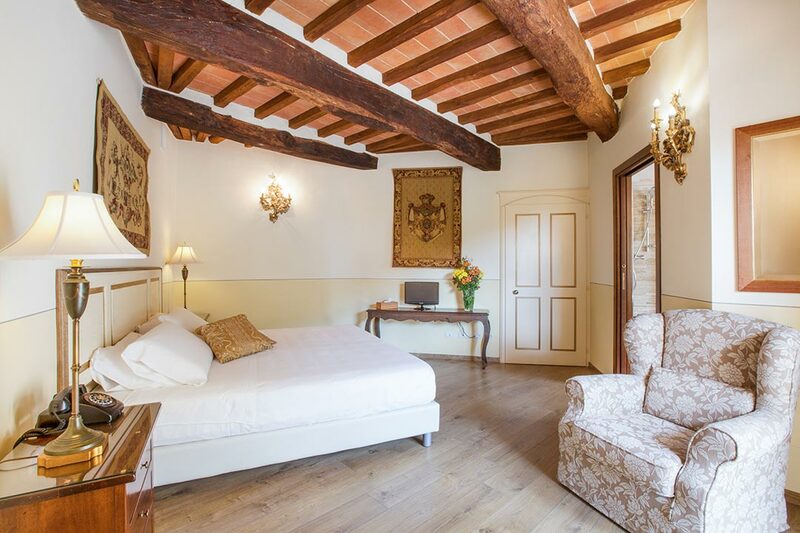 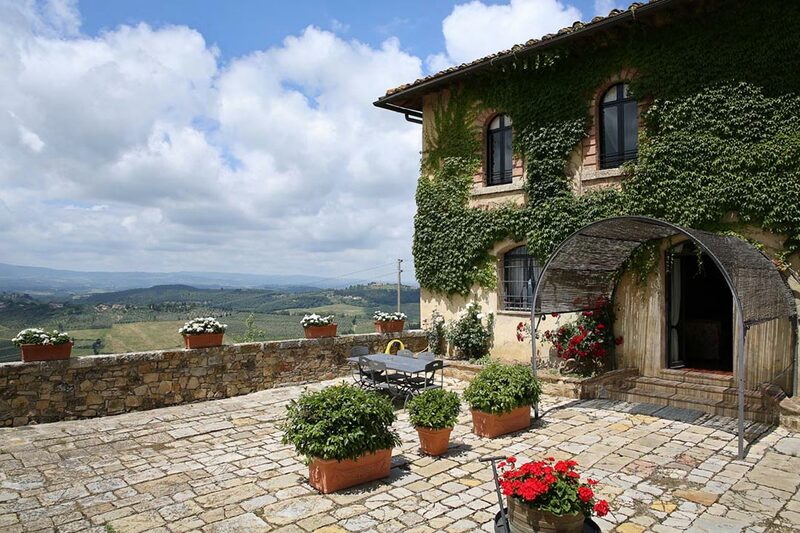 We will be happy to arrange accommodations for you and your guests during your stay in Italy. 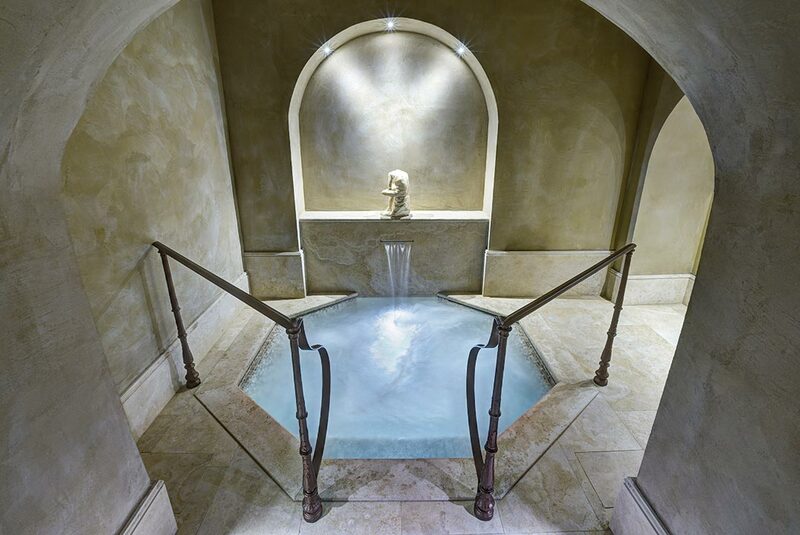 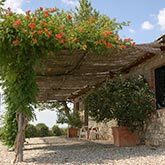 We have personally selected many of the area's best accommodations - hotels, farming estates, independent villas and more – and we would be happy to share those with you. 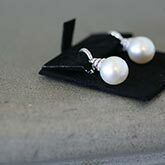 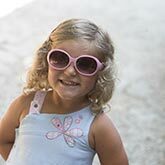 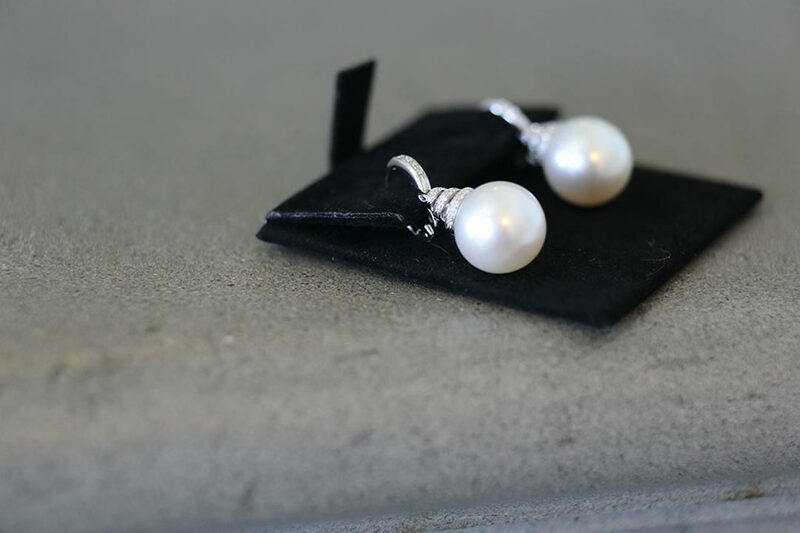 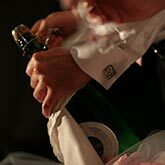 Since they have been hand picked by us, we can vouch for their quality and can answer any questions you have. 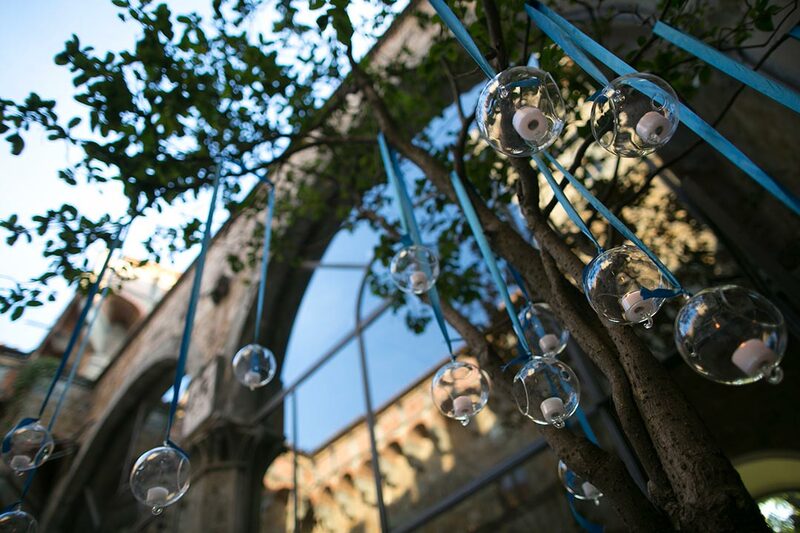 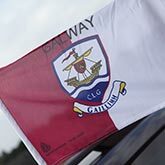 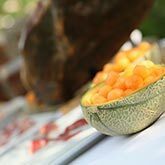 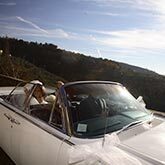 Please have a look at our venues page for some ideas of our favorite locations. 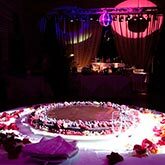 Your Special Happening will prepare an approximate budget according to the kind of ceremony and the number of services requested. 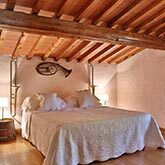 Upon request, the clients will also receive costs for accommodations as selected by them or chosen among those that are in Happening's rich portfolio. 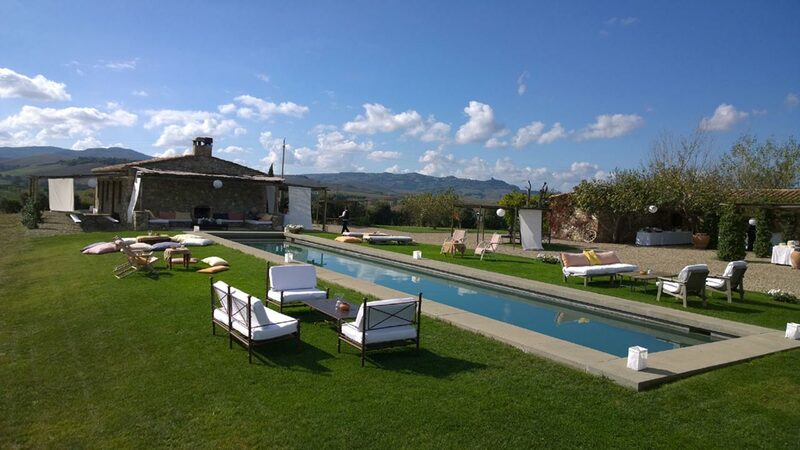 Once the clients have approved the budget, Happening will check the availability of the locations selected and, upon request, arrange an inspection visit. 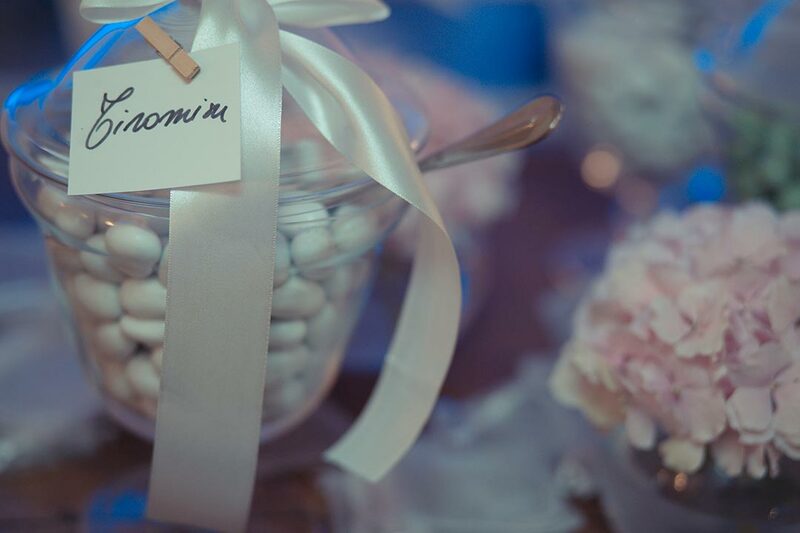 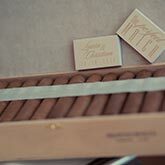 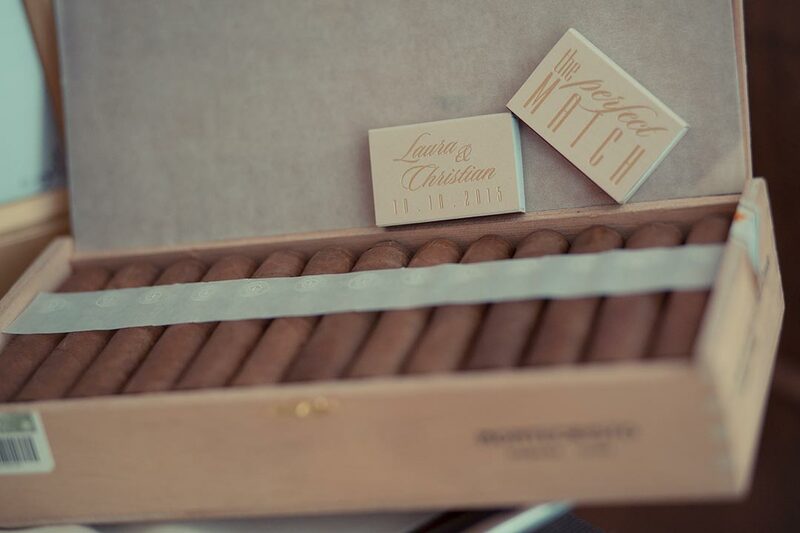 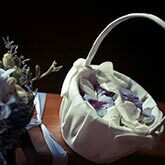 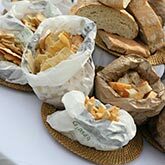 Your Special Happening does not sell “pre-packaged” weddings. 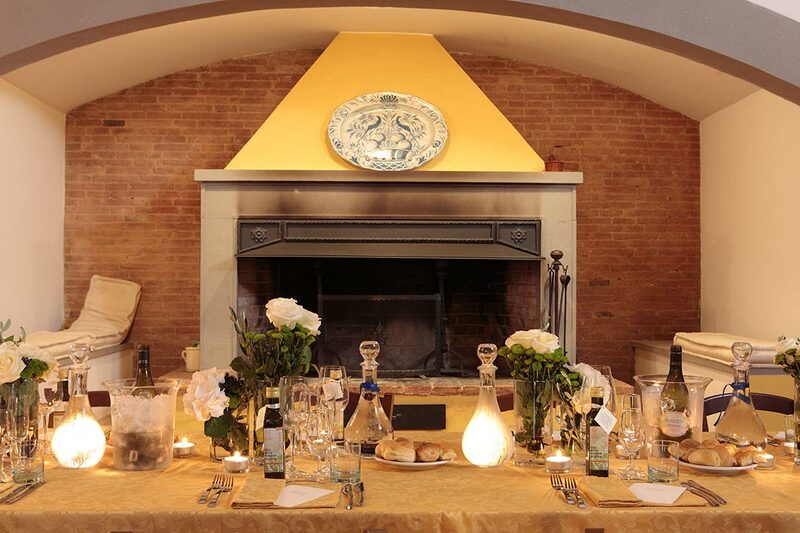 The final price depends mostly on the number of guests and services booked. 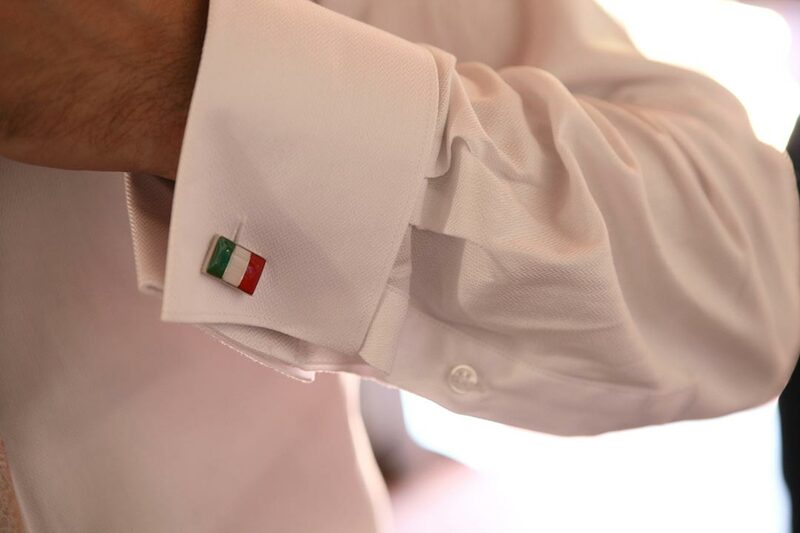 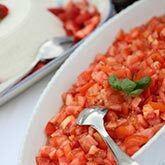 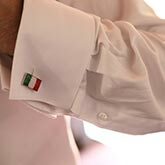 Your Special Happening is a legally recognized Italian company. 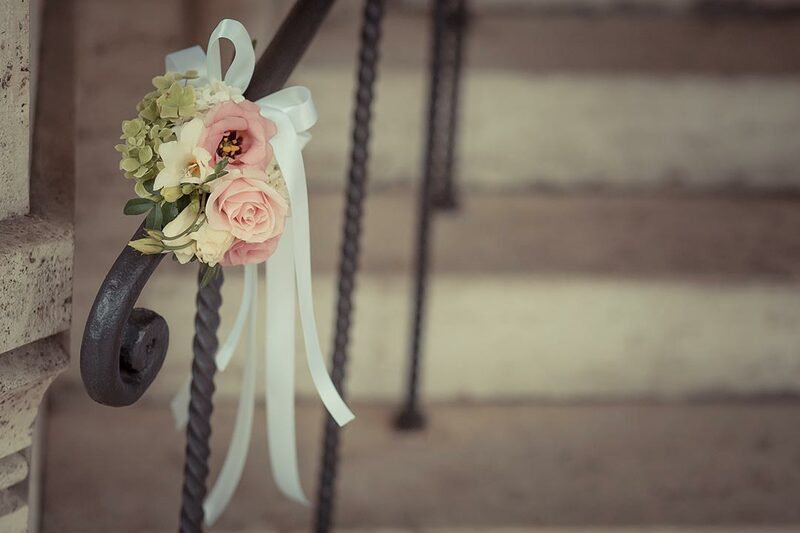 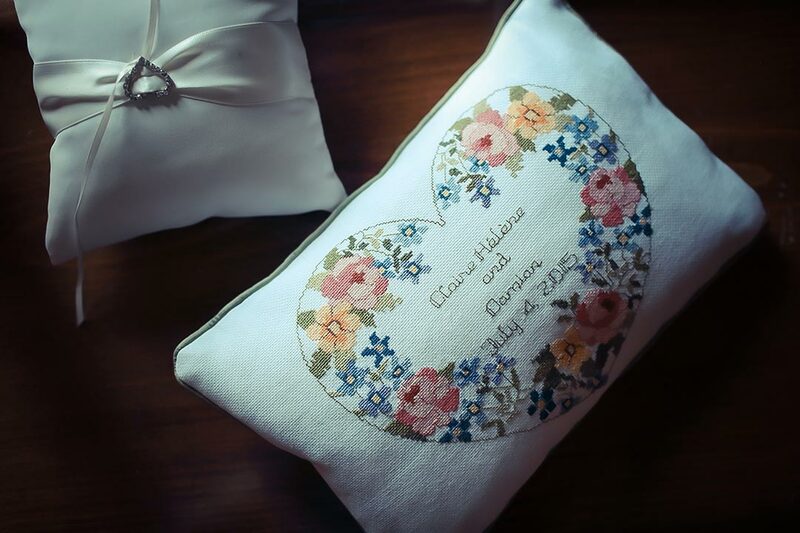 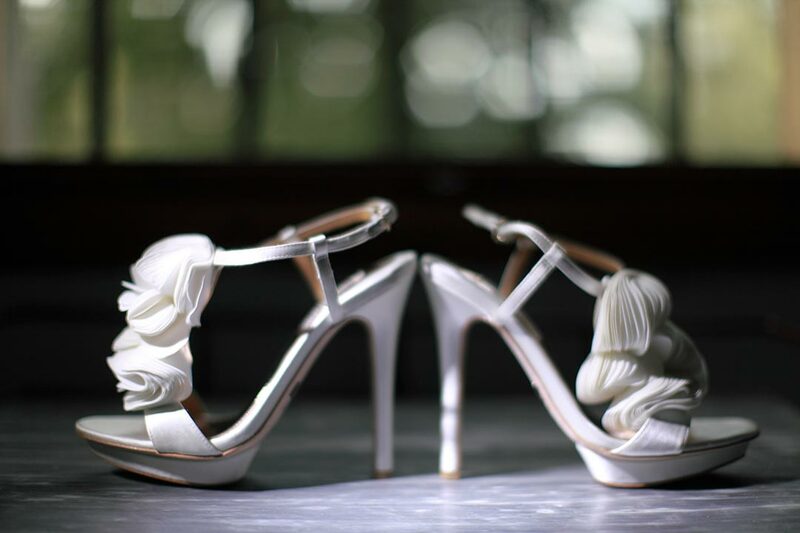 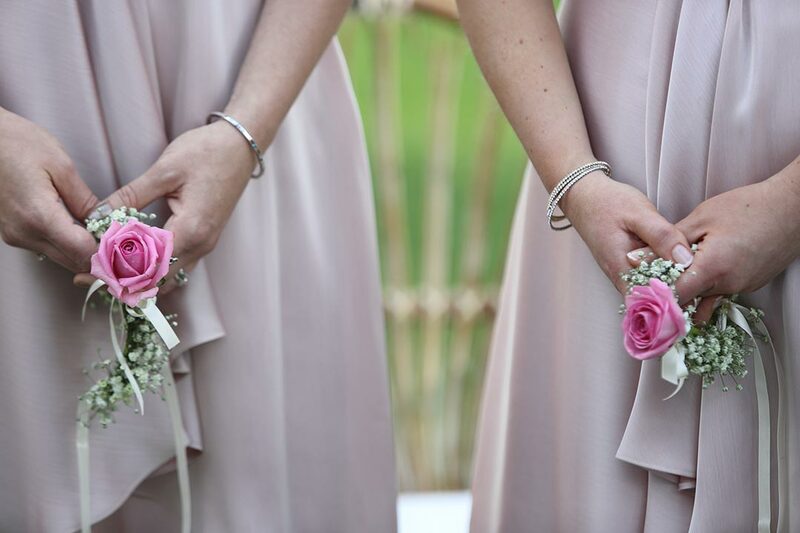 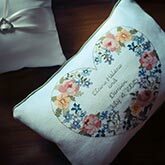 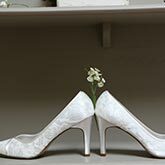 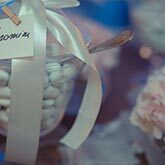 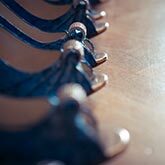 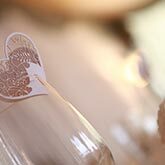 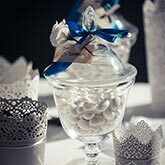 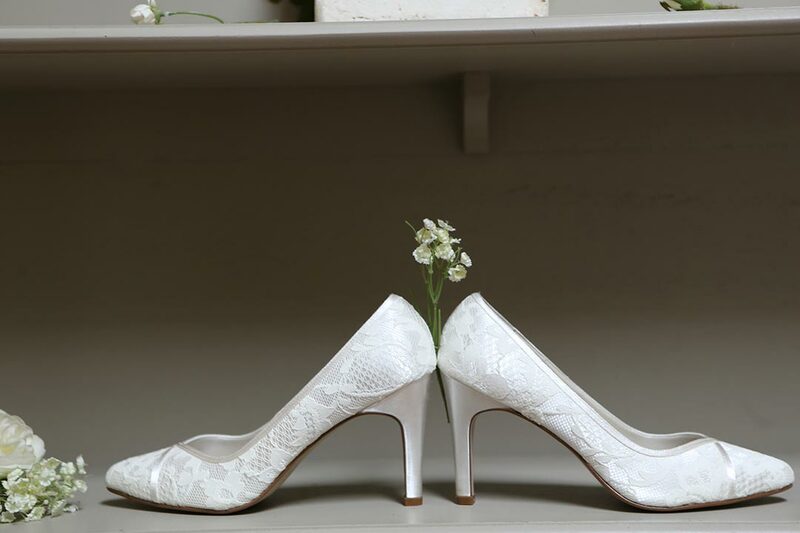 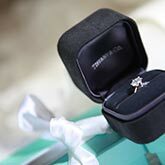 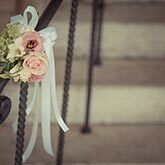 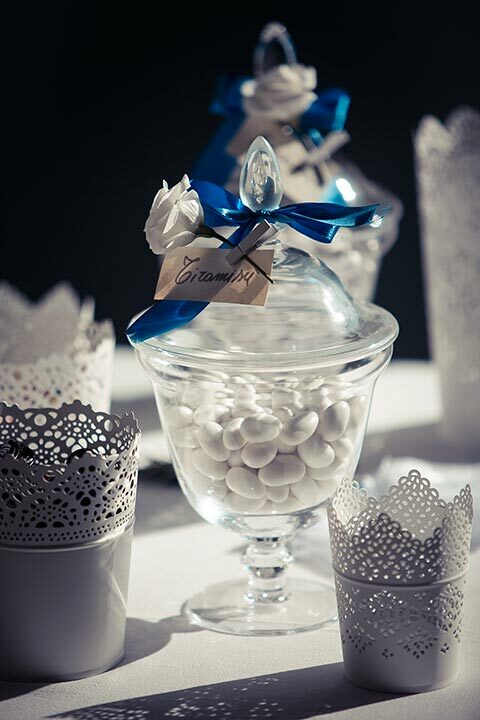 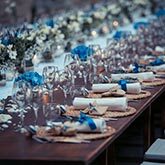 Upon confirmation, clients will be required to sign a legal contract where Your Special Happening undertakes the responsibility to assist the clients with their wedding plans and to be present the day of the wedding. 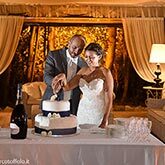 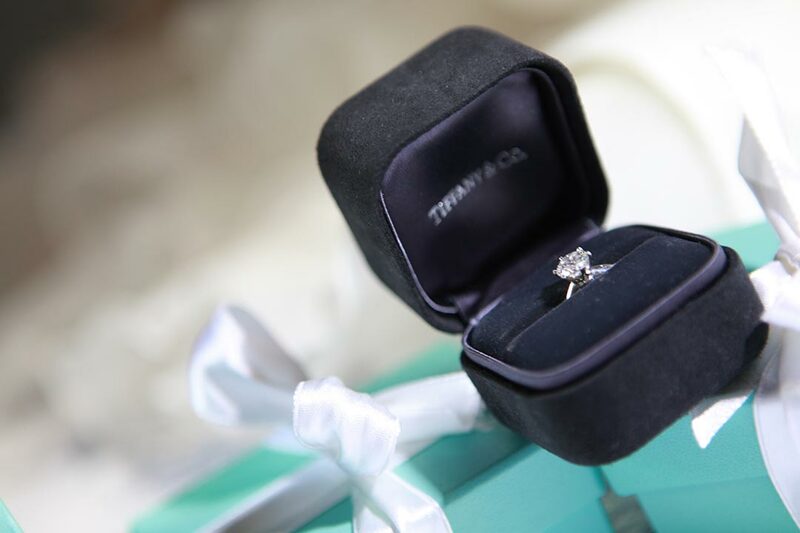 At the same time that the contract is signed, Your Special Happening requires a deposit to secure and guarantee the booked services. 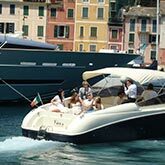 The remaining payments can be made by credit card or by bank transfer in two or three deposits, depending on the total budget amount. 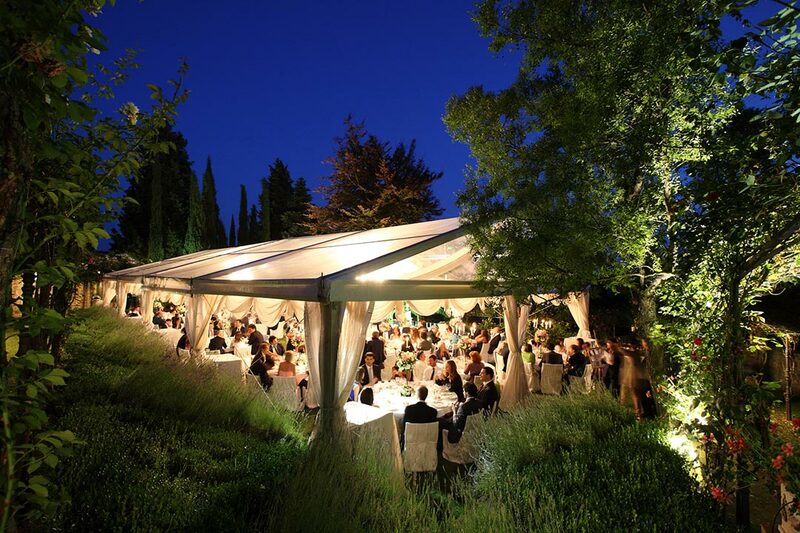 For us, details are very important... they demonstrate the high quality of the services we offer. 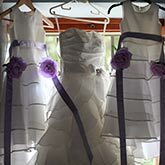 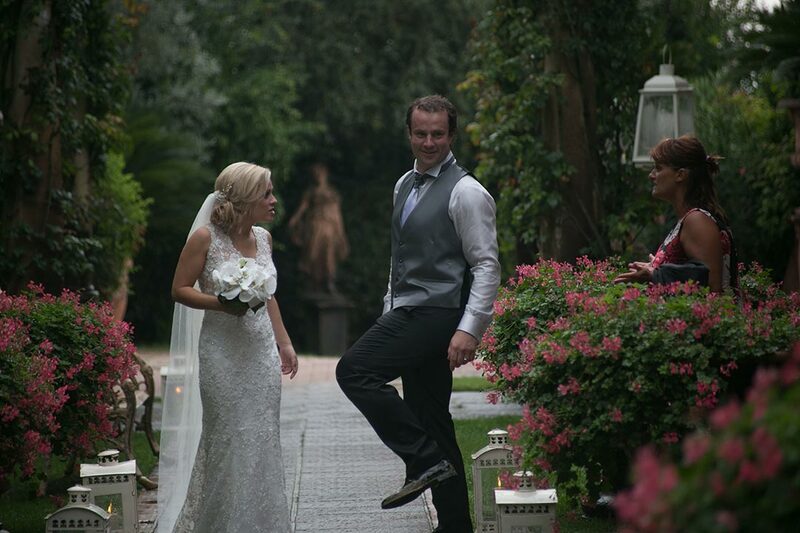 I personally take care in checking that each minute detail of your wedding is absolute perfection. 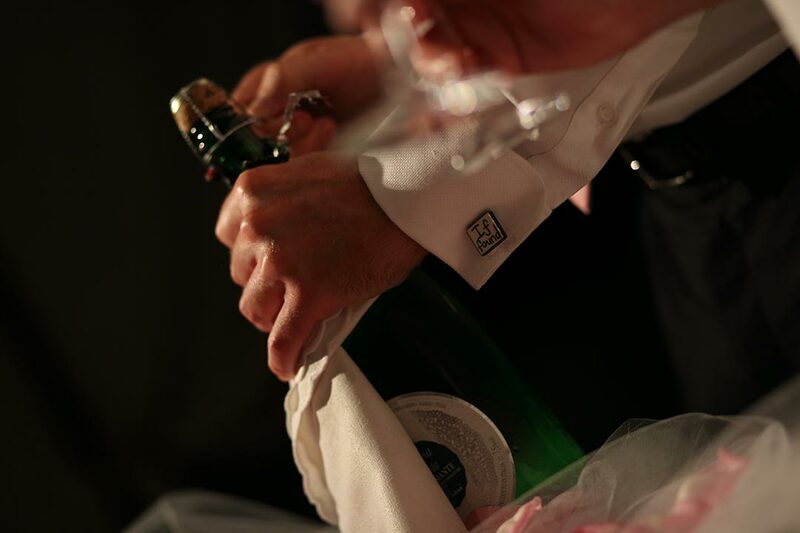 This is the key to the success of the event. 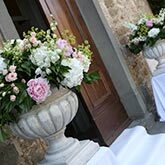 Together with our trusted floral designers, I will assist you in finding the right flower scheme for your ceremony and reception. 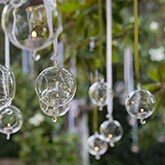 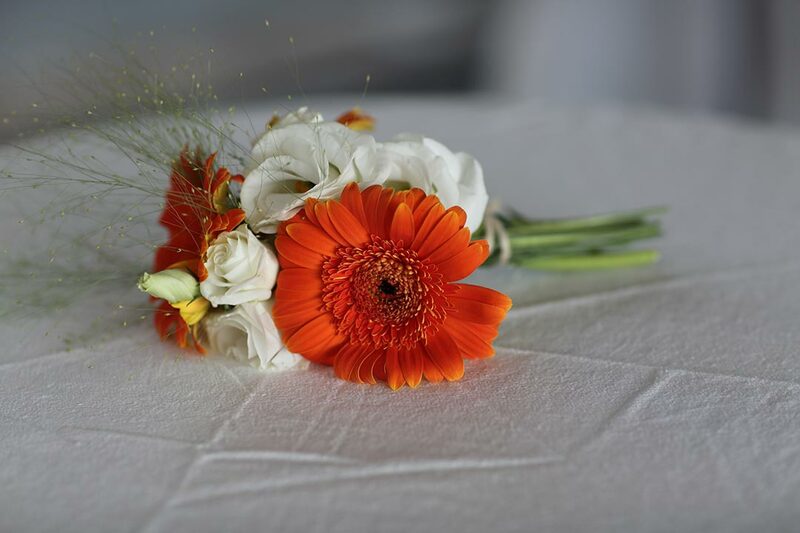 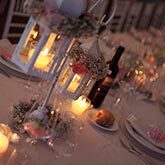 Choosing the flowers is a fun and exciting experience and you can immediately begin gathering ideas by browsing our photo gallery of centrepieces, compositions and venue decorations. 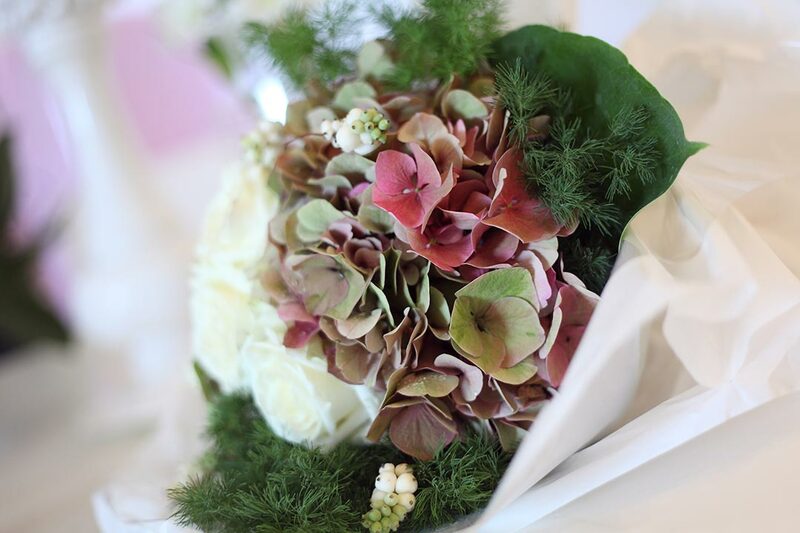 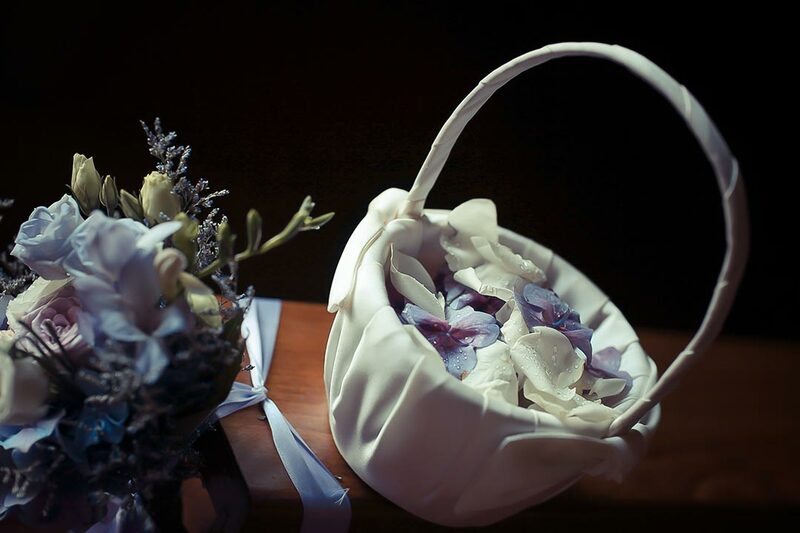 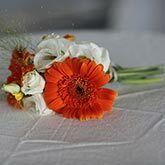 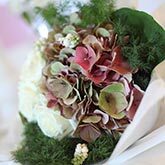 The bridal bouquet must be in line with the style of the wedding gown but most importantly, it must reflect the taste and the style of the bride. 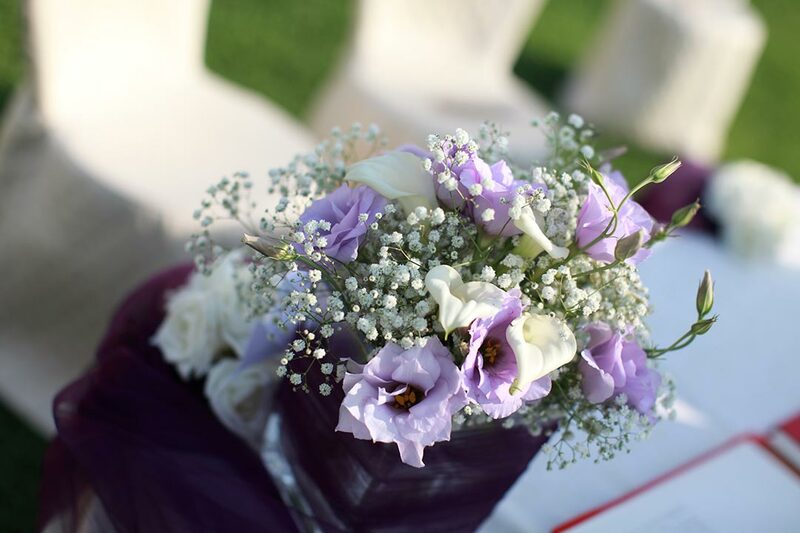 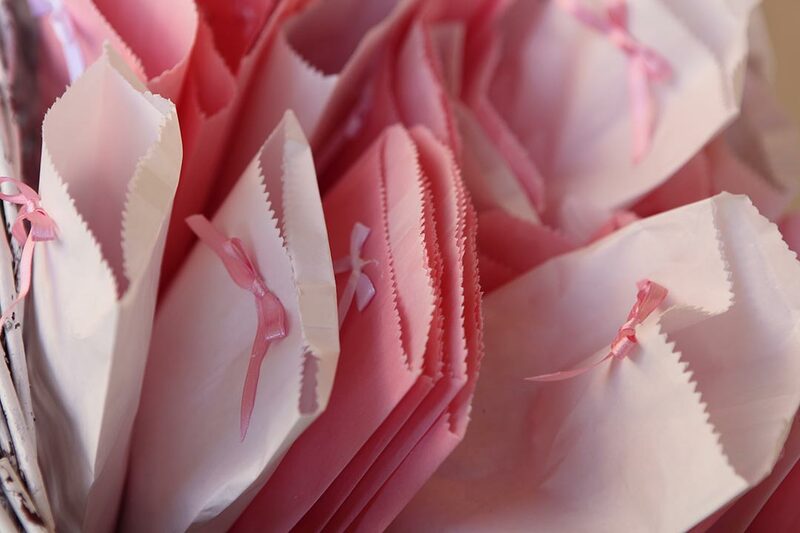 "At the end of the ceremony the bride will toss the bouquet. 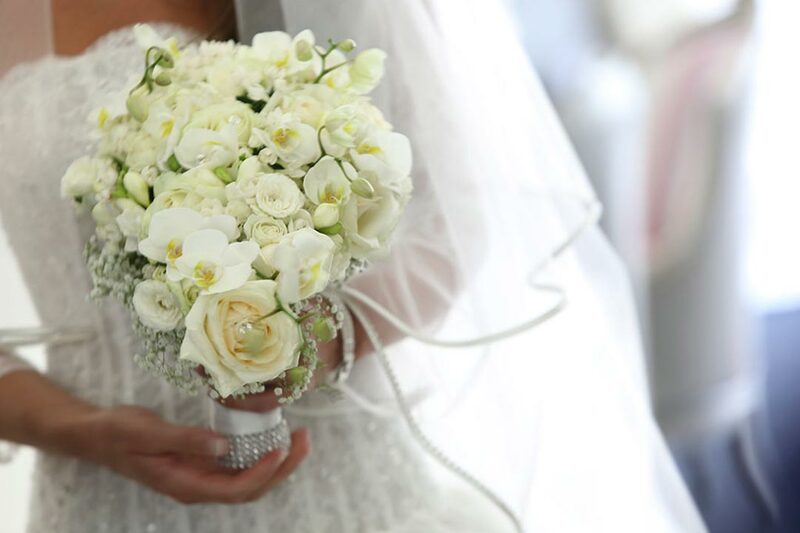 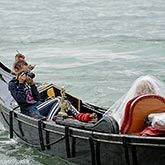 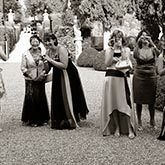 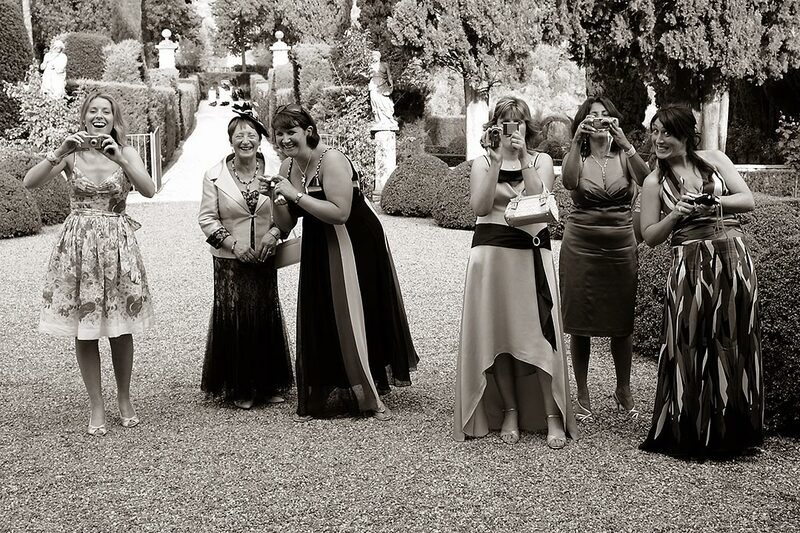 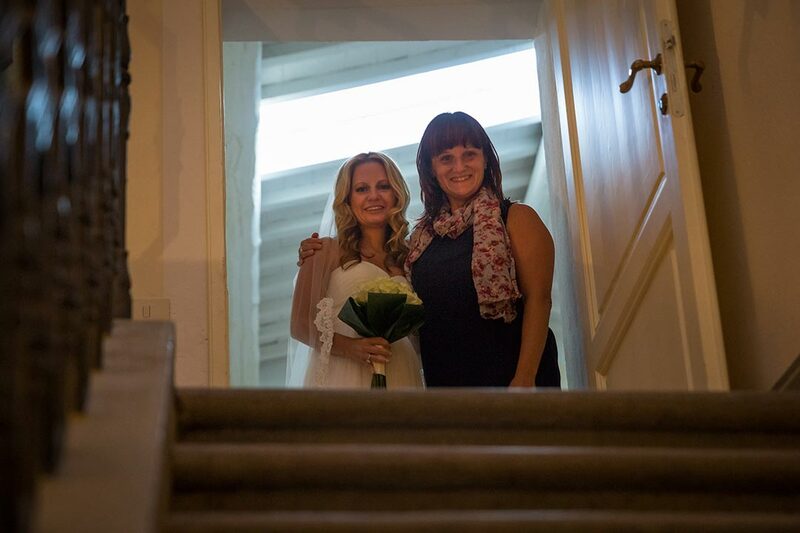 The single woman who catches the bouquet is believed to be the next to marry!" 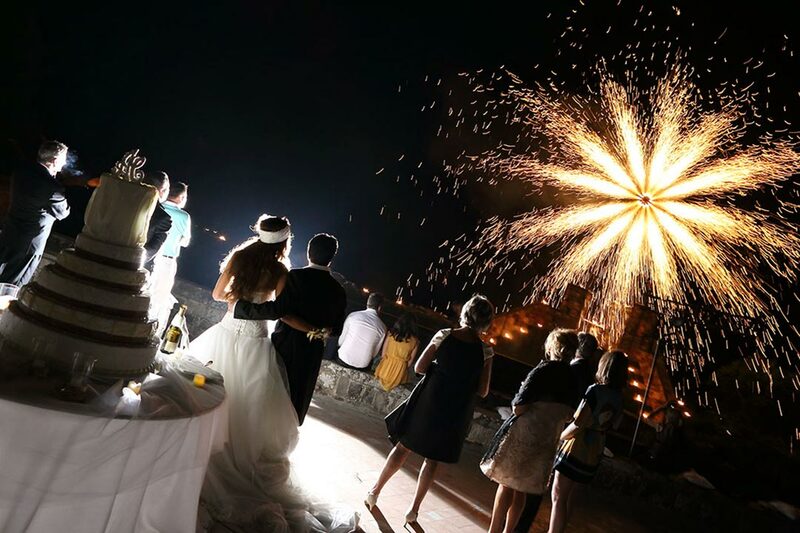 A destination wedding is also the perfect occasion for family and friends to gather together and reunite. 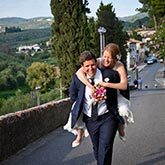 It offers a good chance for everyone to spend quality time together not only on the wedding day but also during the rest of your stay. 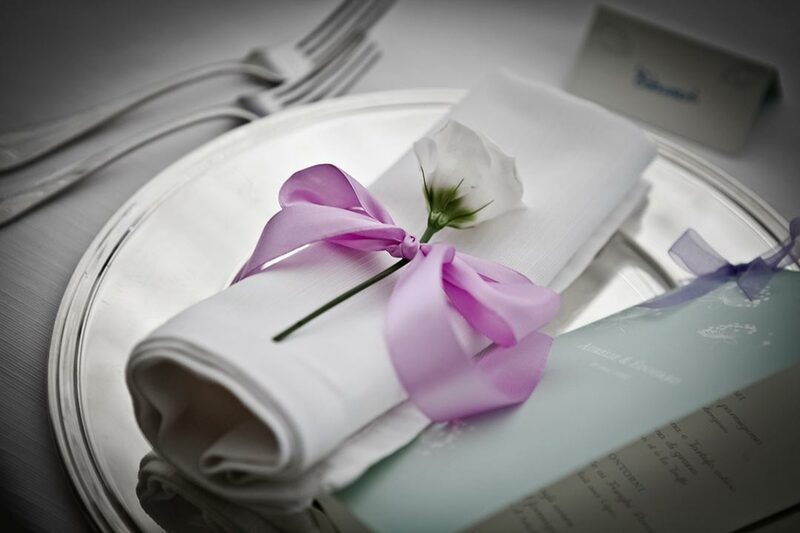 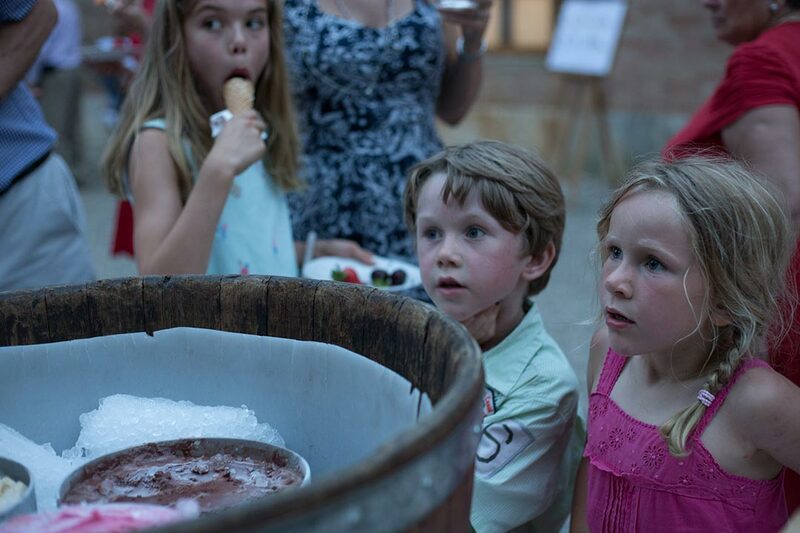 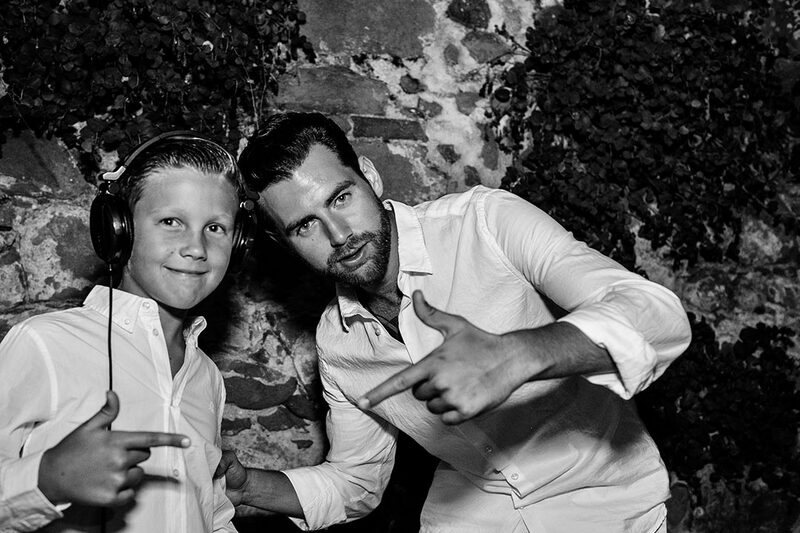 We would be happy to assist in arranging the activities and events of your choice during your time together. 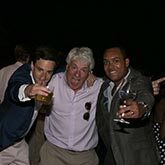 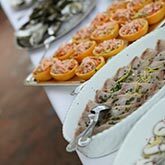 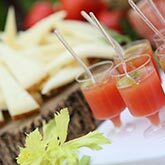 These can include but are not limited to a welcome cocktail party, the rehearsal dinner, bridesmaids and grooms men outings, excursions for guests, brunch the day after the wedding, personal chef service for home made meals prepared with the freshest local ingredients... 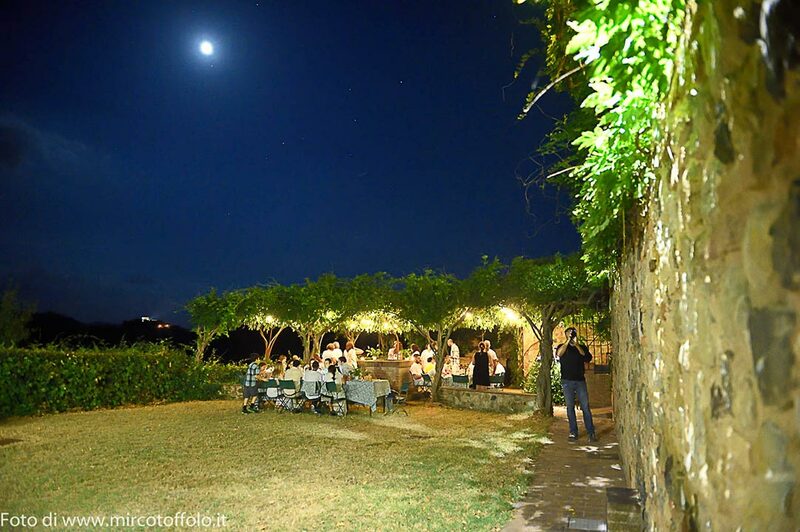 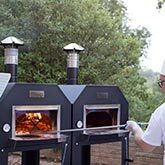 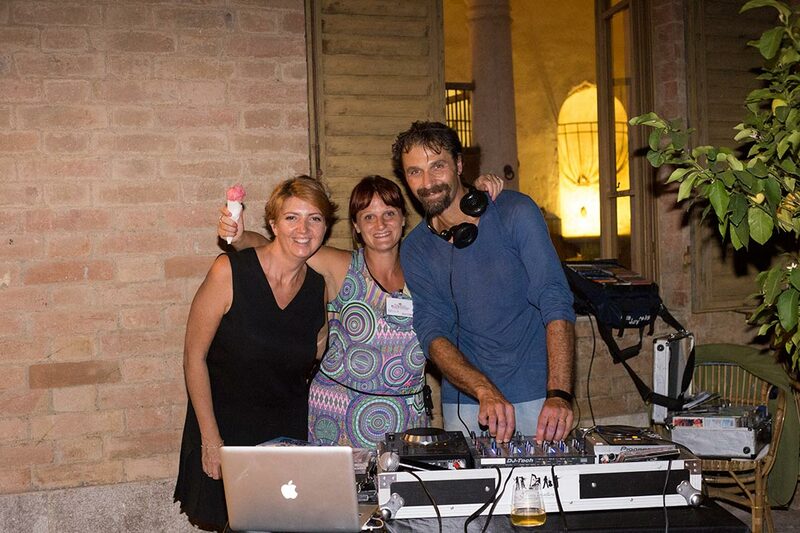 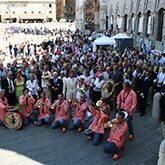 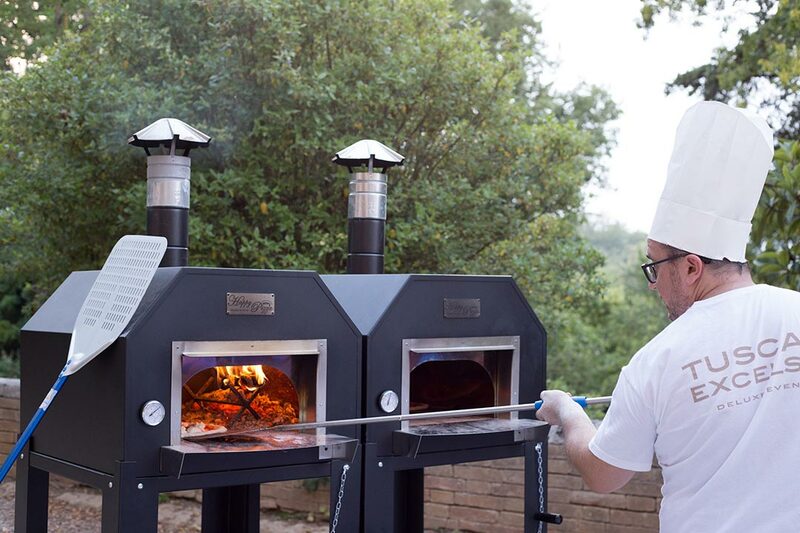 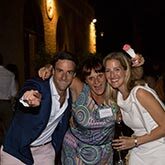 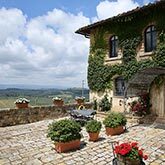 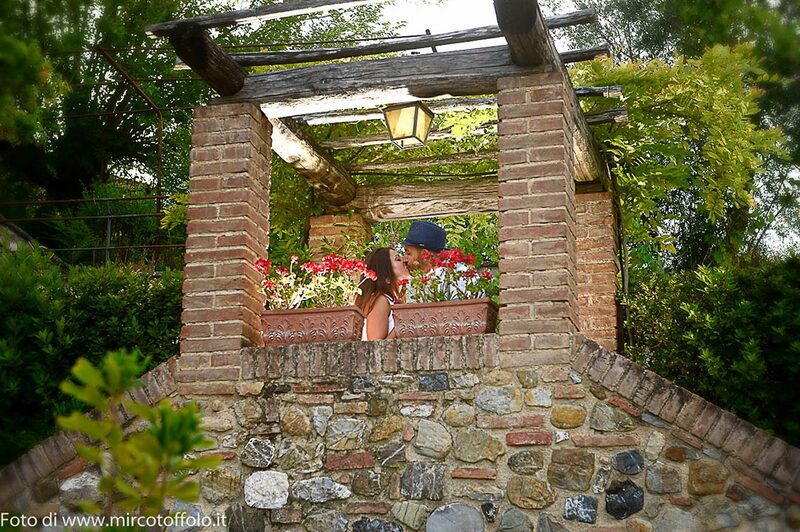 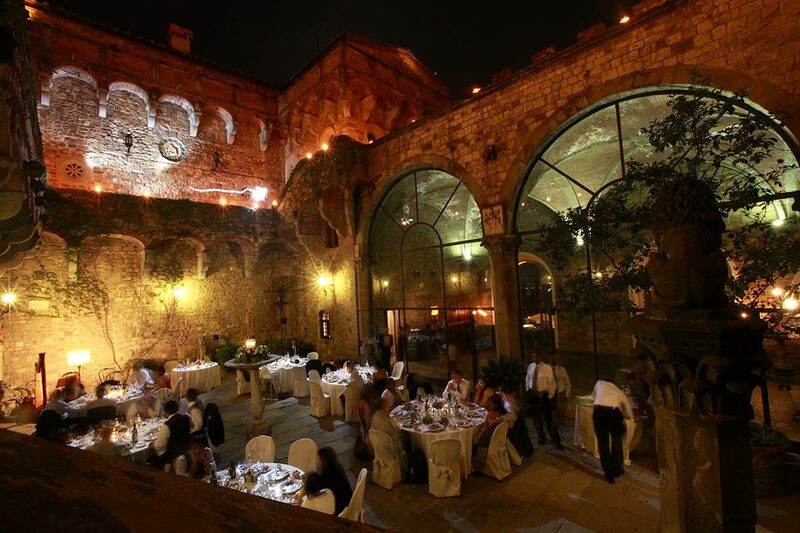 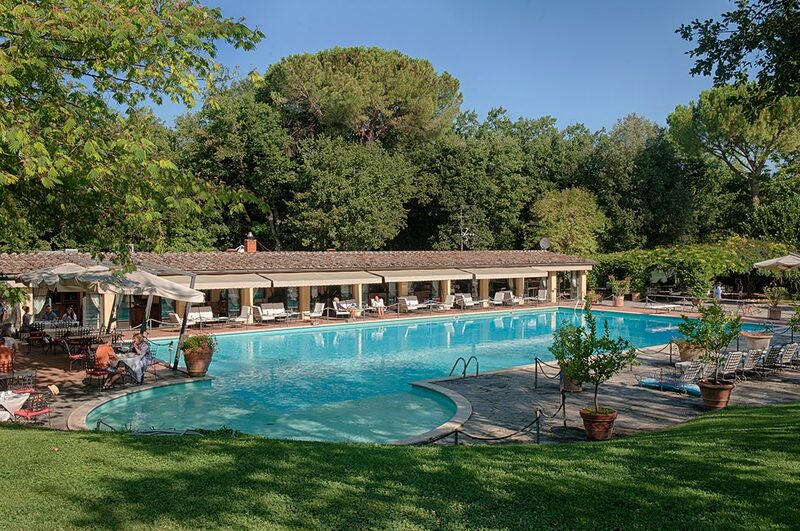 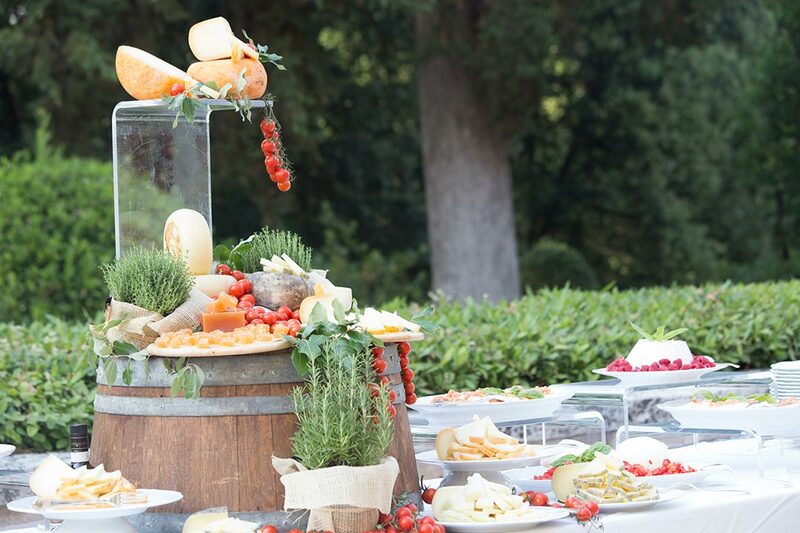 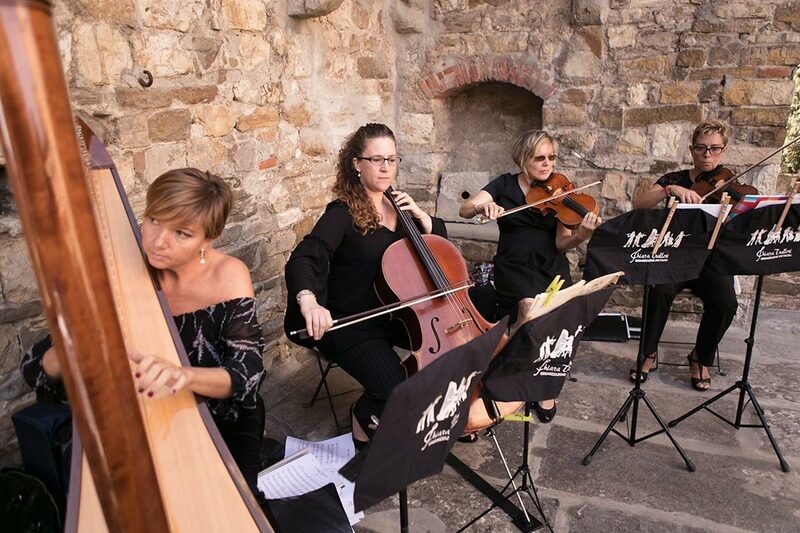 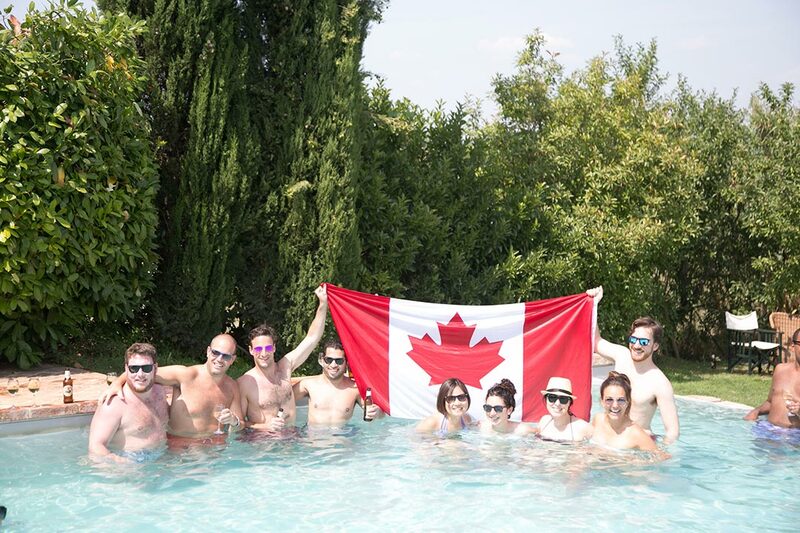 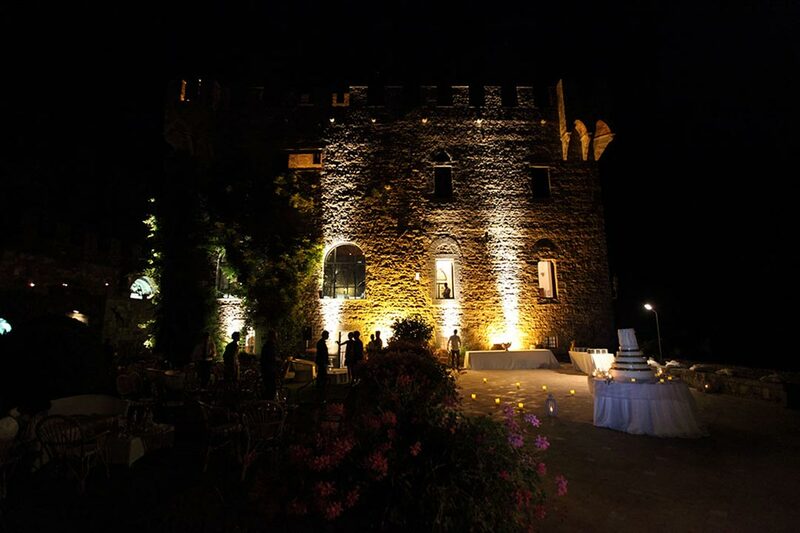 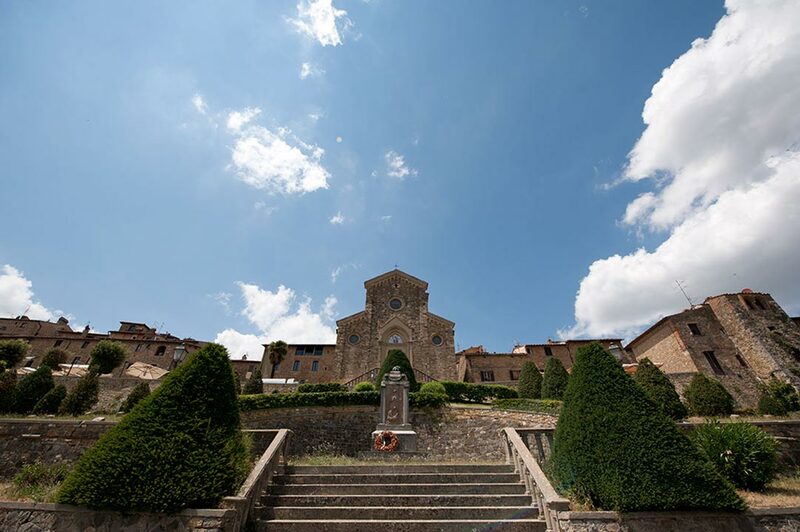 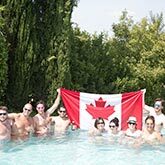 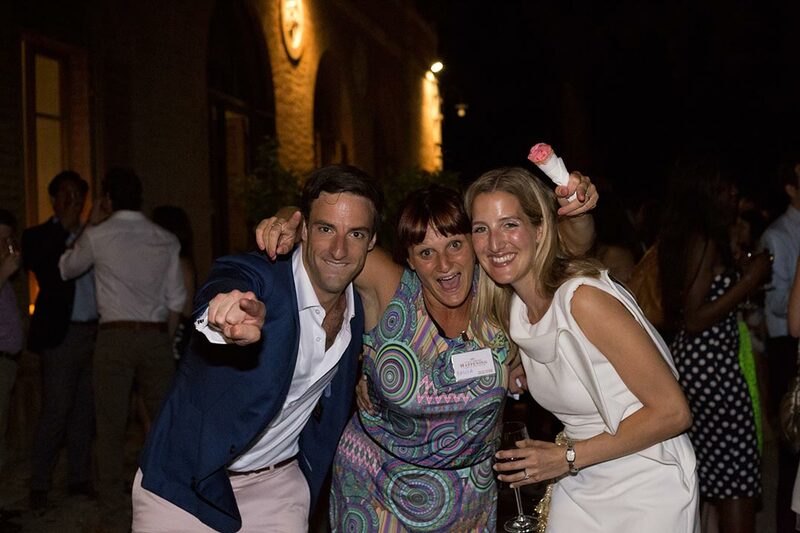 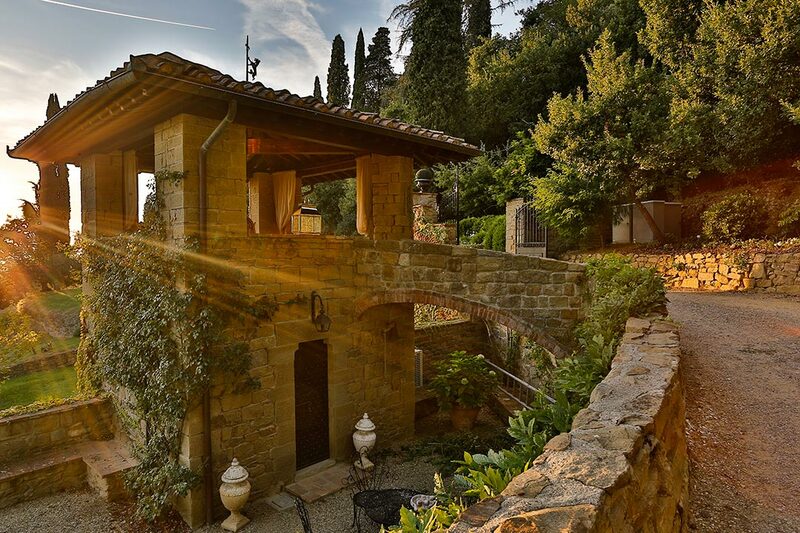 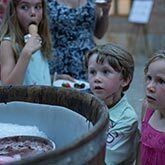 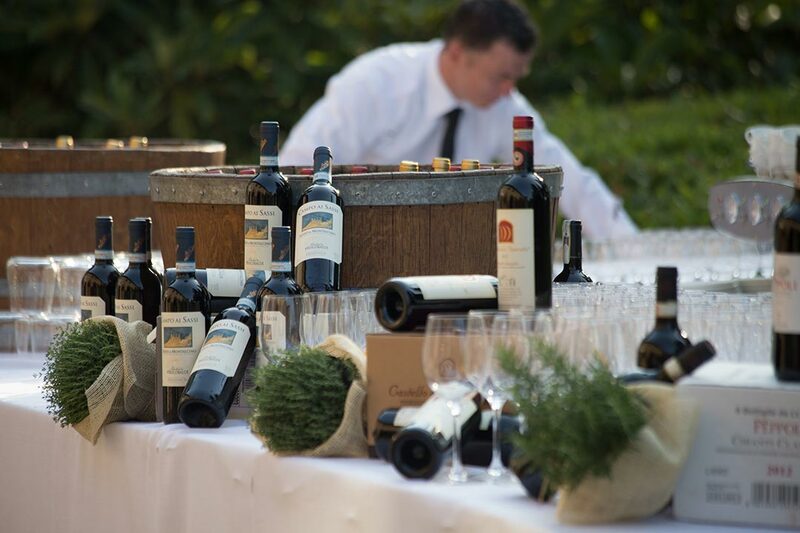 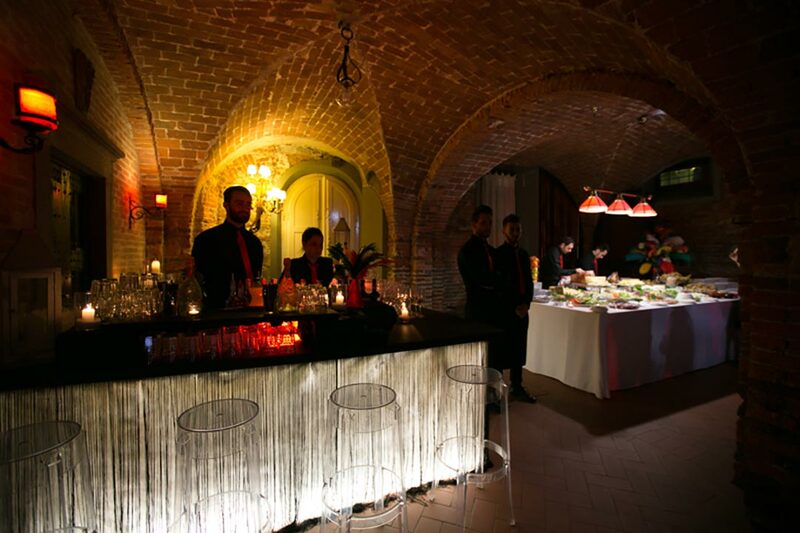 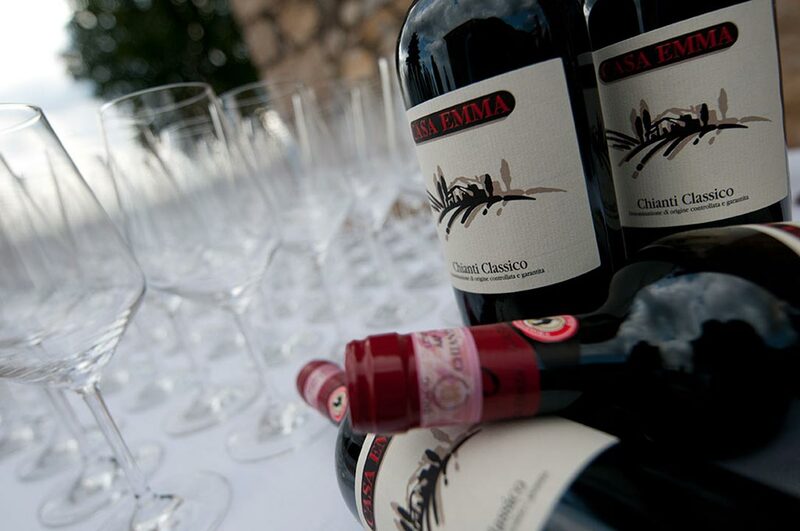 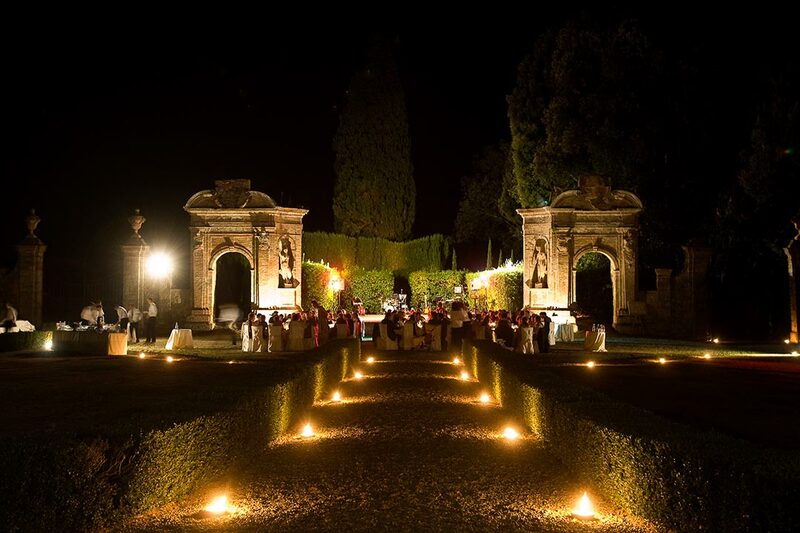 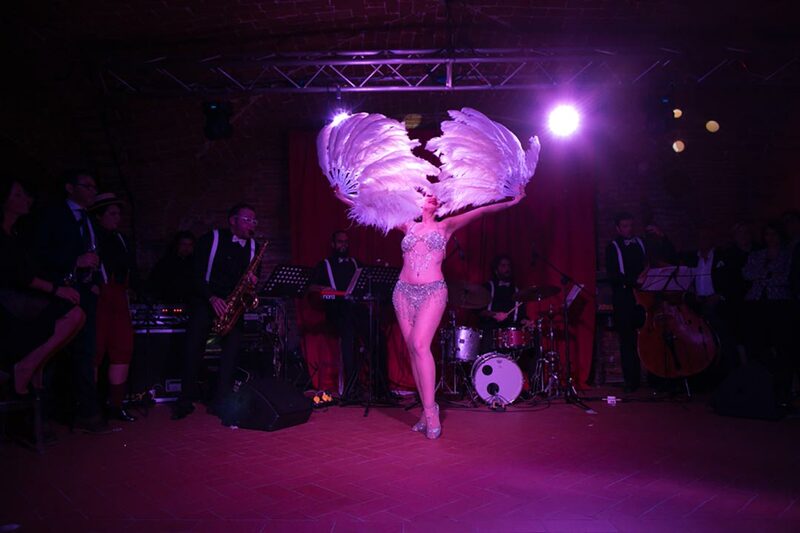 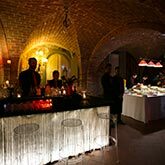 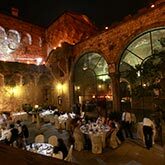 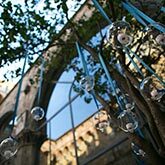 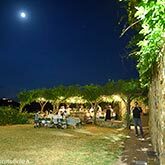 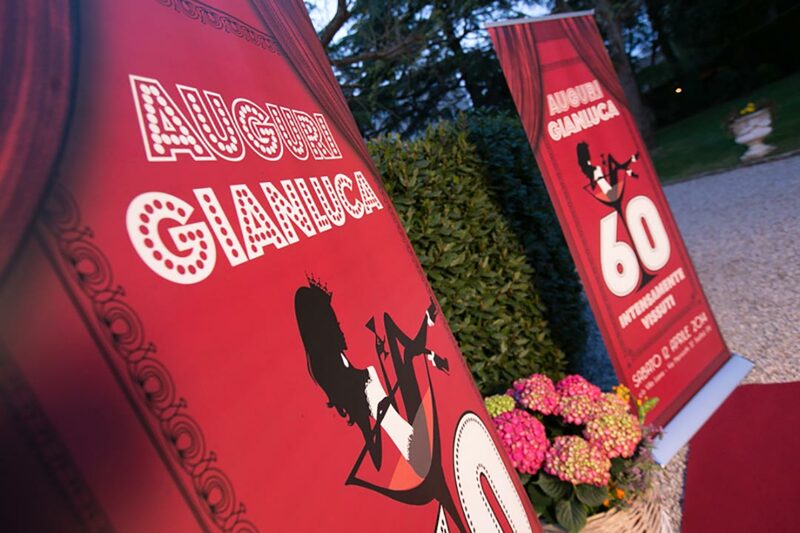 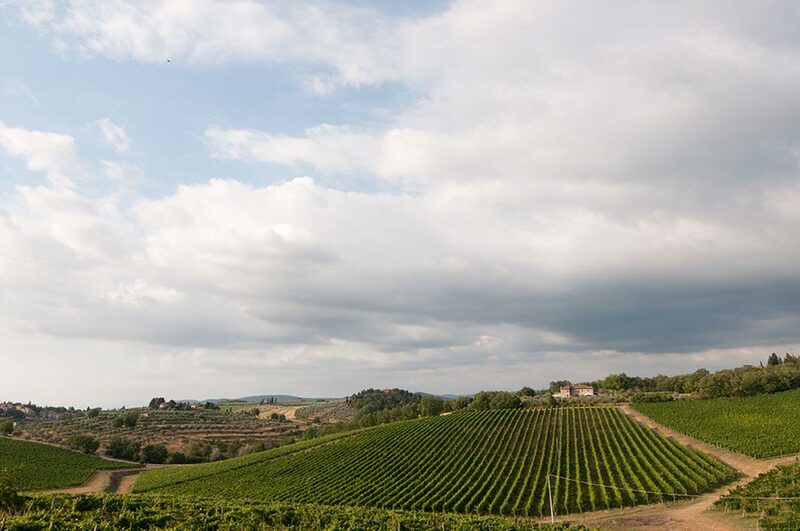 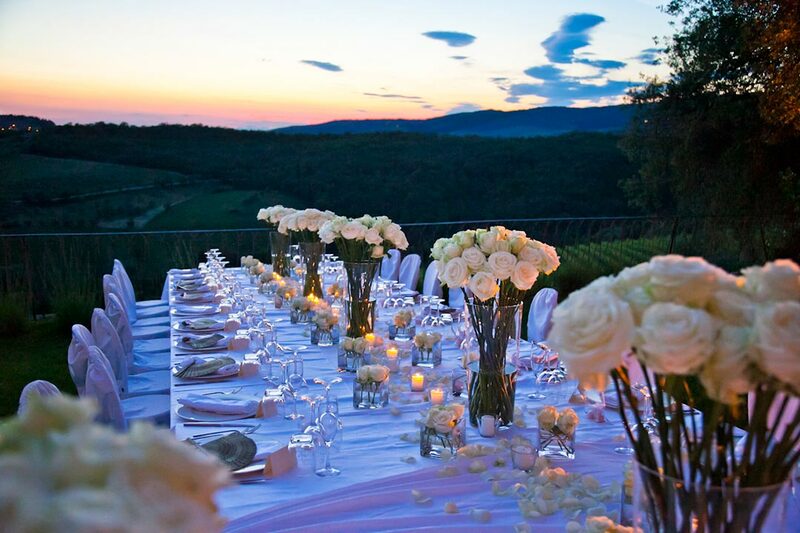 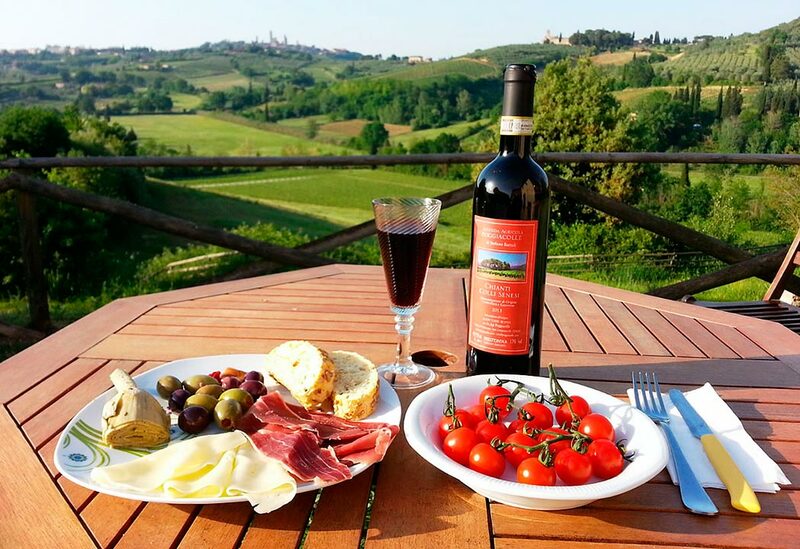 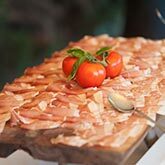 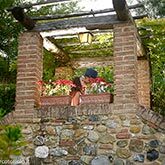 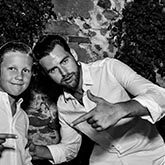 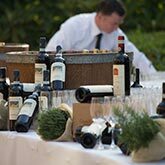 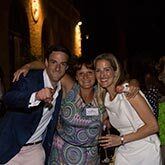 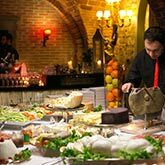 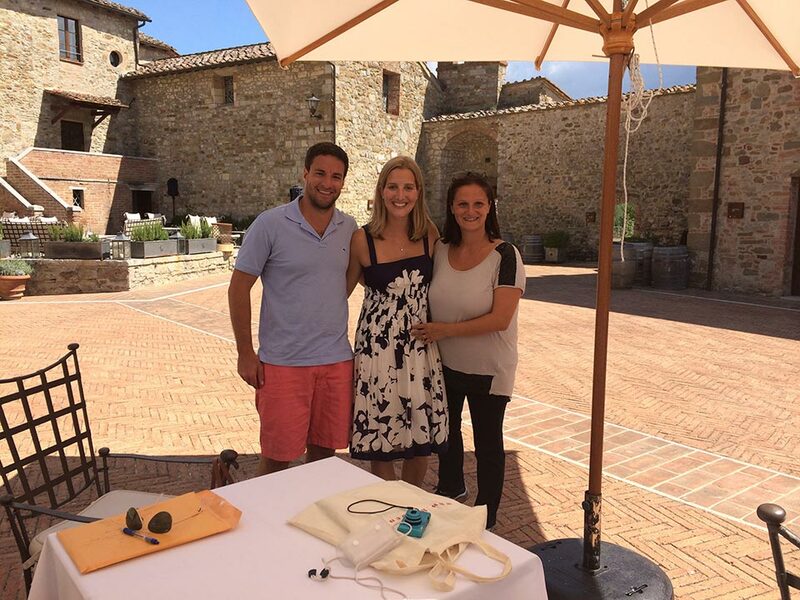 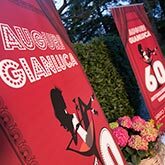 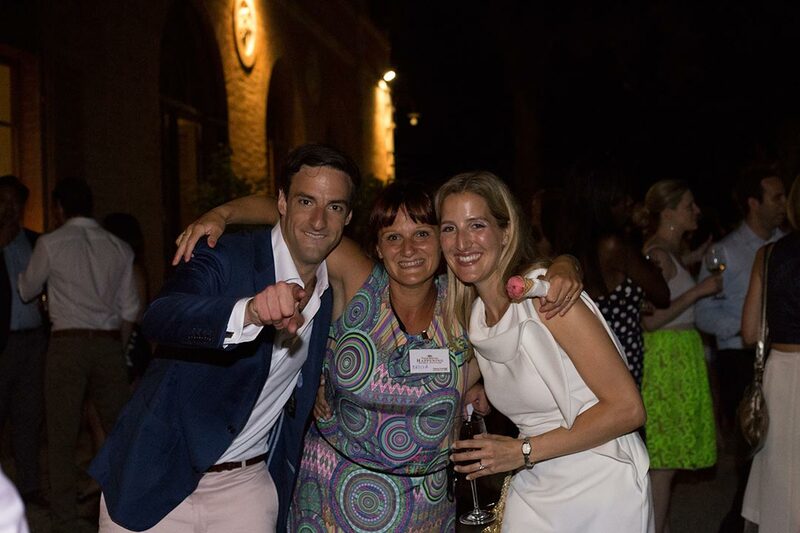 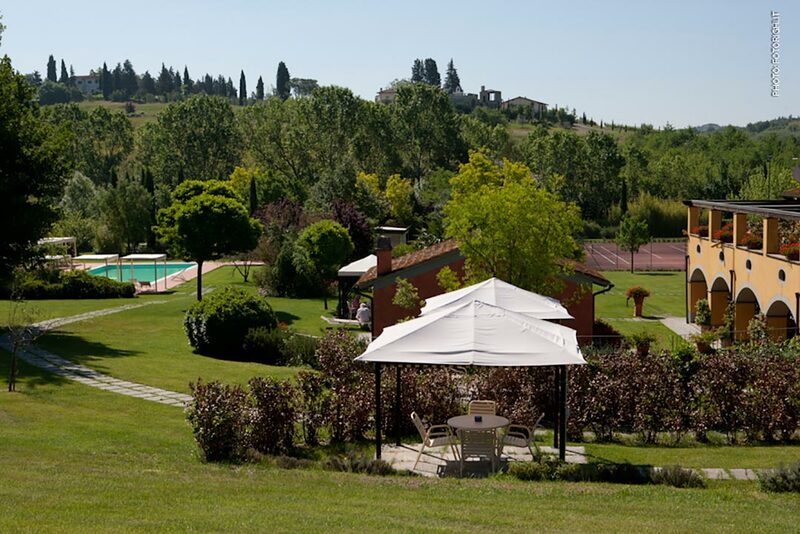 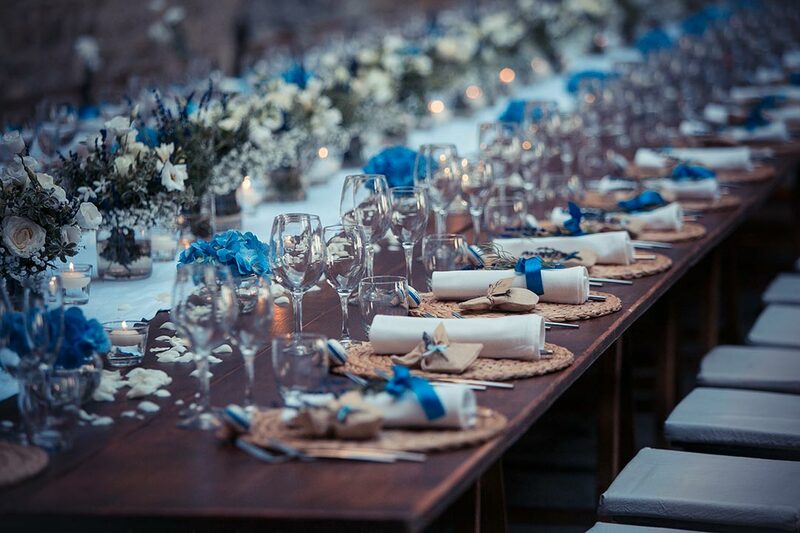 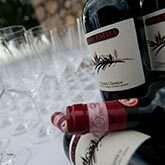 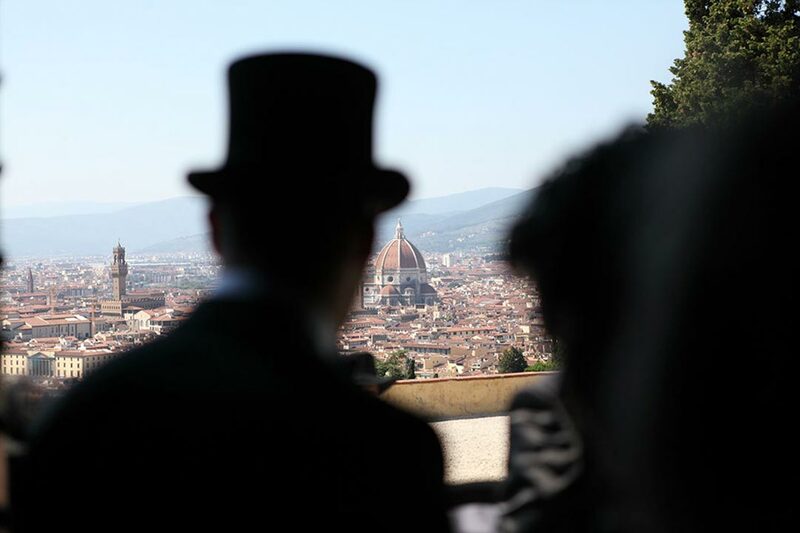 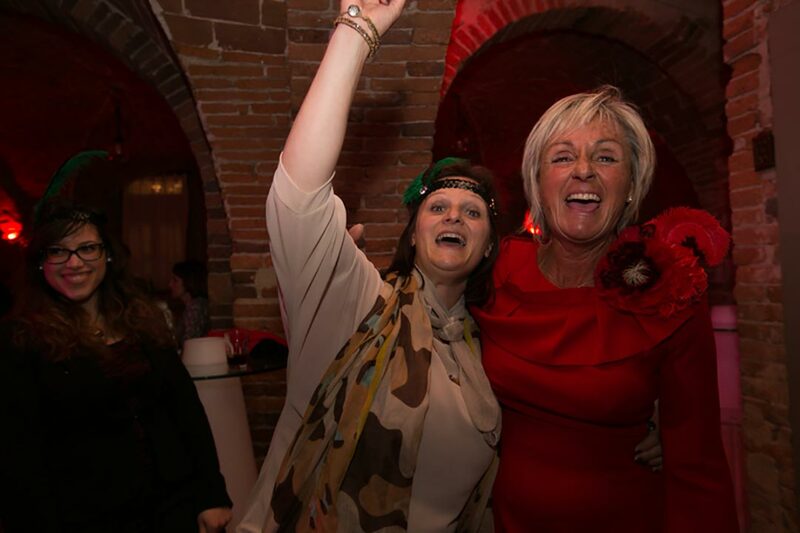 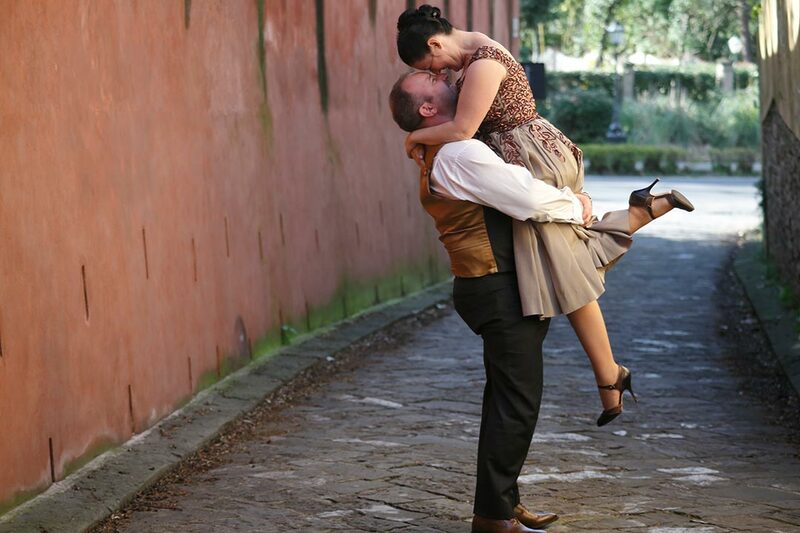 These are just some of the ideas of possible events that will enrich your stay in beautiful Tuscany, becoming part of the most unforgettable memories of your life. 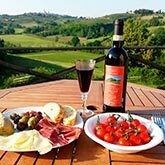 Italy is famous for its elegant restaurants, charming villas, noble palaces, intimate inns and above all, for its excellent food and wines. 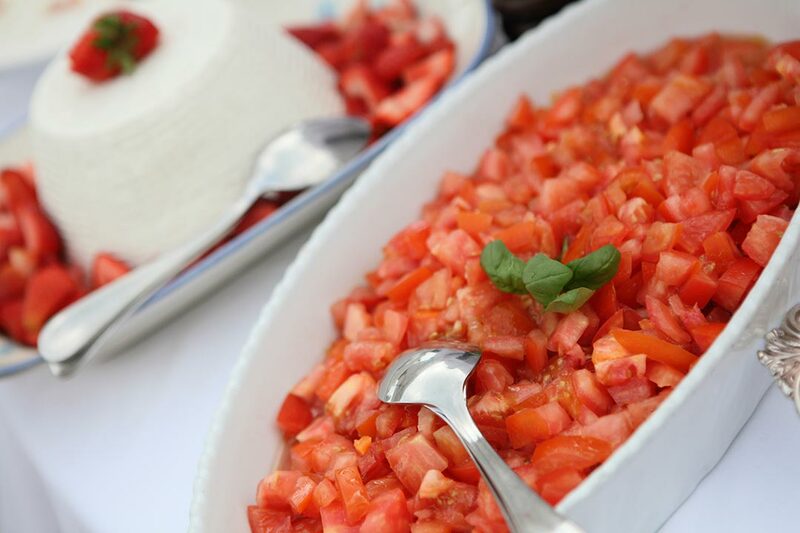 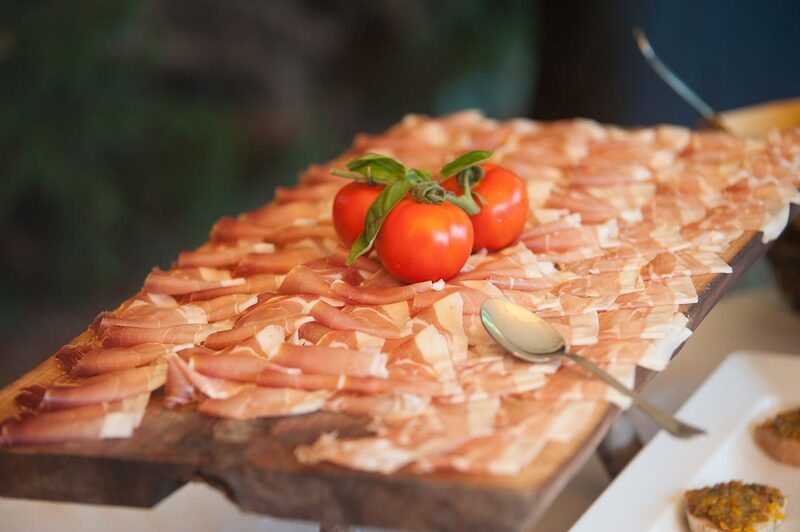 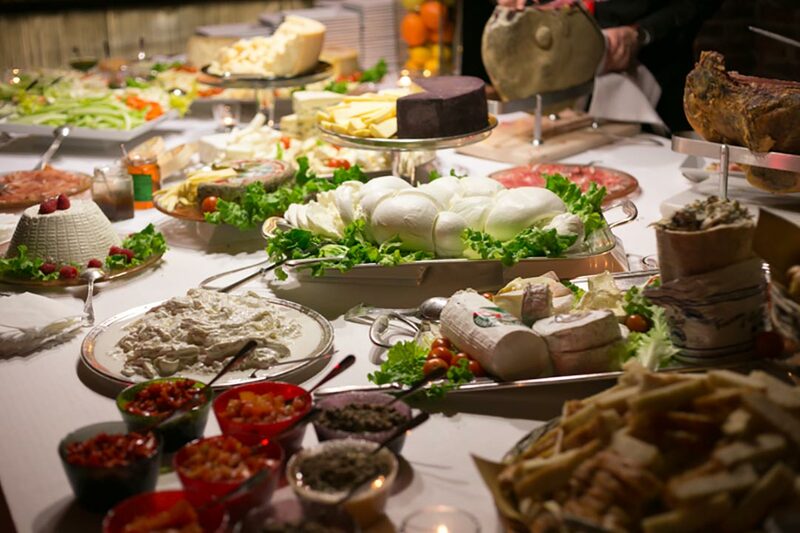 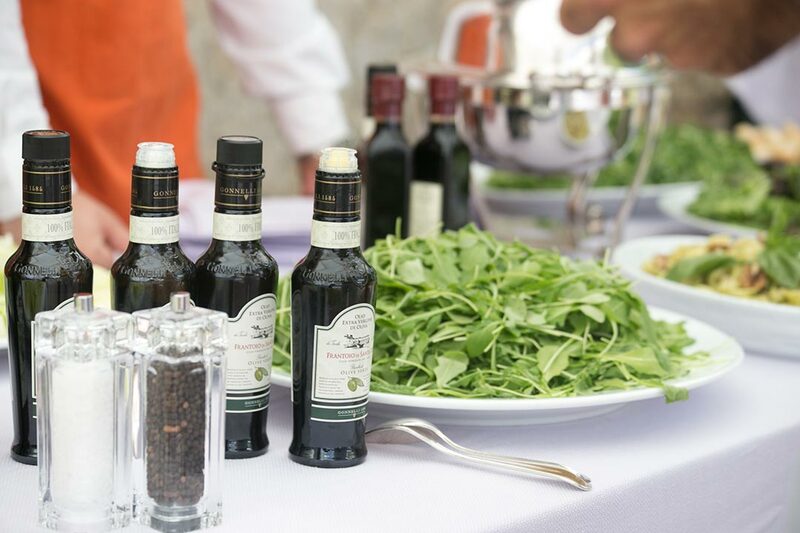 Guests of Italy tend to have high culinary expectations, and rightly so. 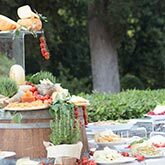 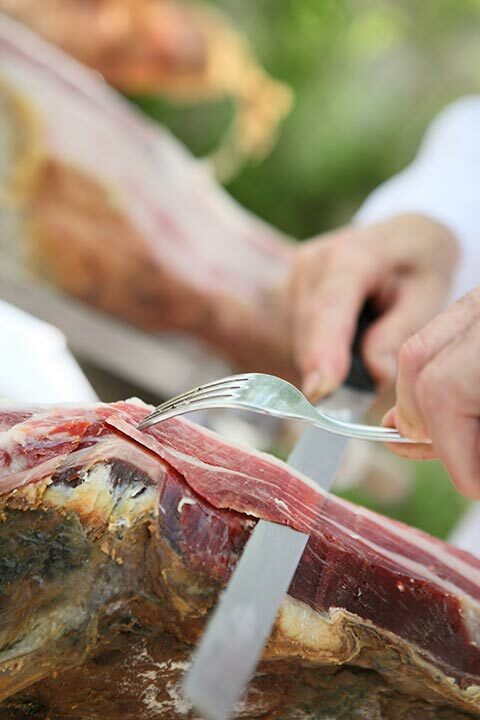 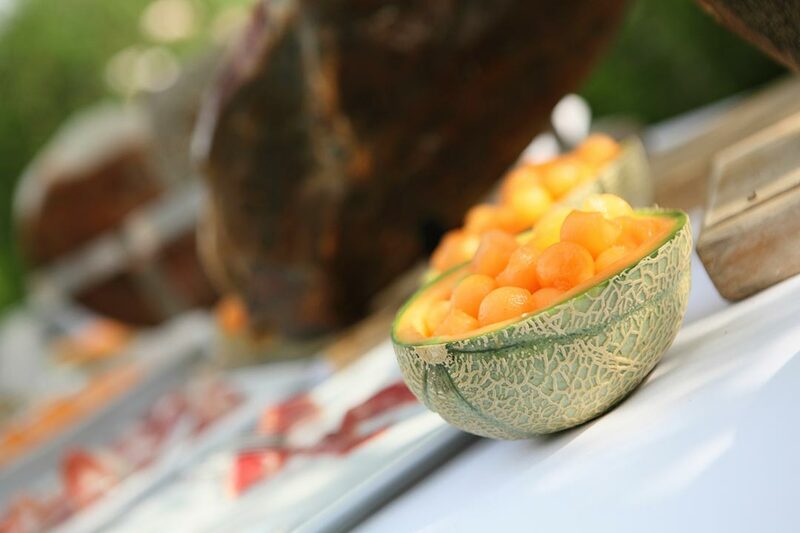 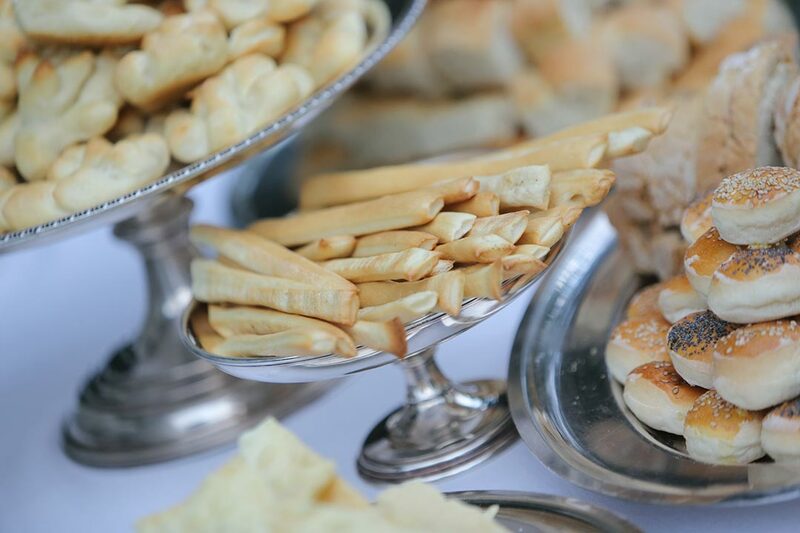 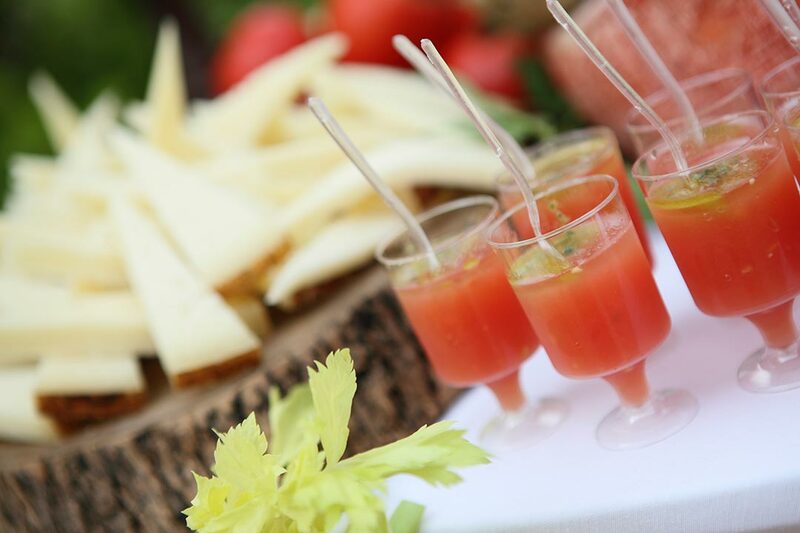 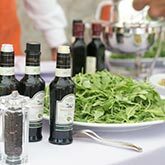 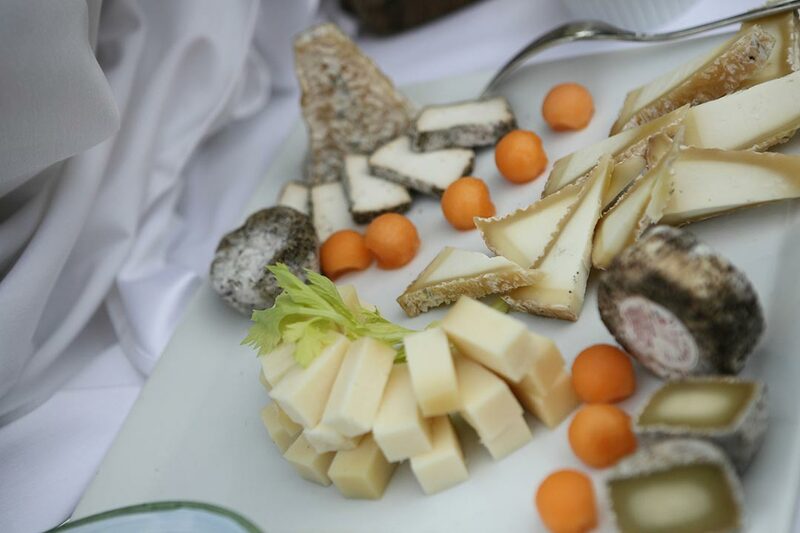 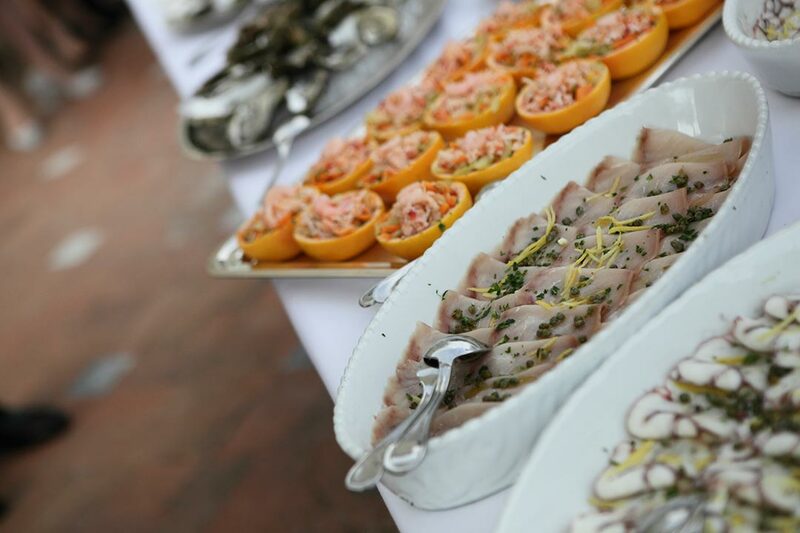 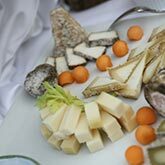 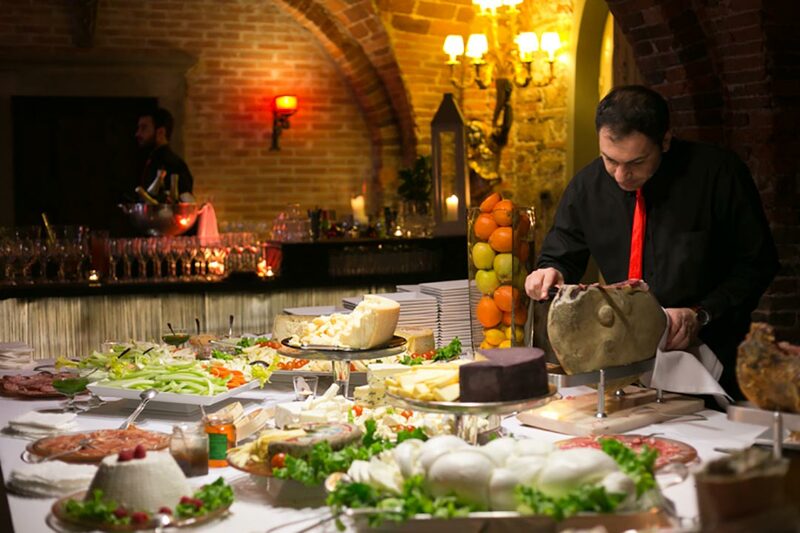 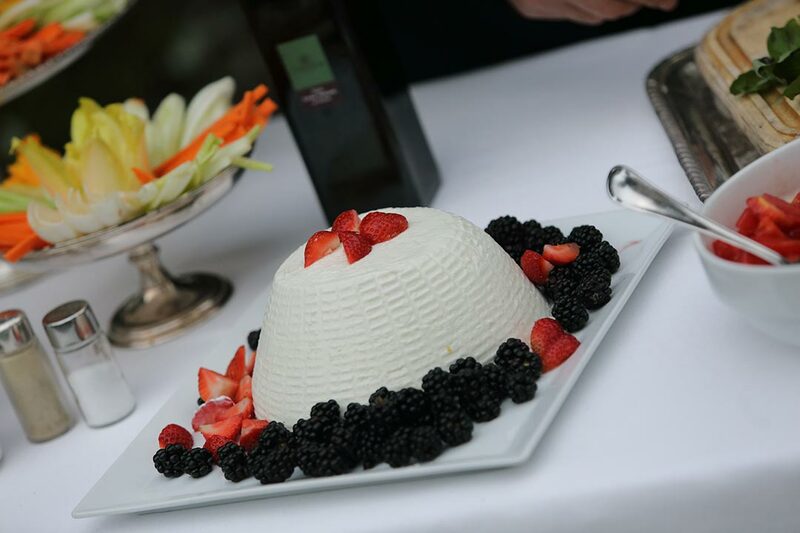 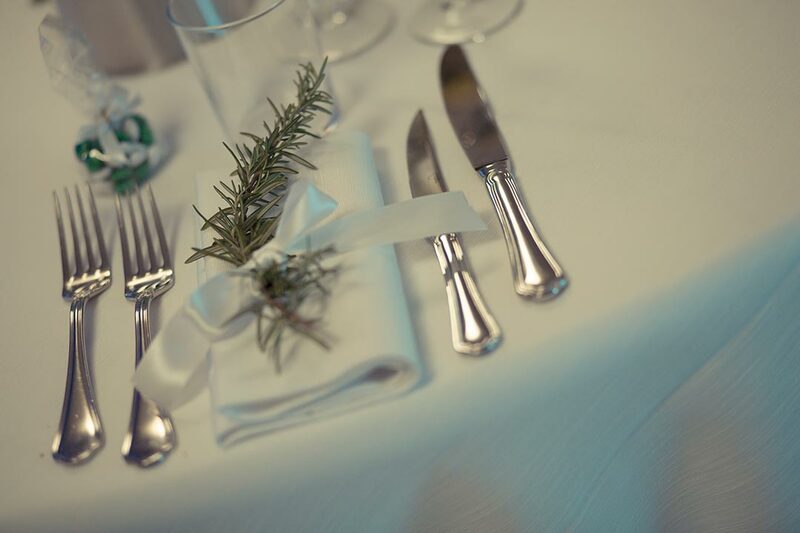 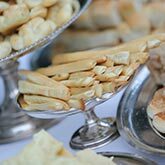 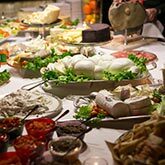 Thanks to the cooperation of our trusted caterers and professional chefs, you and your guests are ensured an amazing food and wine experience on your wedding day with a tailored menu. 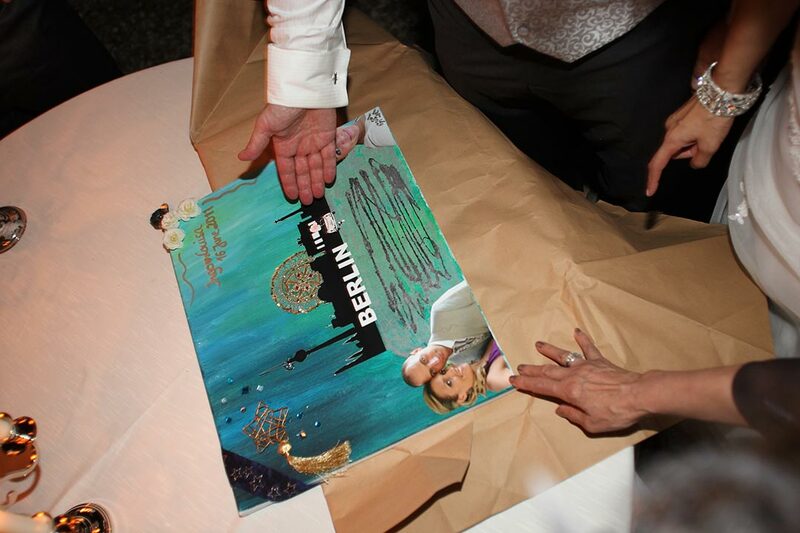 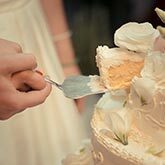 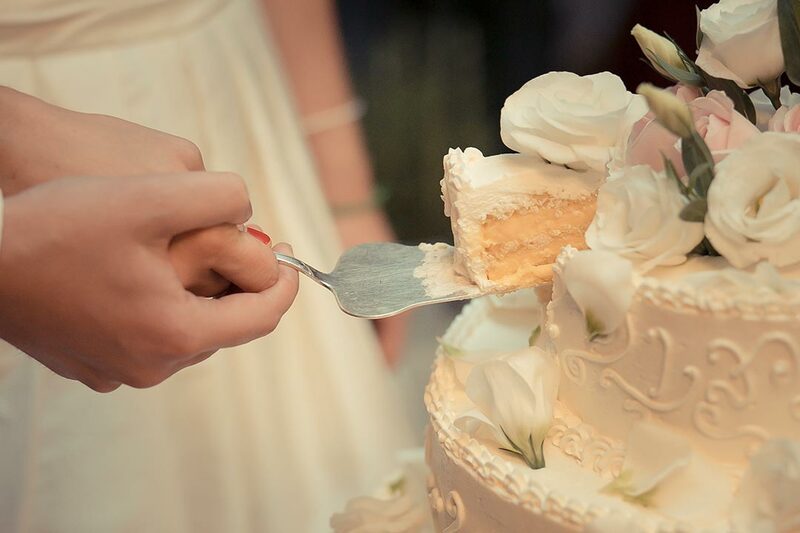 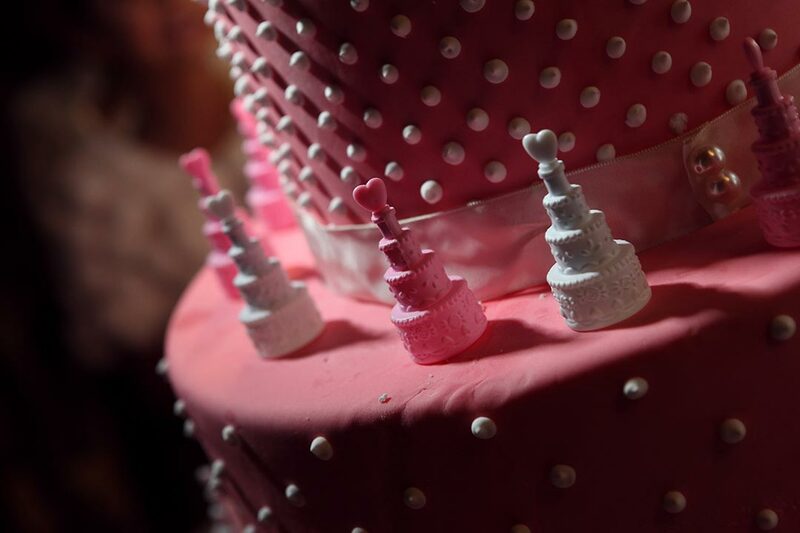 The cutting of the wedding cake represents the first task of the couple's married life together. 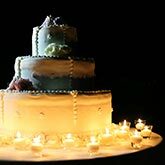 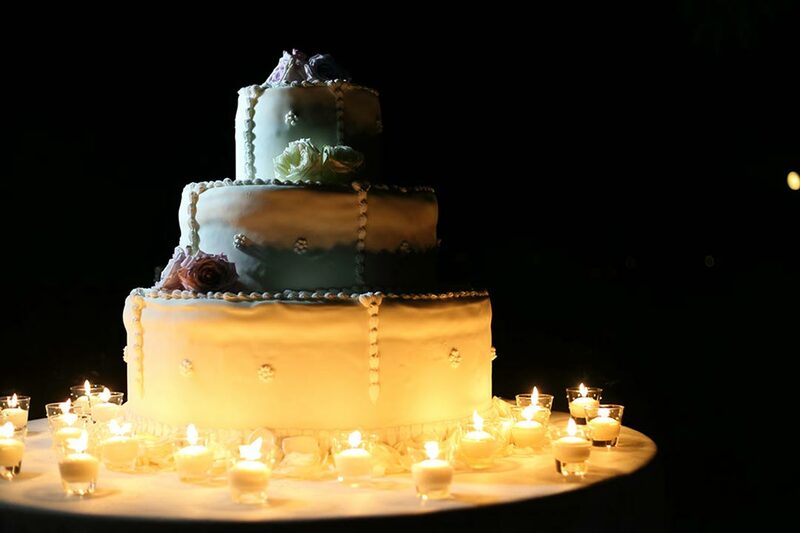 The wedding cake is therefore one of the peak moments of your big day. 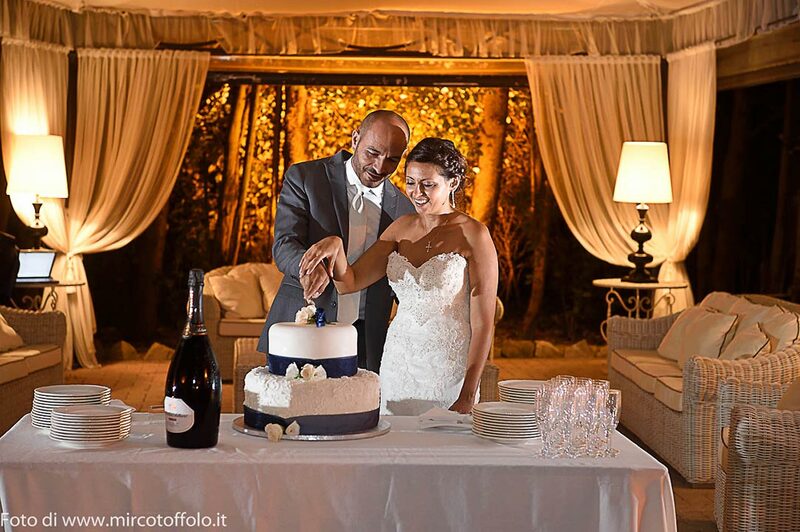 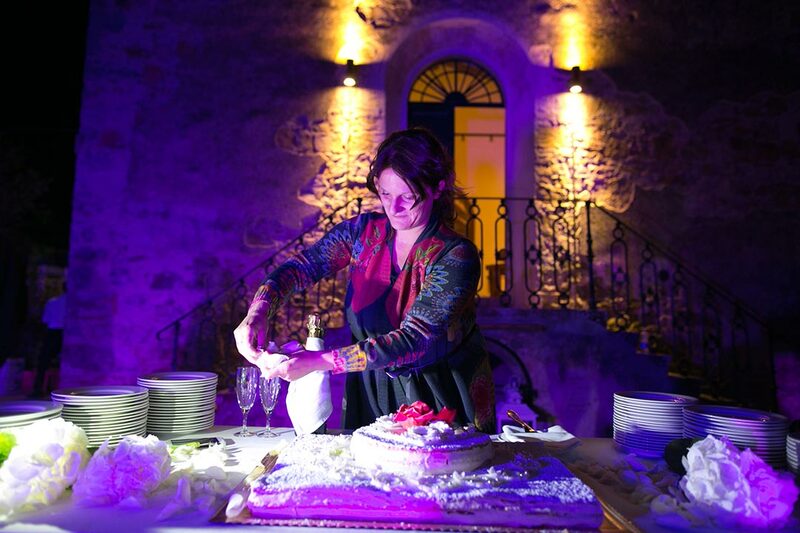 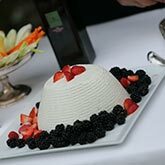 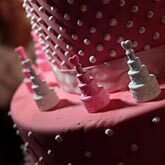 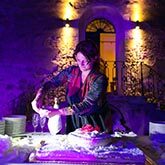 Together with my bakers and cake designers, we will assist you in finding the right size, shape and style for your wedding cake which will reflect the high standards of Italian culinary tradition. 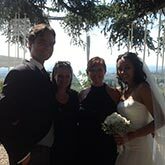 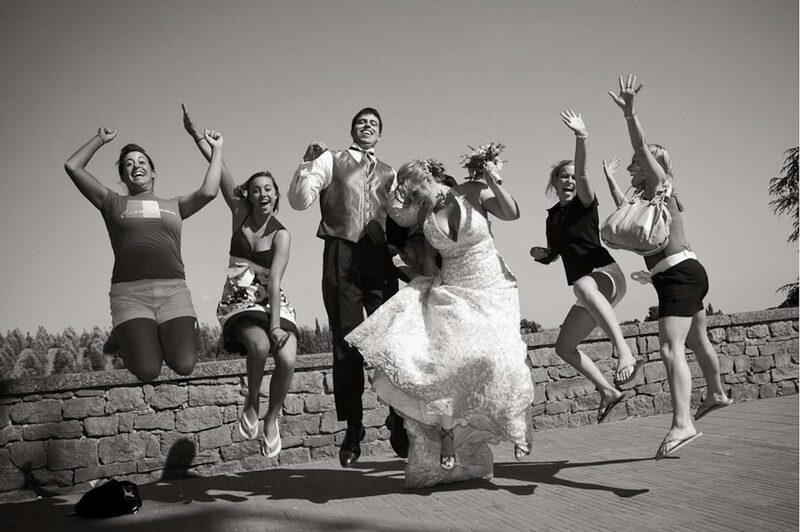 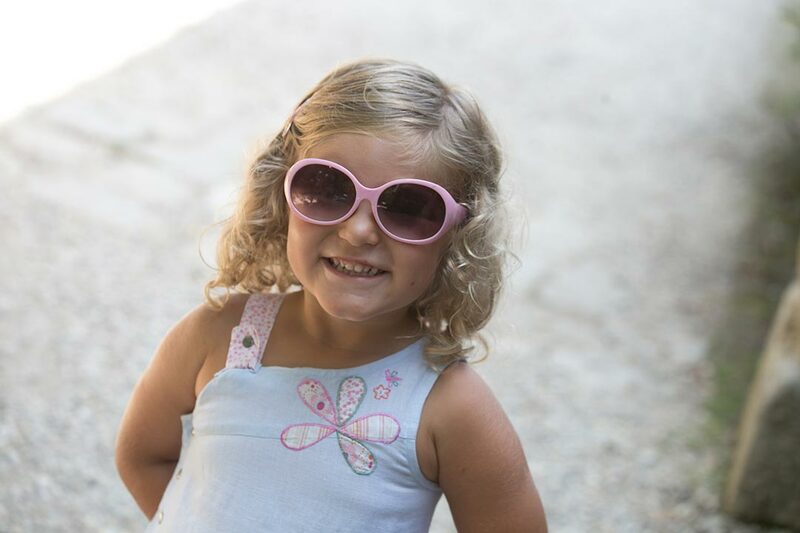 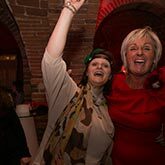 This is your wedding day: make it a blast with Mascia and her staff, a day that will live on in your memories forever! 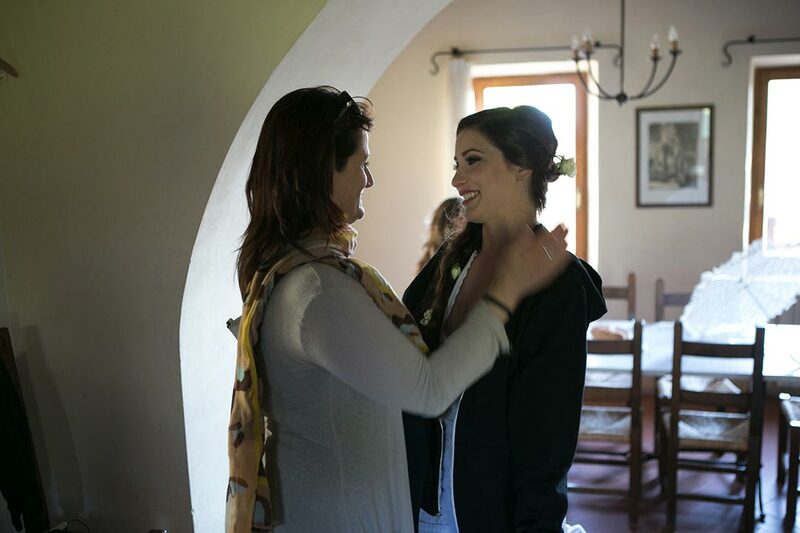 I work with only the finest professional hairdressers and make-up artists. 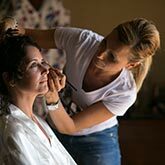 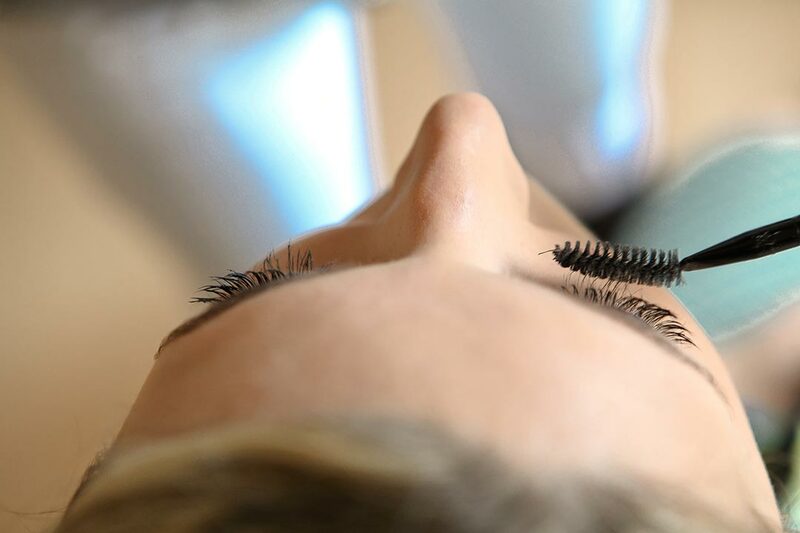 The make-up of your big day is extremely important and our staff will guarantee that you look your best, also for the photographs. 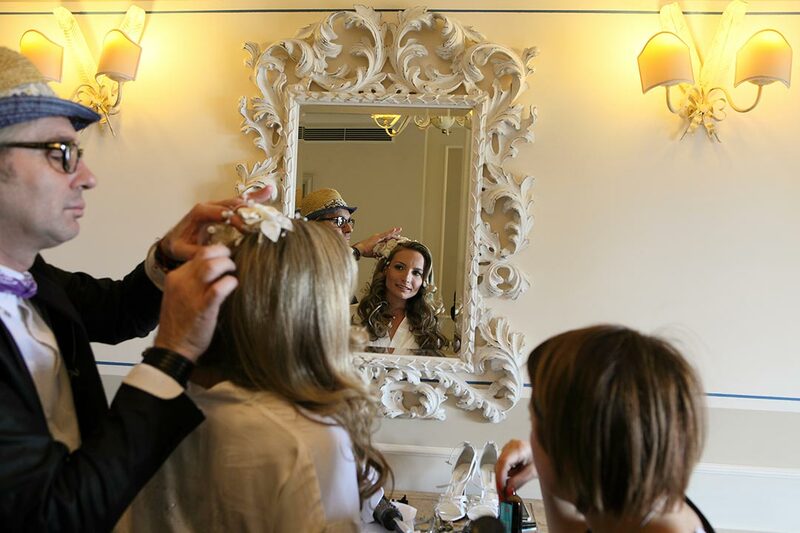 A bride deserves to feel queen for the day. 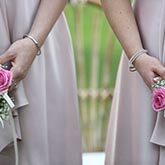 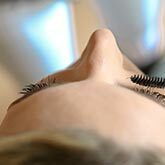 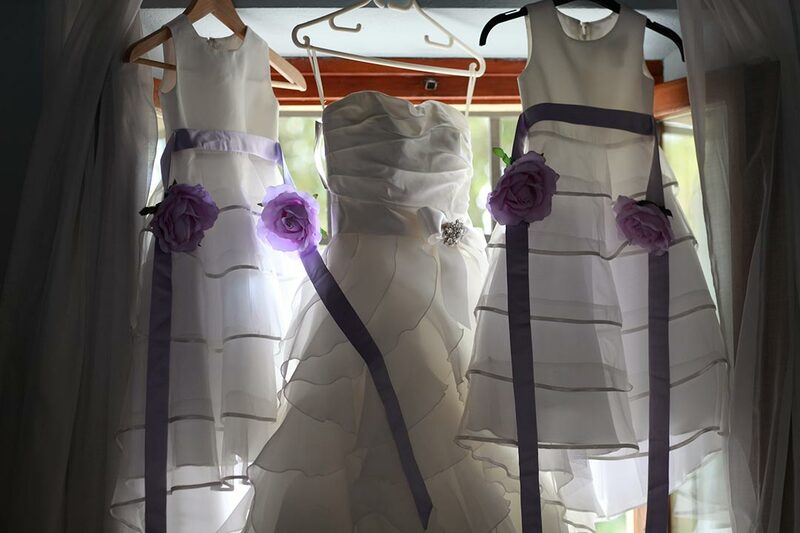 Upon request beauty services for bridesmaids and other ladies in the wedding party may also be arranged. 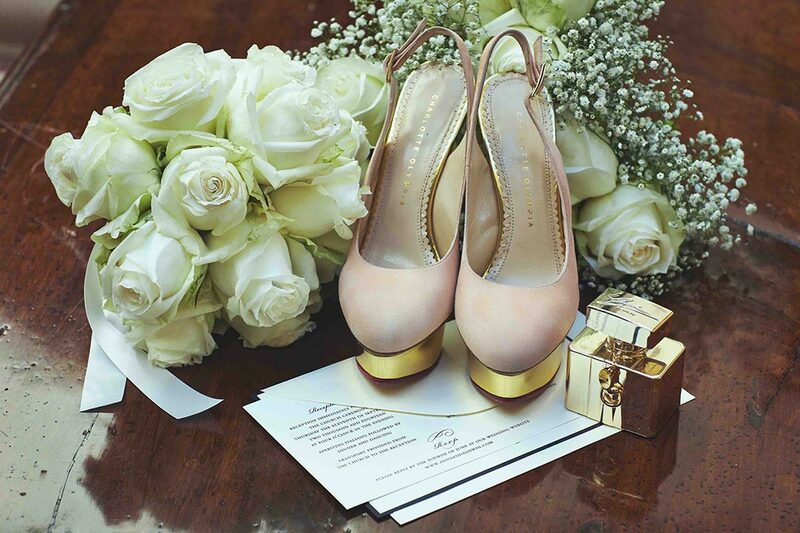 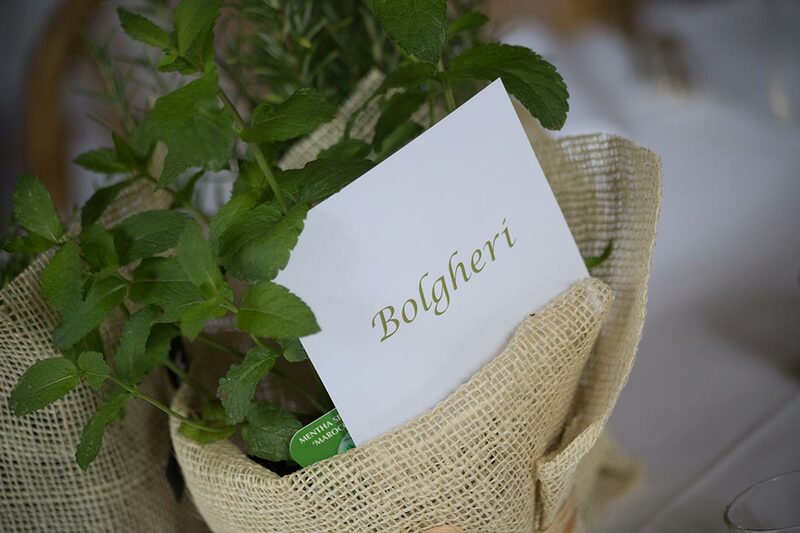 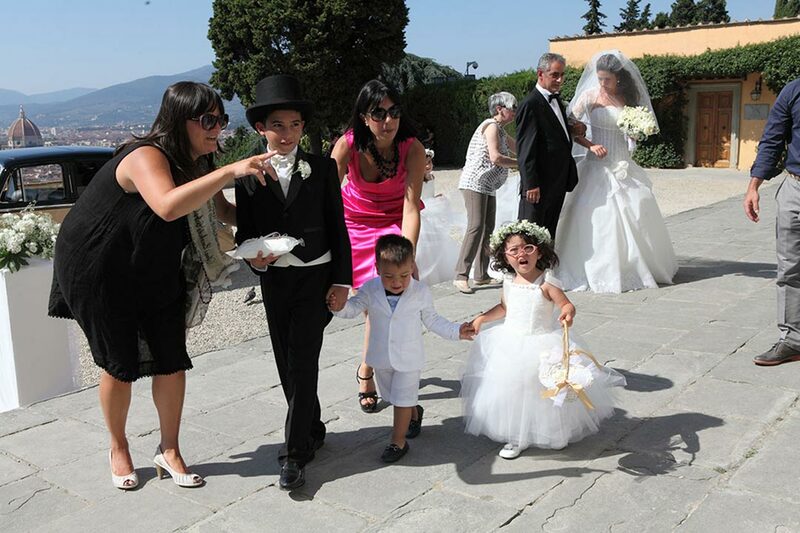 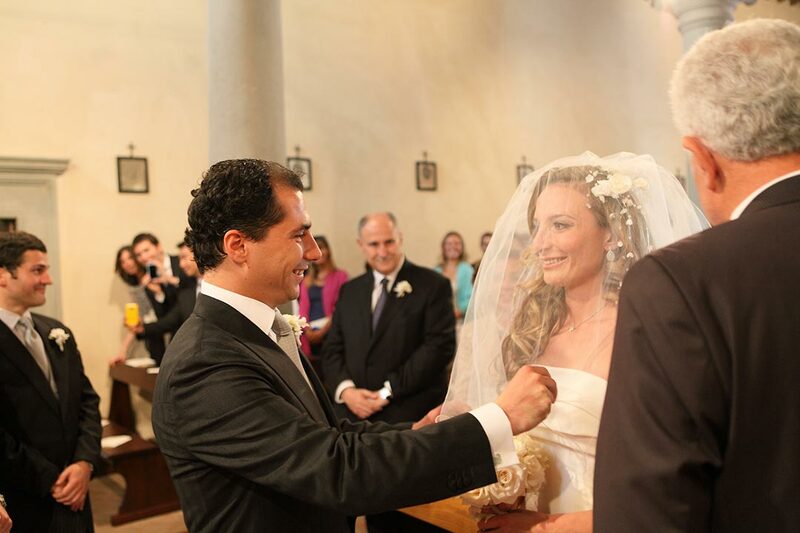 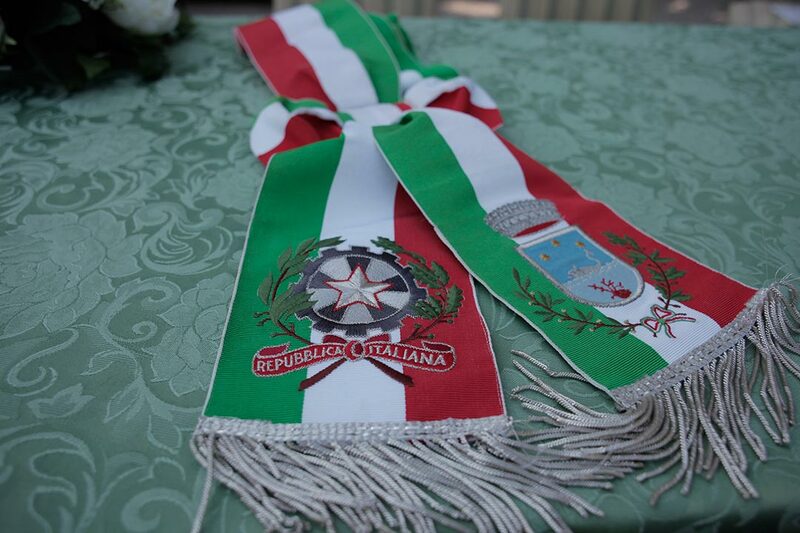 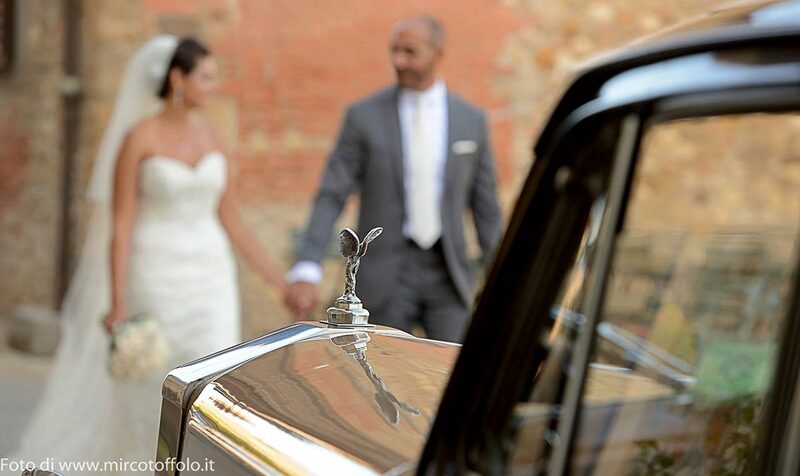 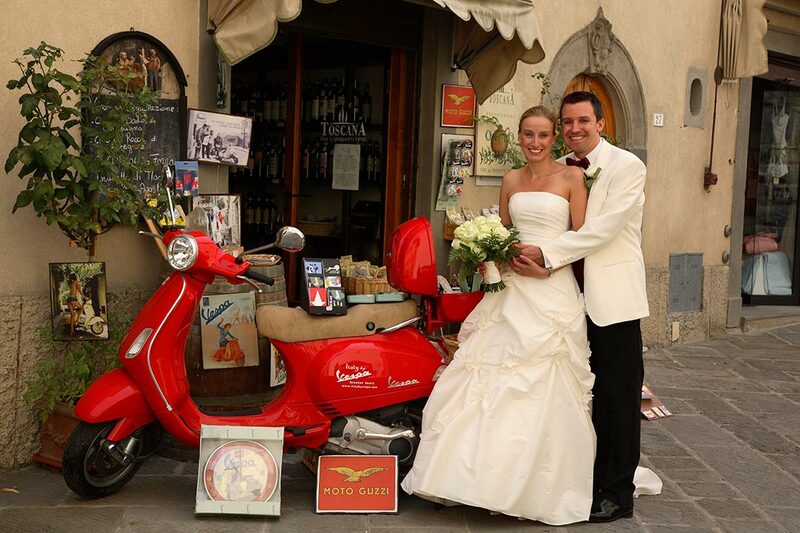 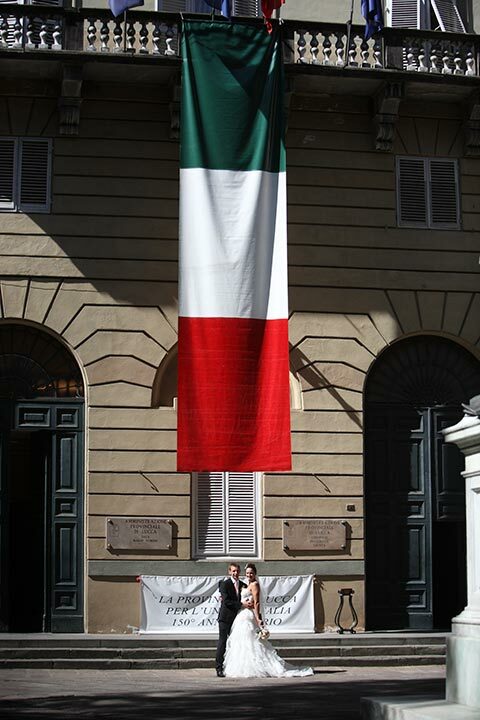 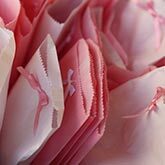 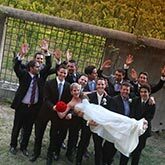 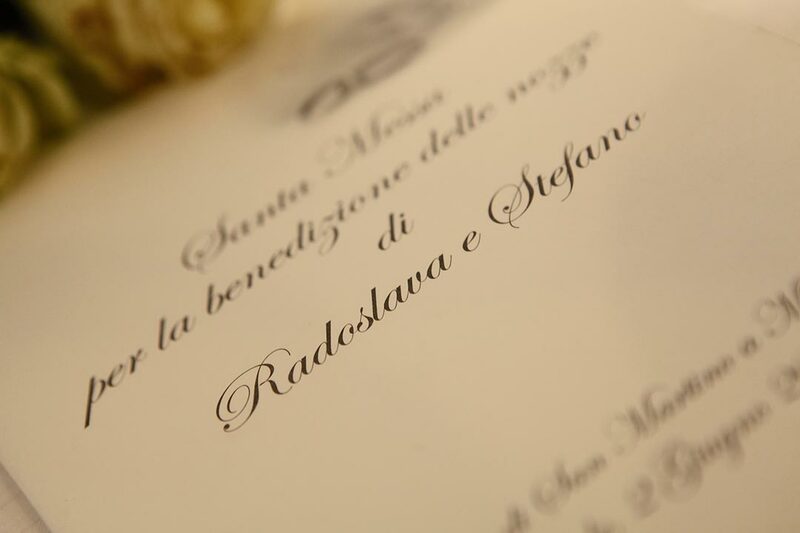 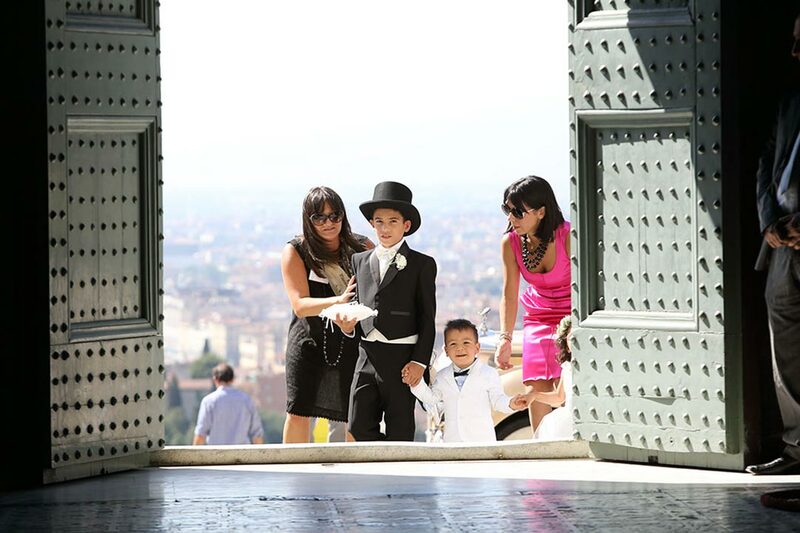 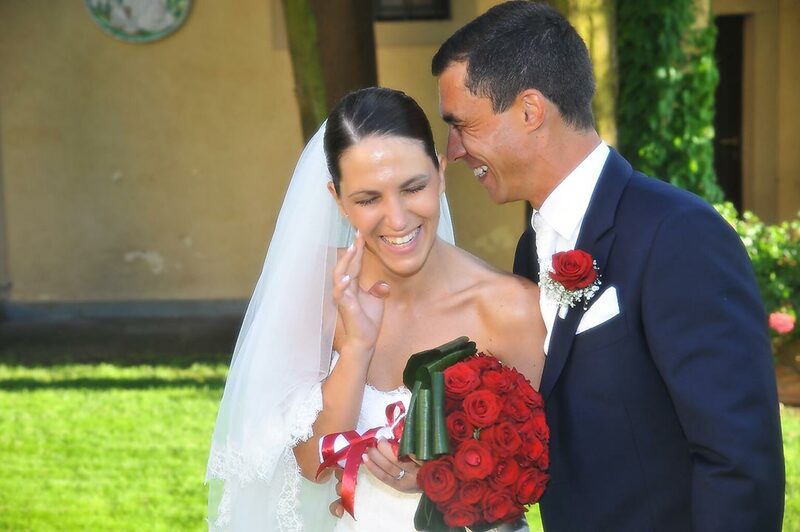 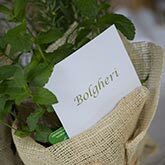 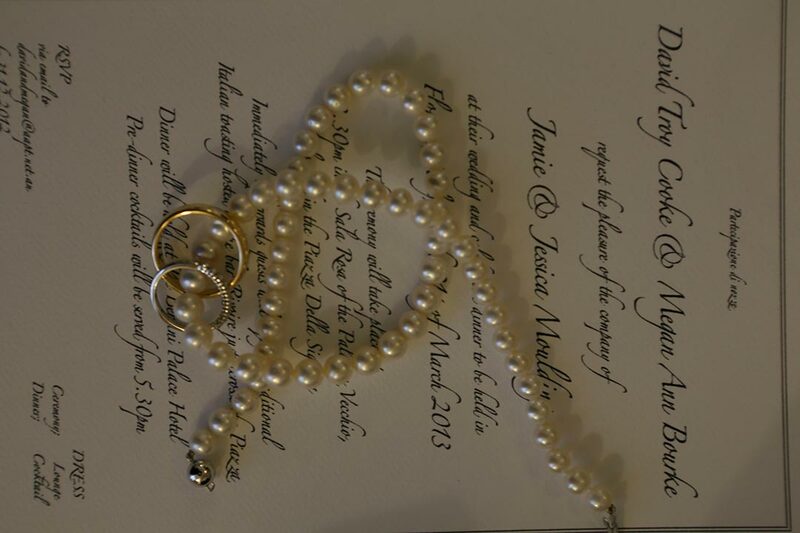 For a completely “Made in Italy” wedding, you may choose to print your invitations or mass booklets here in Italy. 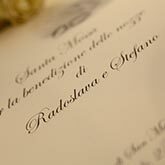 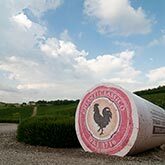 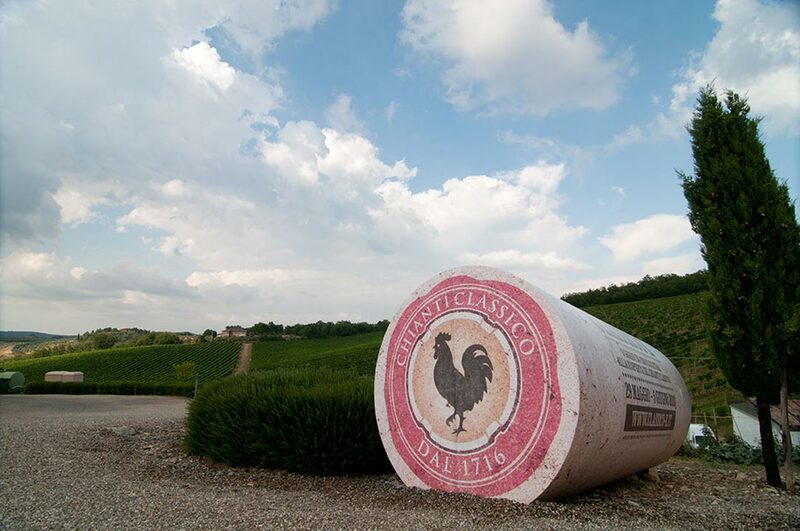 Choose from a vast selection of Italian handmade papers and trust the style and charm of Italian printers to make it all happen. 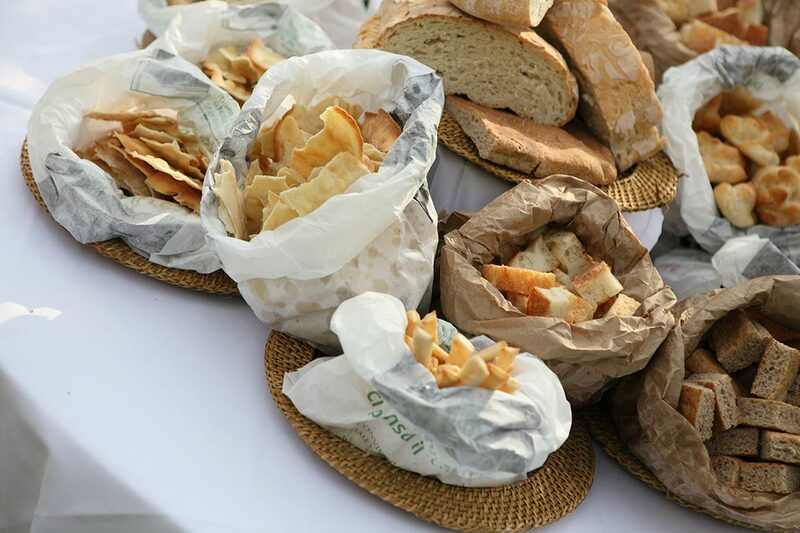 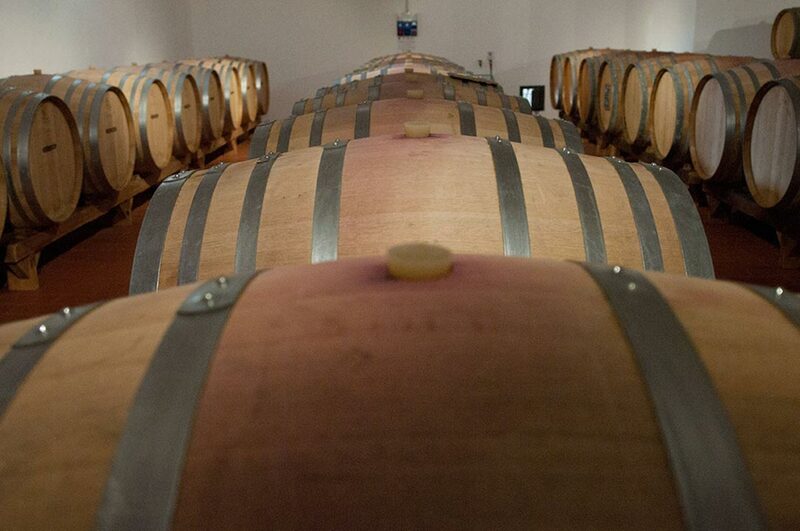 We will go through samples with you and send you drafts to check along the way. 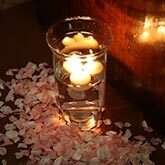 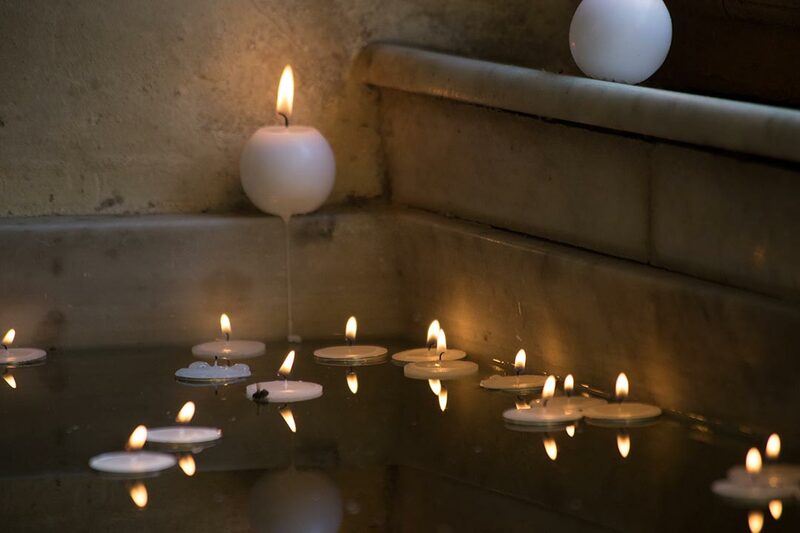 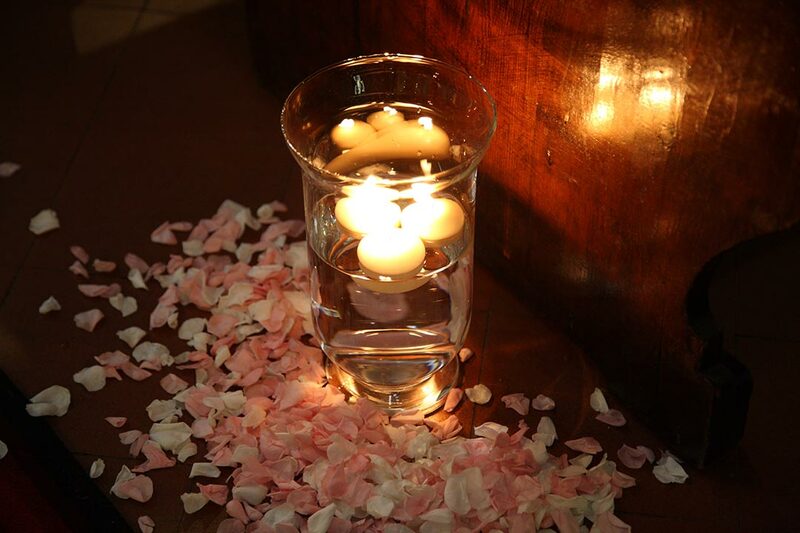 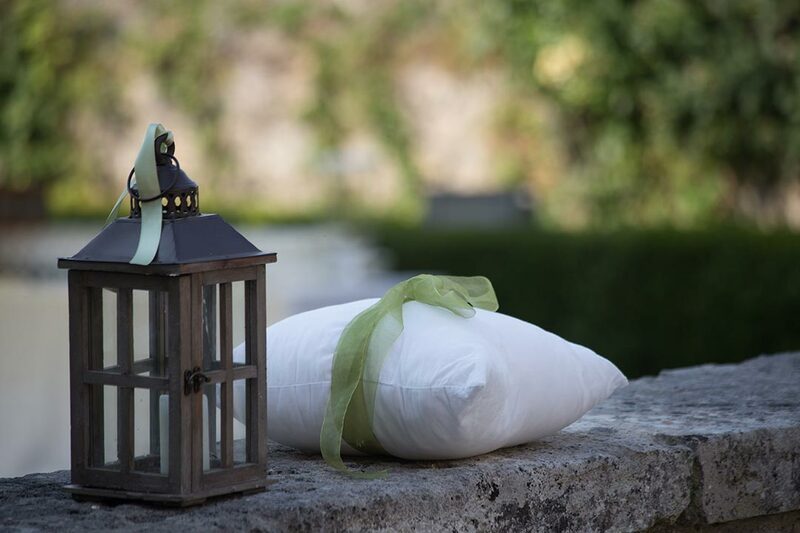 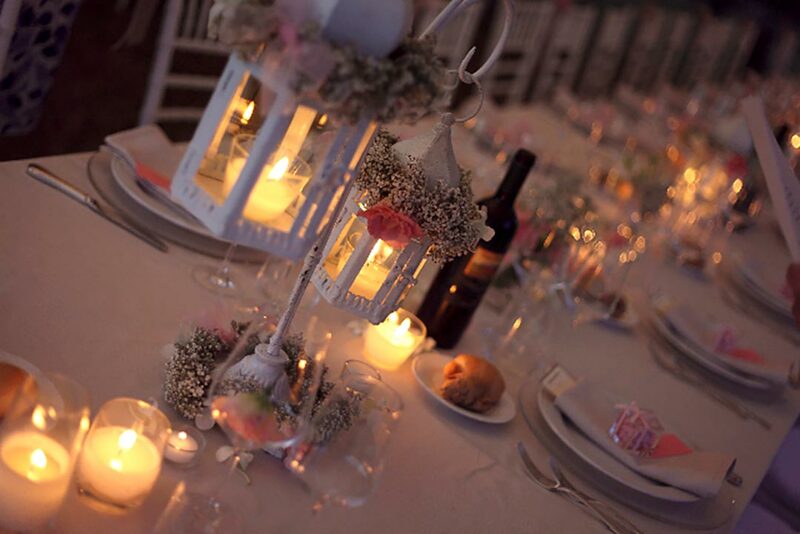 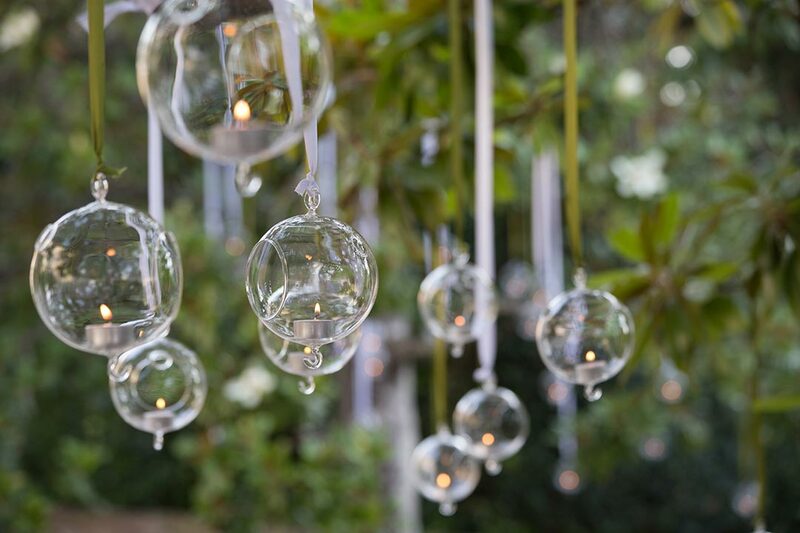 Soft lighting, candles and lanterns will contribute to creating the perfect atmosphere at your wedding reception. 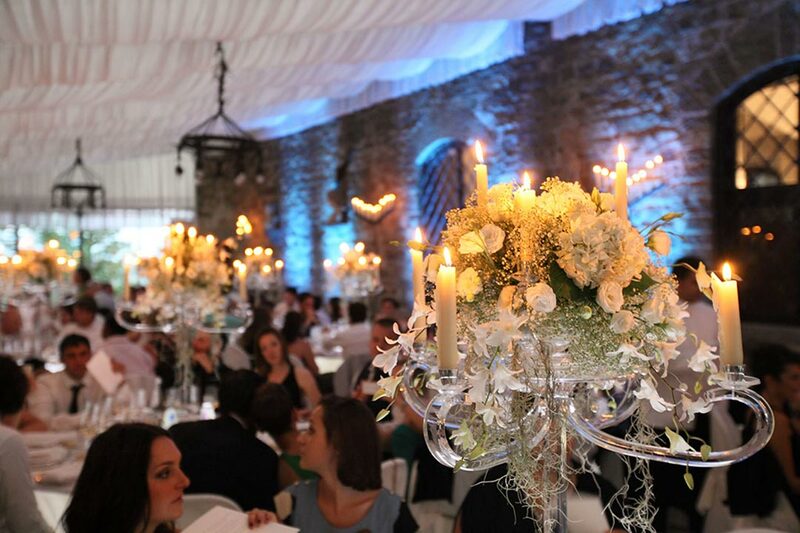 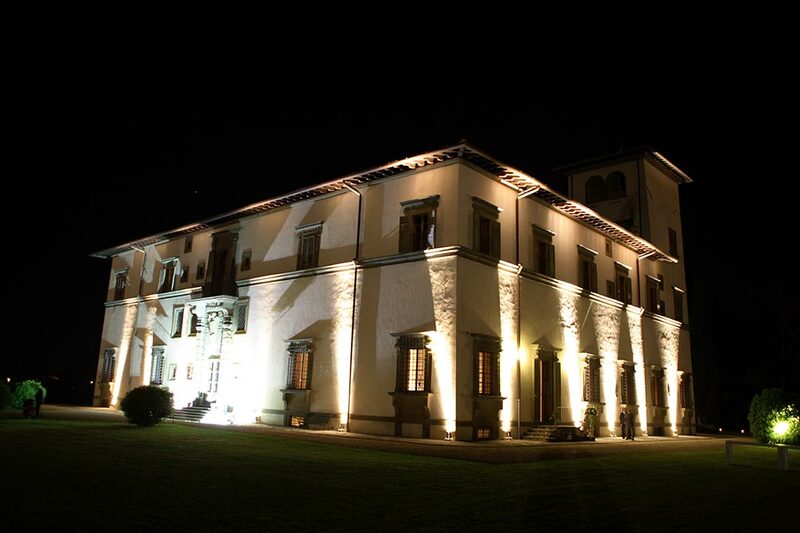 Once the wedding venue has been chosen I will provide you with proposals for lighting effects to choose from. 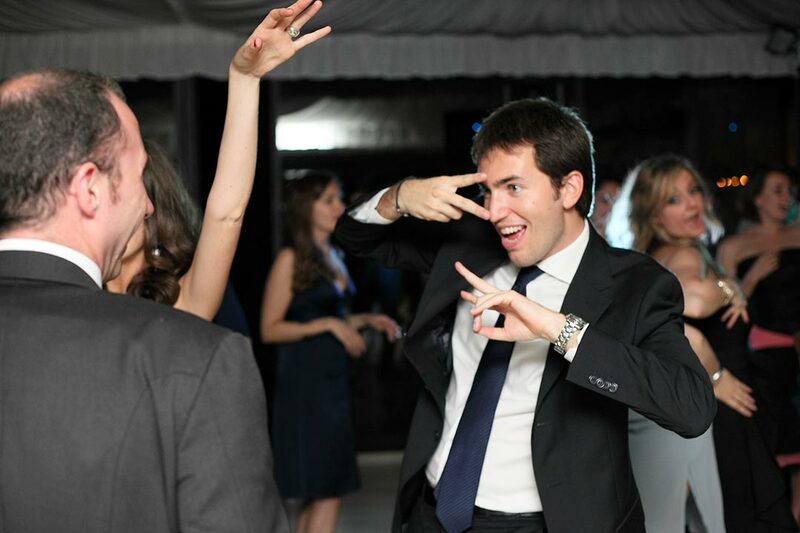 The music at a wedding is of extreme importance. 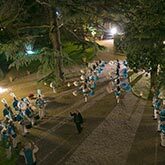 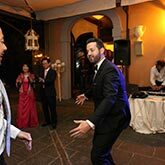 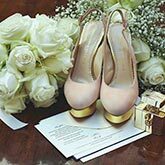 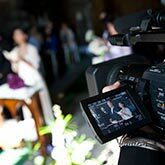 At the wedding ceremony, be it a civil service in a town hall or a religious ceremony in a chapel or church, the background music will draw attention to the entrance of the bride, the exit and every important moment of the celebration. 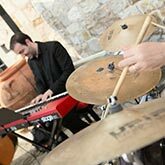 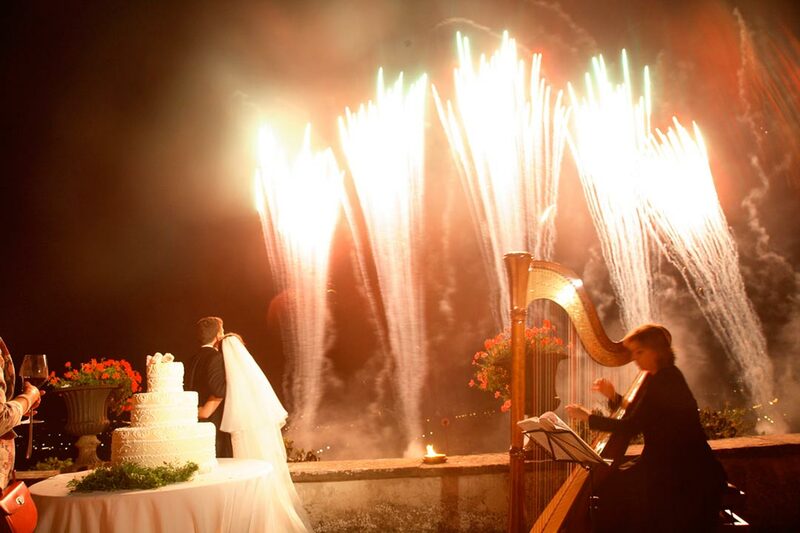 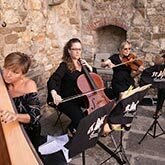 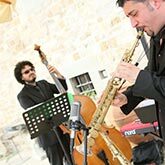 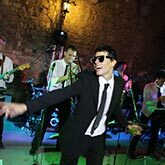 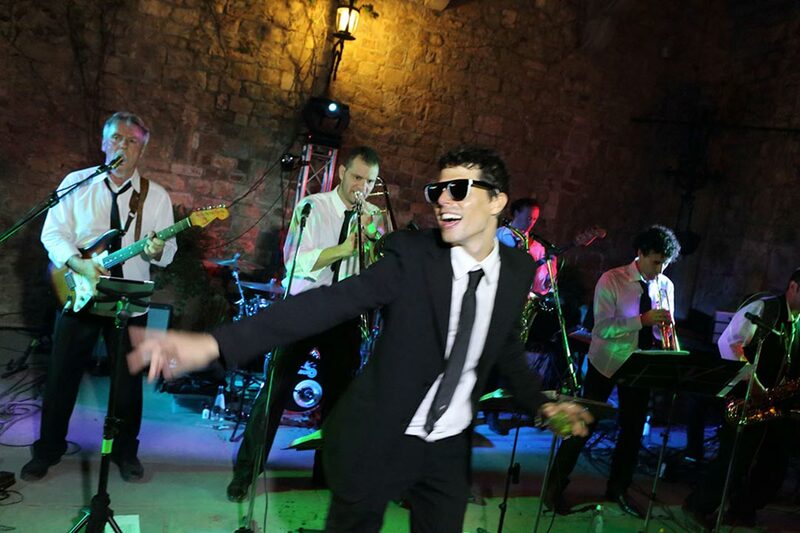 During your wedding reception the music is fundamental in setting the atmosphere of your celebration and the style of your wedding. 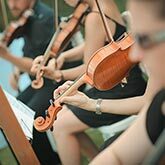 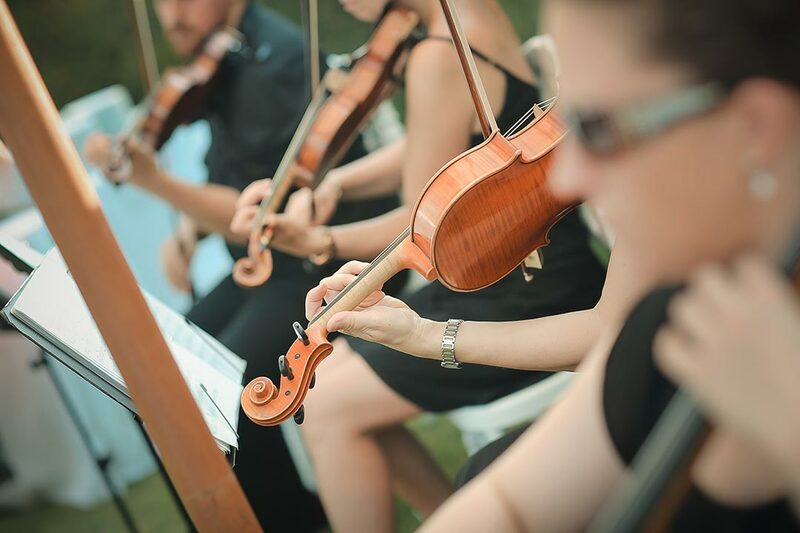 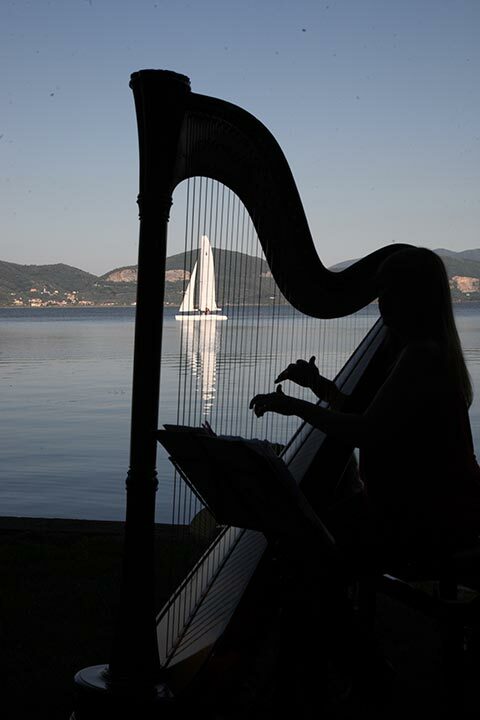 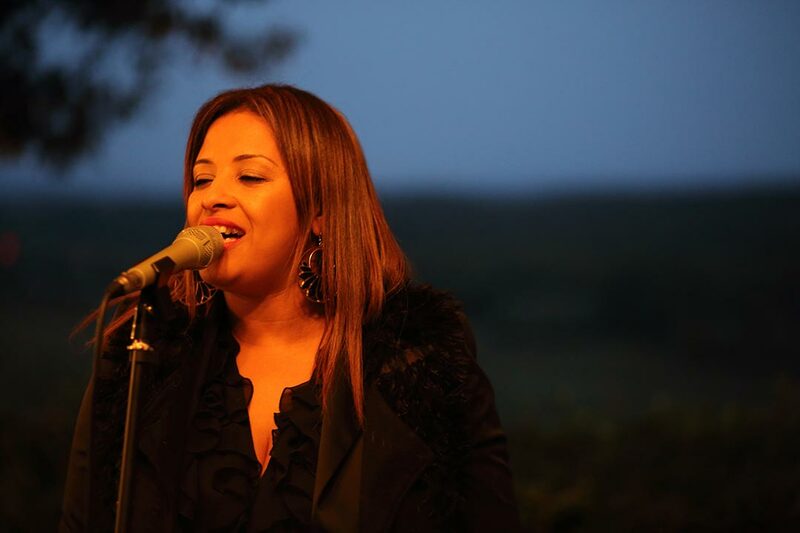 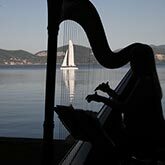 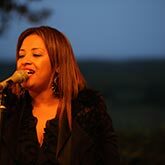 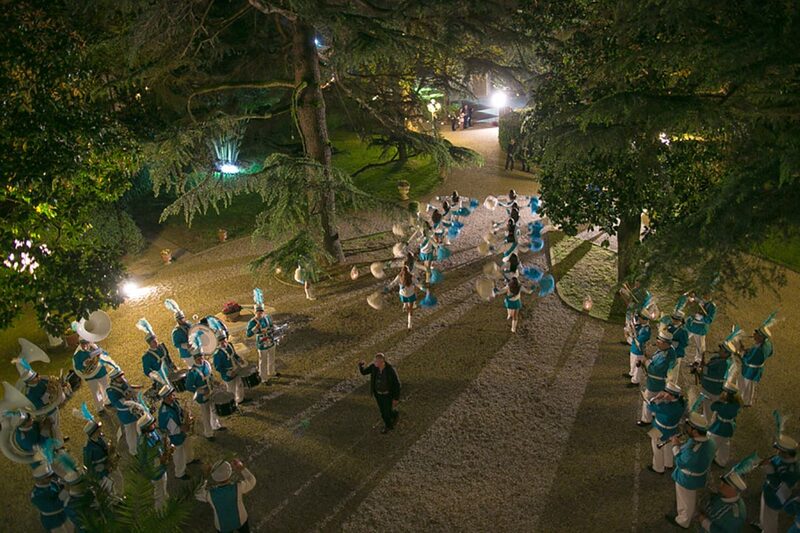 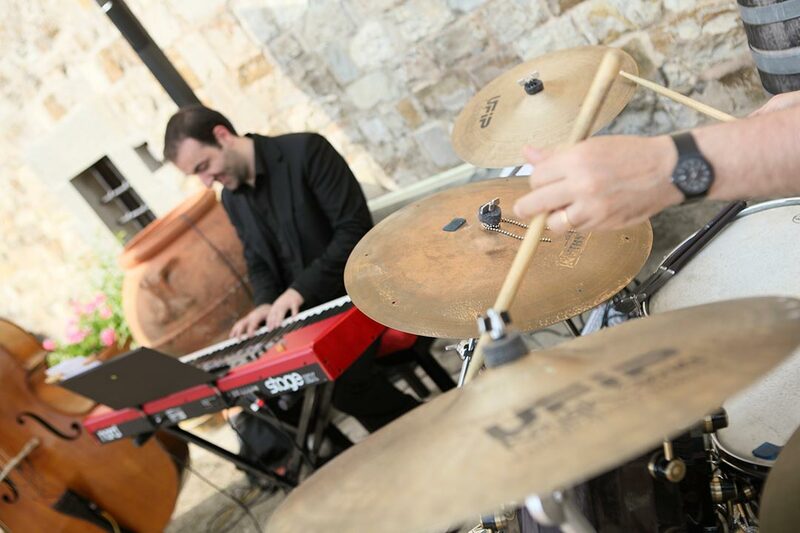 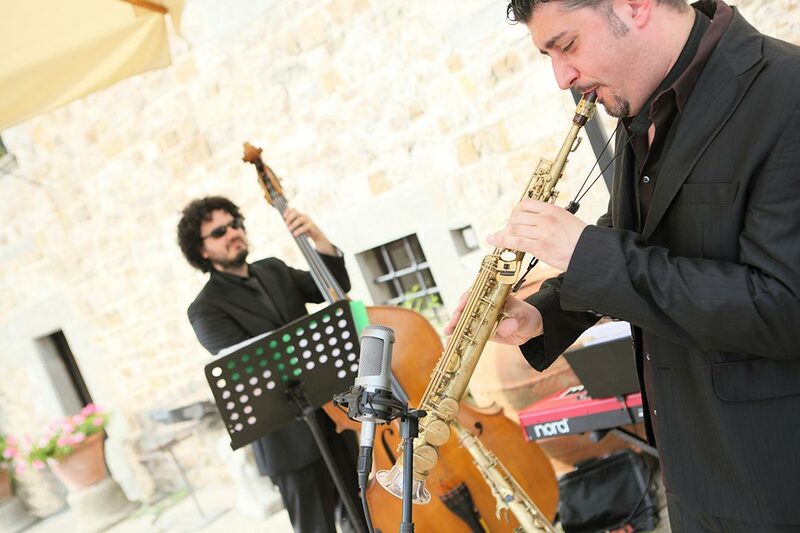 We work with only professional musicians and you can ask to personalise any aspects of your musical moments. 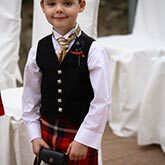 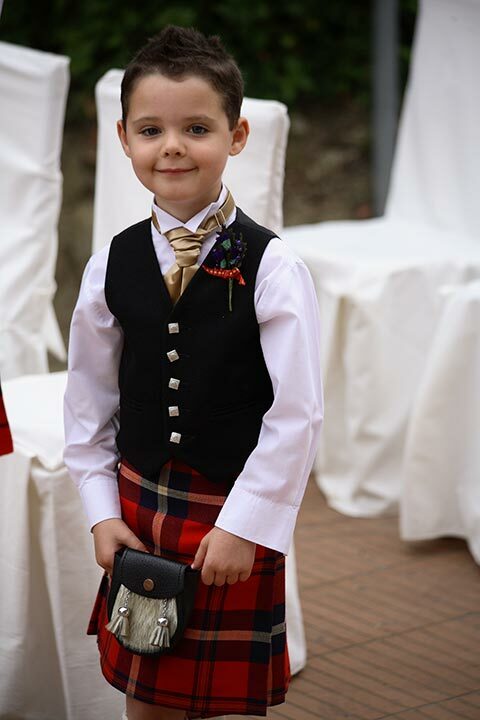 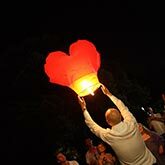 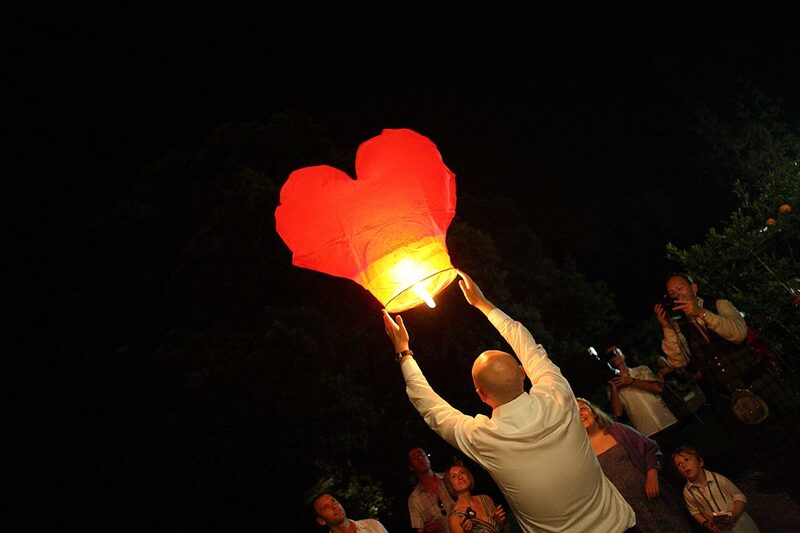 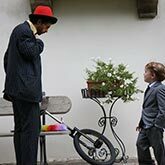 I can arrange for you any other entertainment you have in mind for your wedding day: fireworks, sky lanterns show, ancient flag bearers, games to keep the little ones busy and babysitting are just some possibilities. 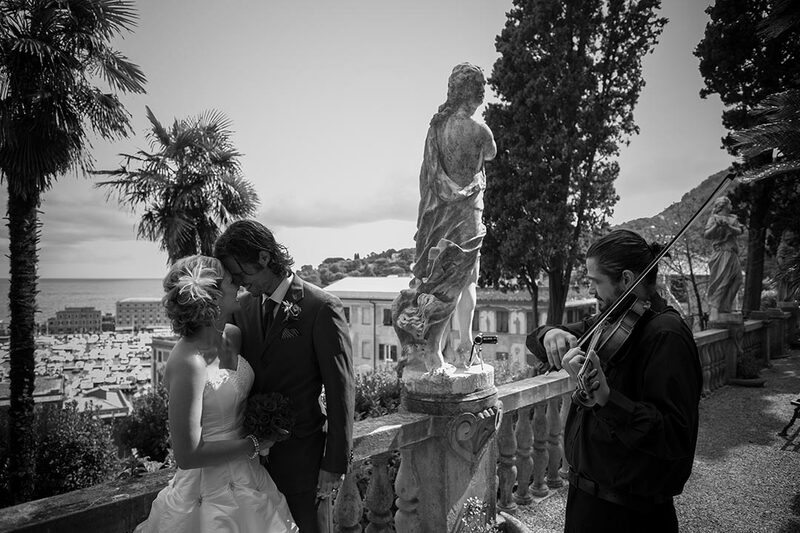 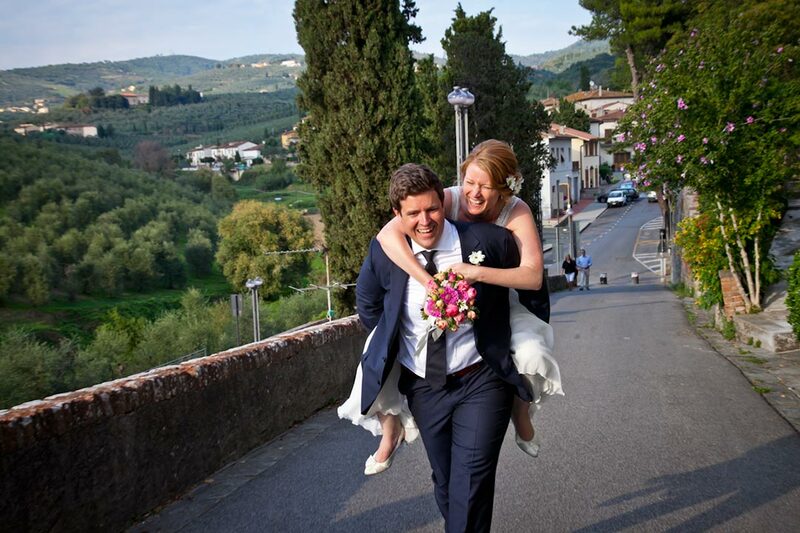 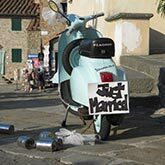 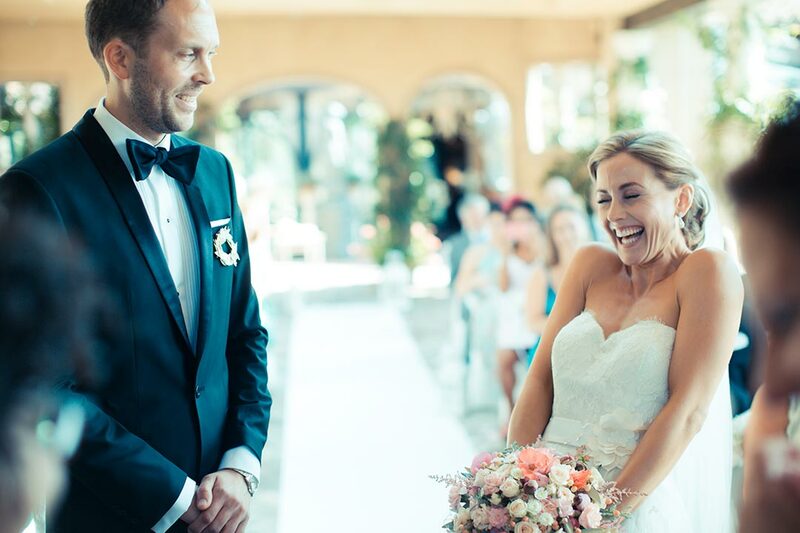 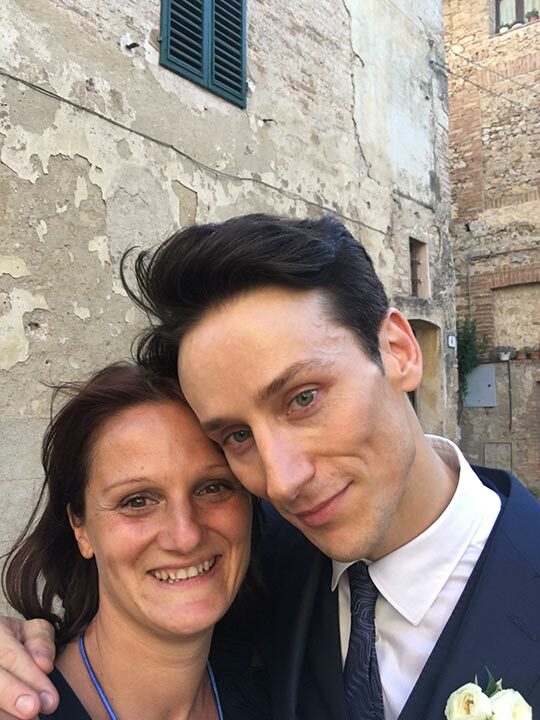 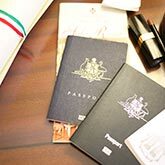 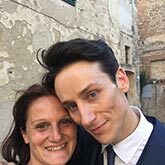 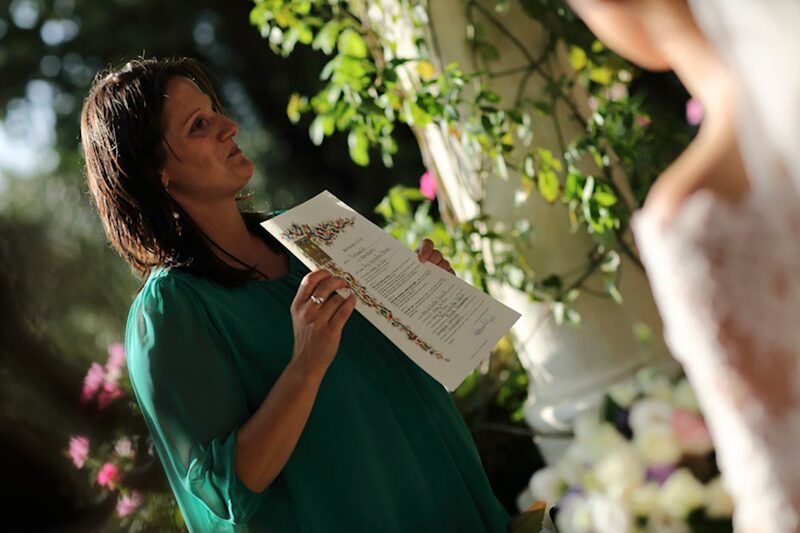 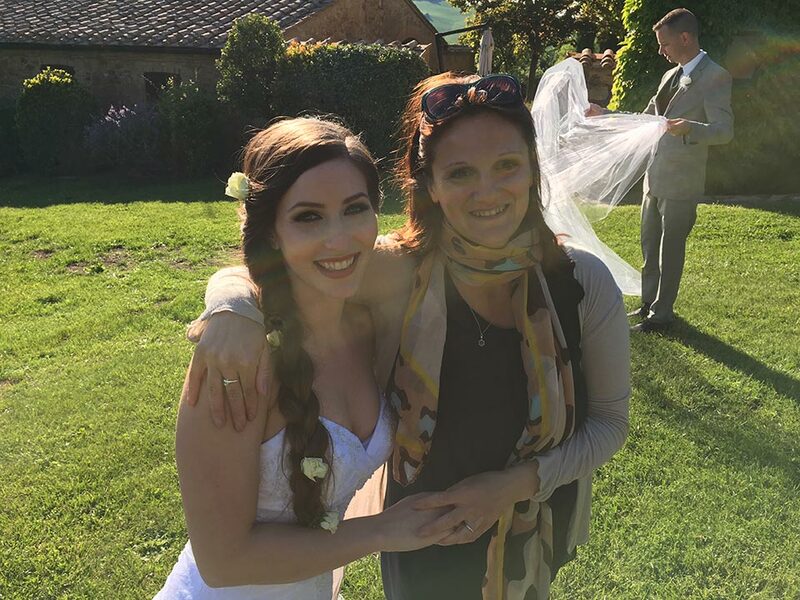 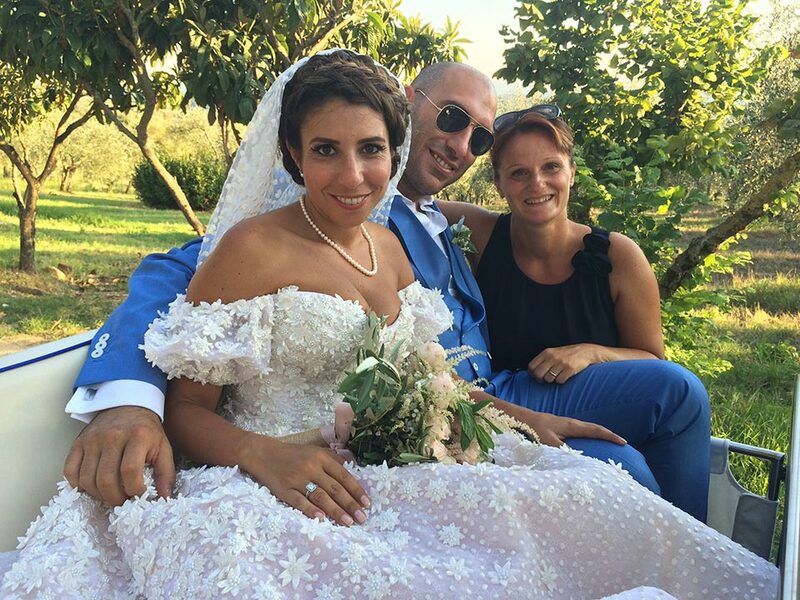 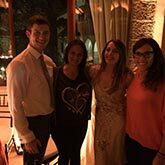 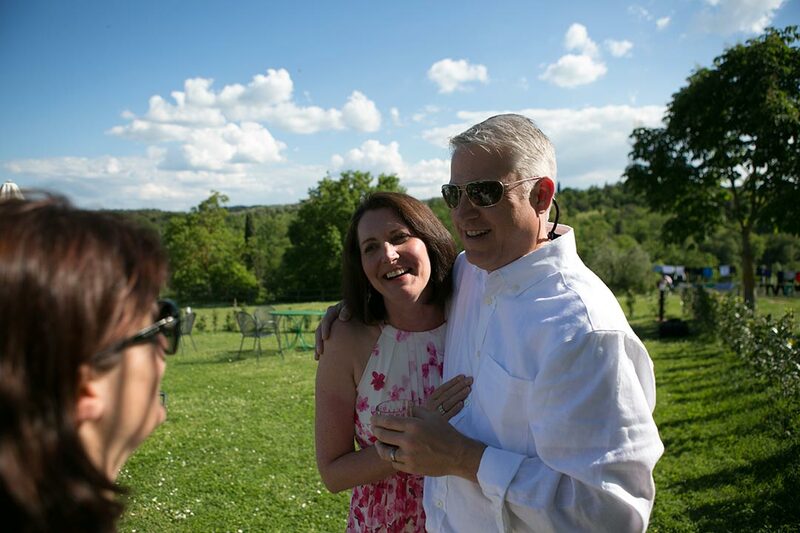 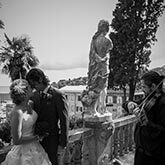 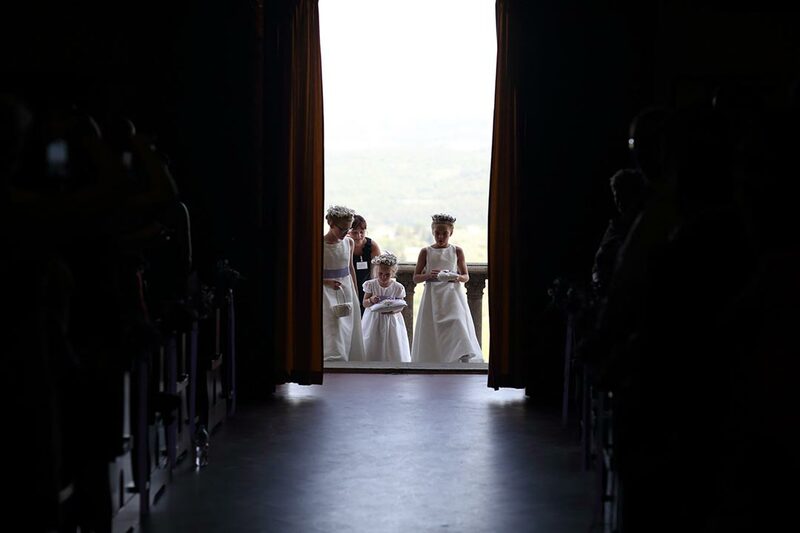 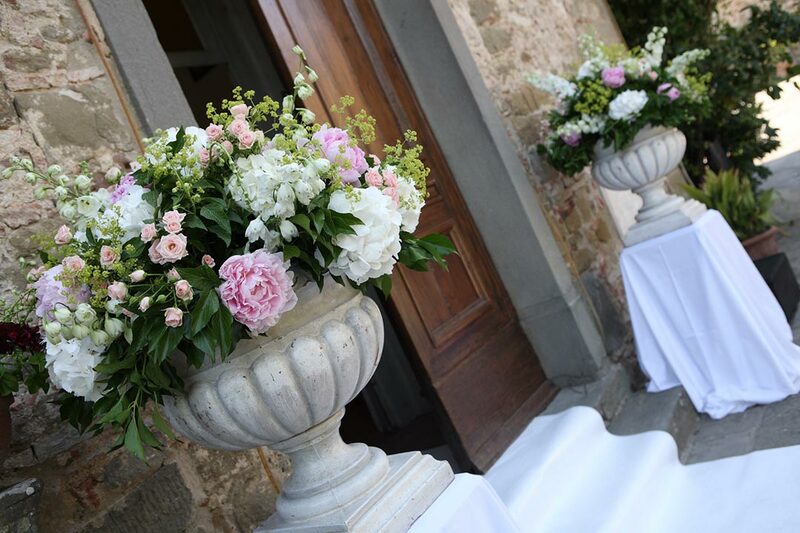 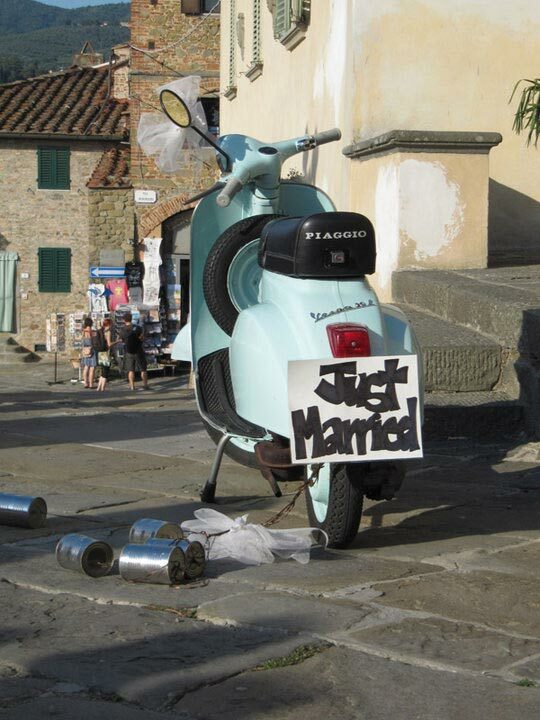 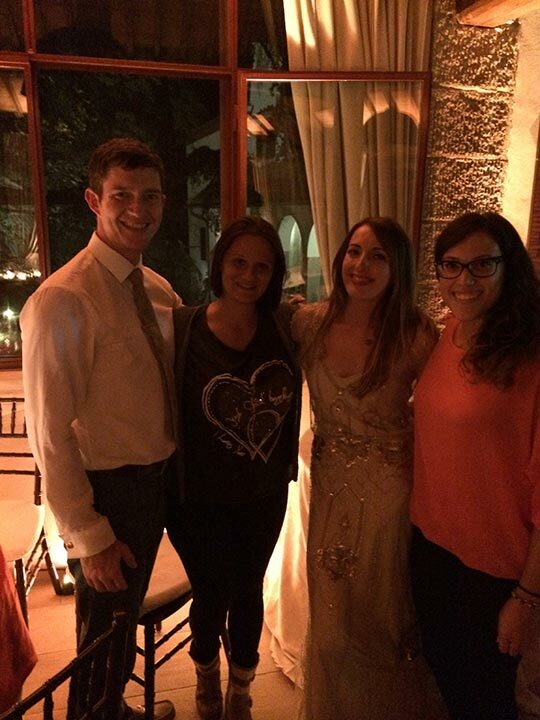 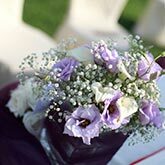 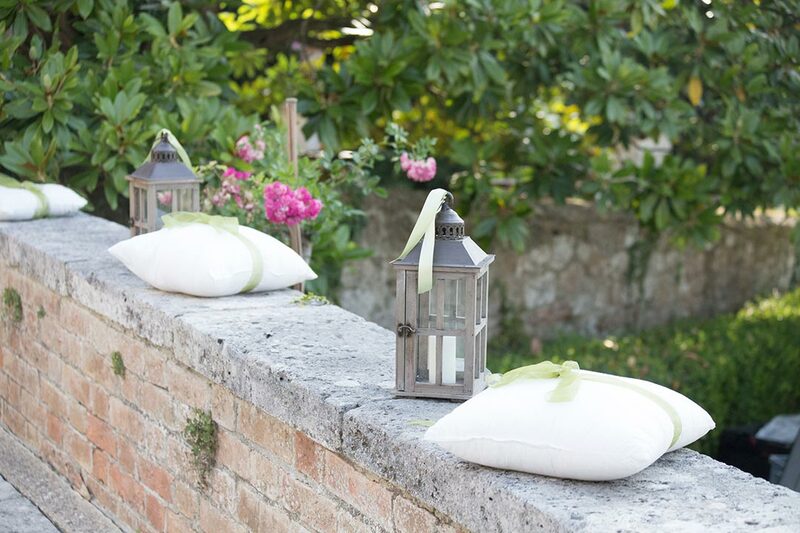 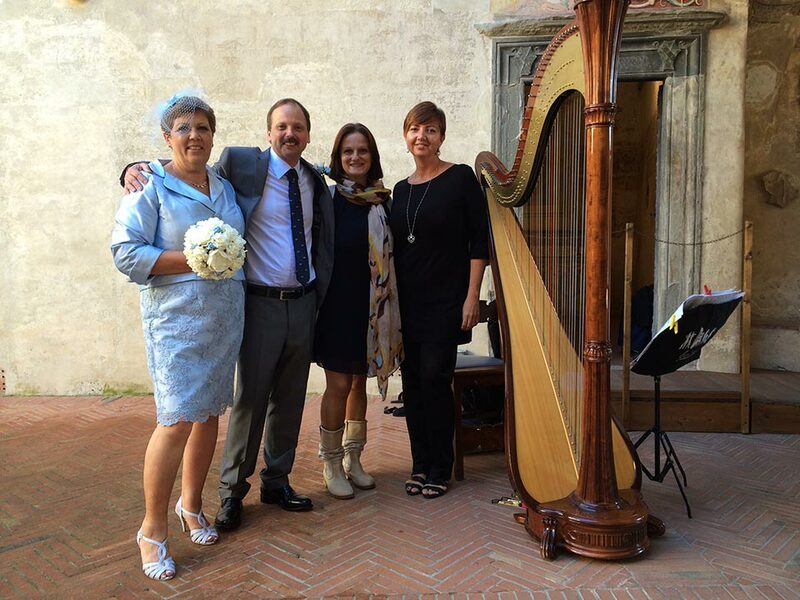 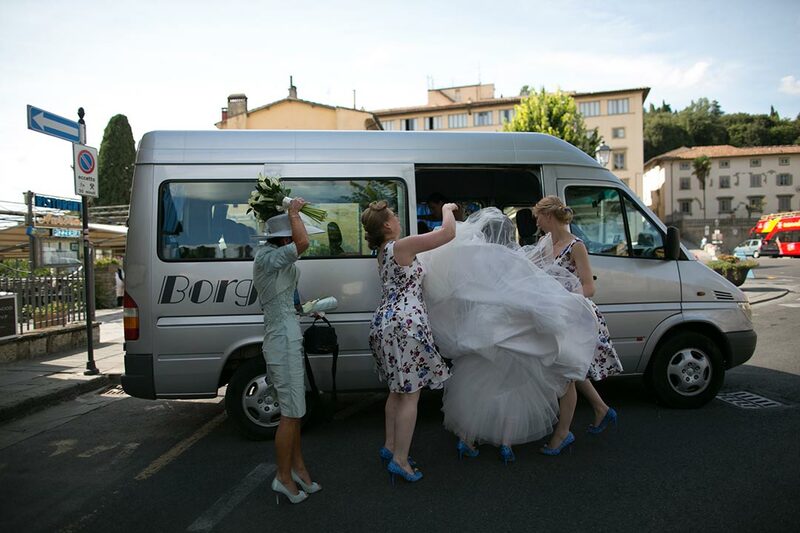 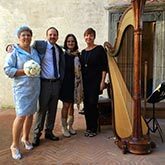 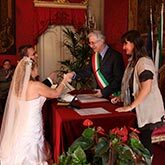 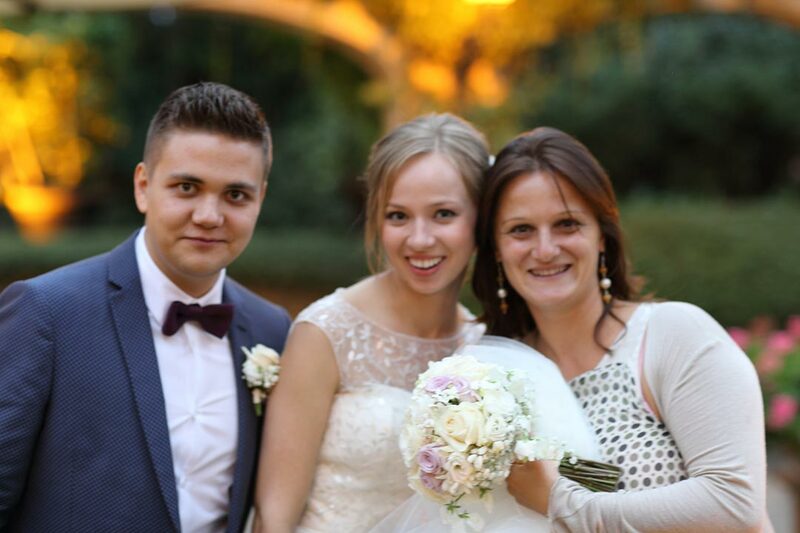 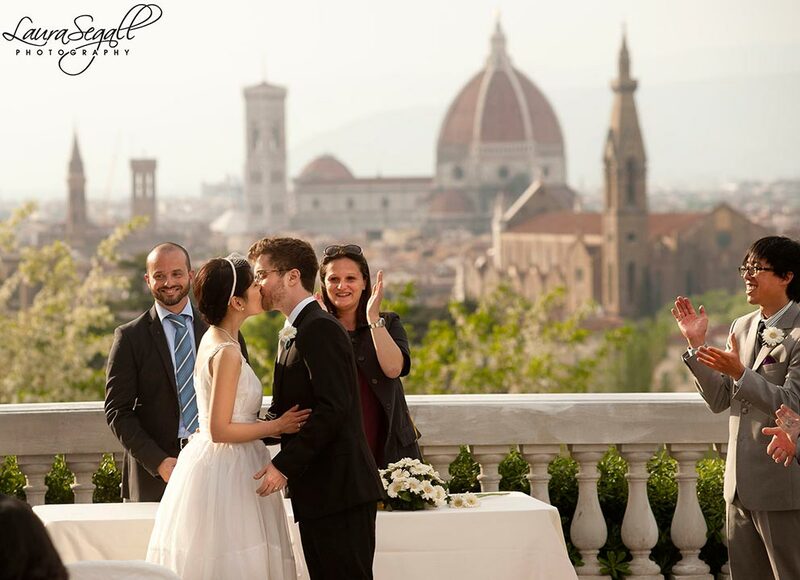 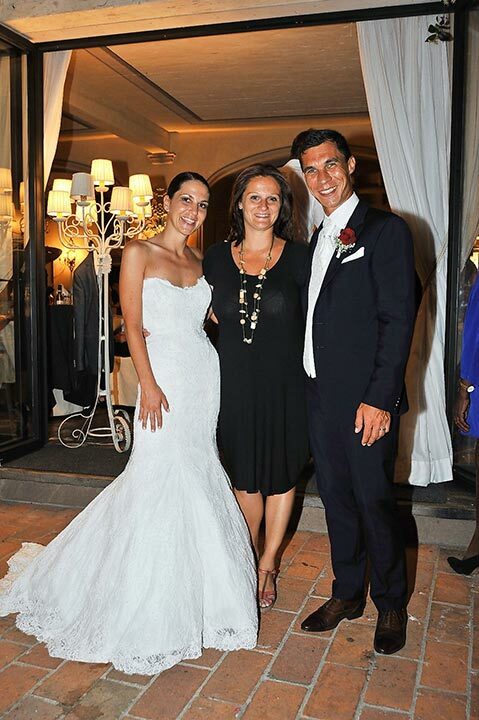 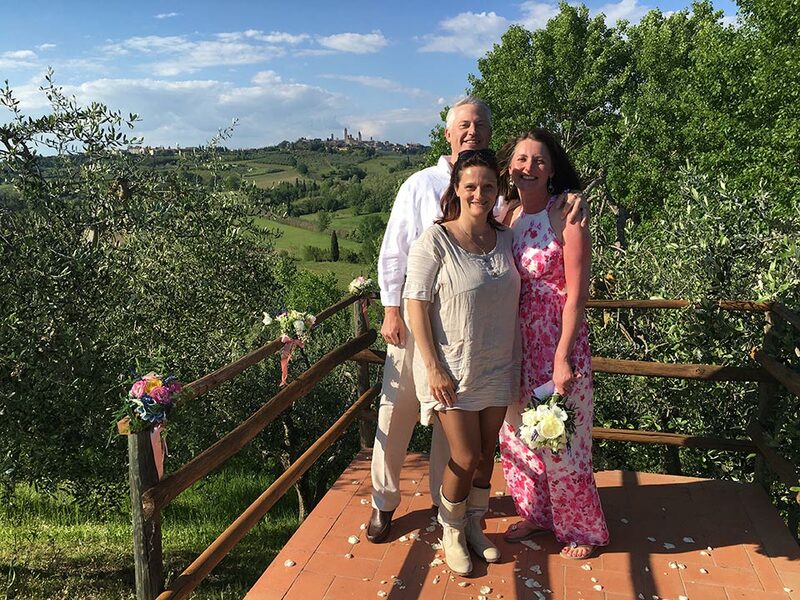 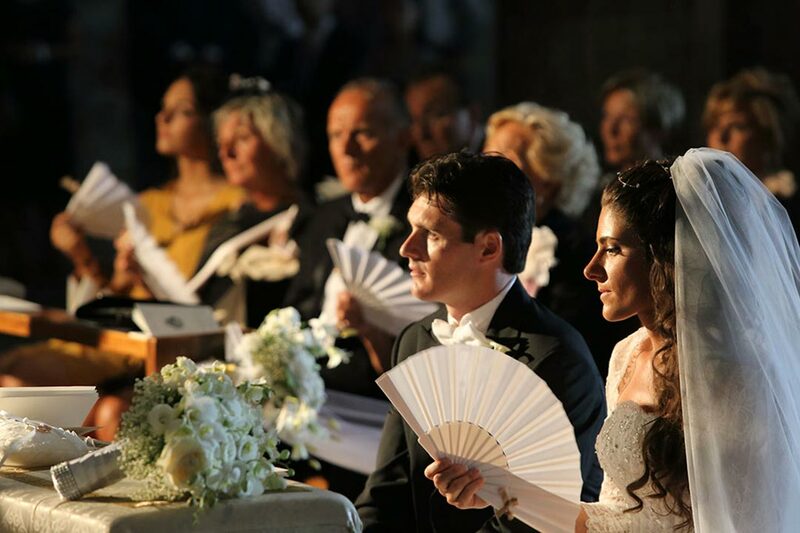 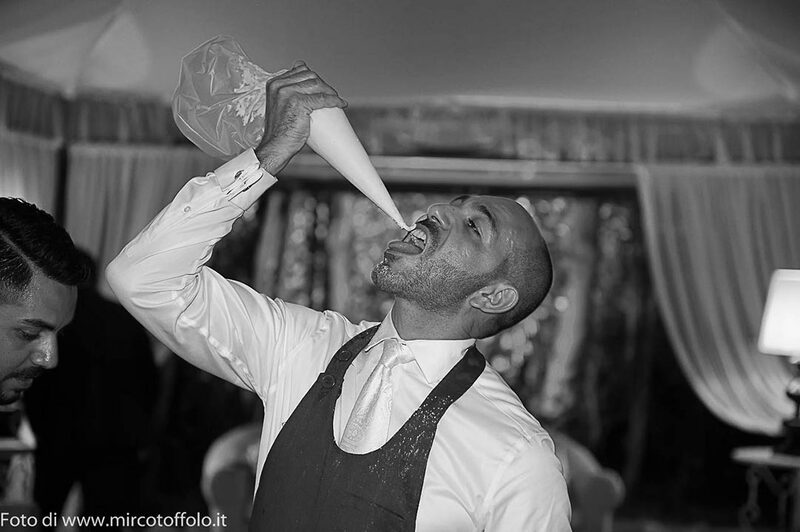 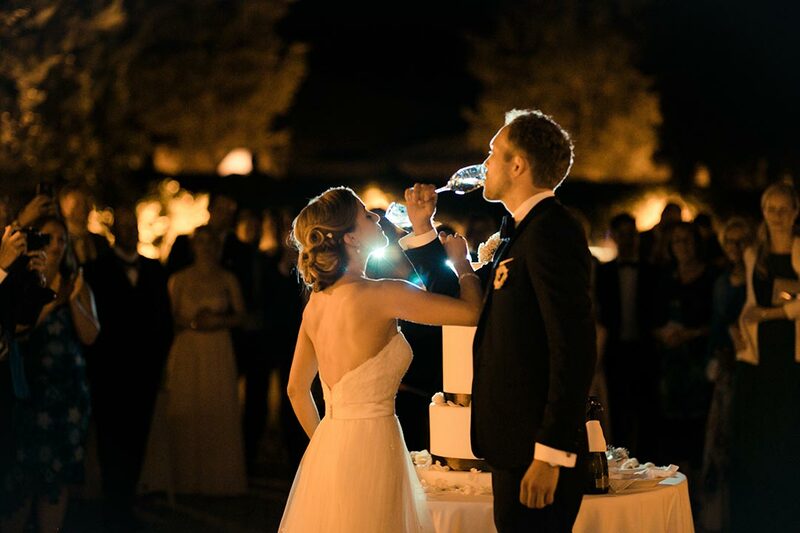 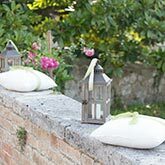 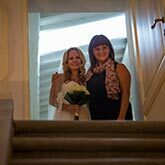 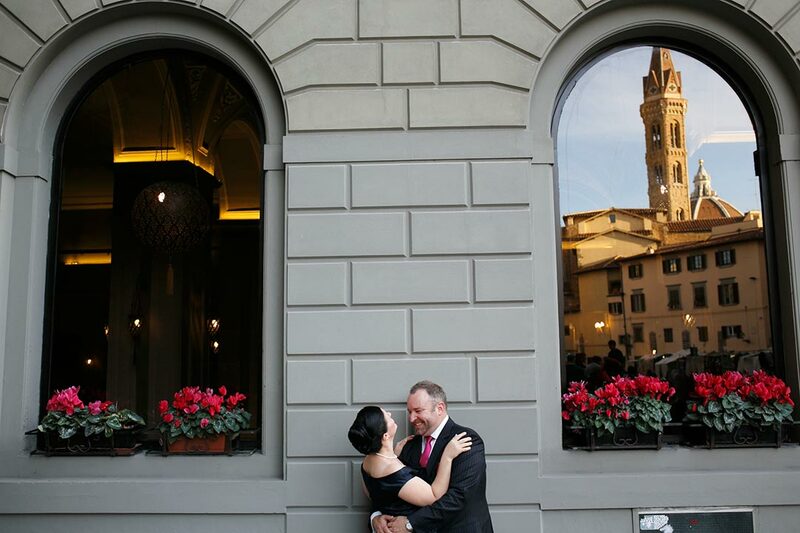 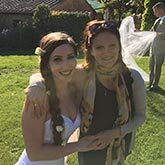 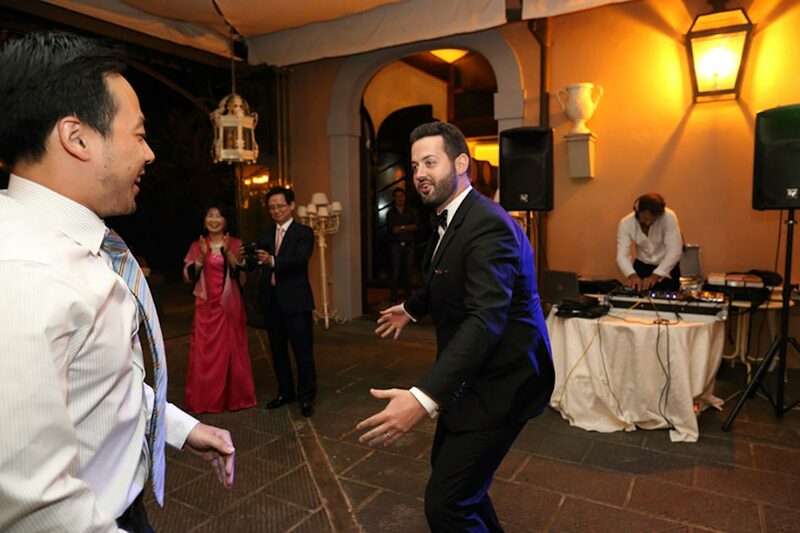 As your wedding coordinator, I will assist you throughout the legal procedures and will then be on hand from your arrival in Italy until the end of your wedding day. 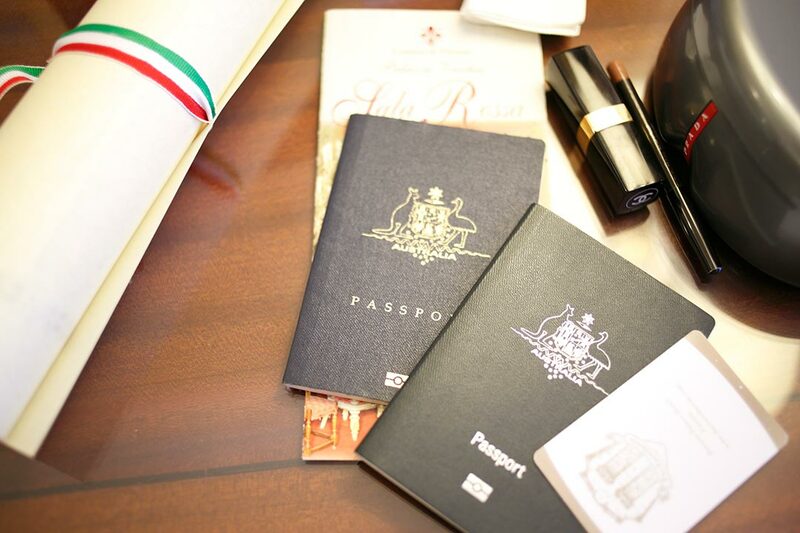 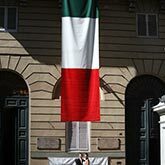 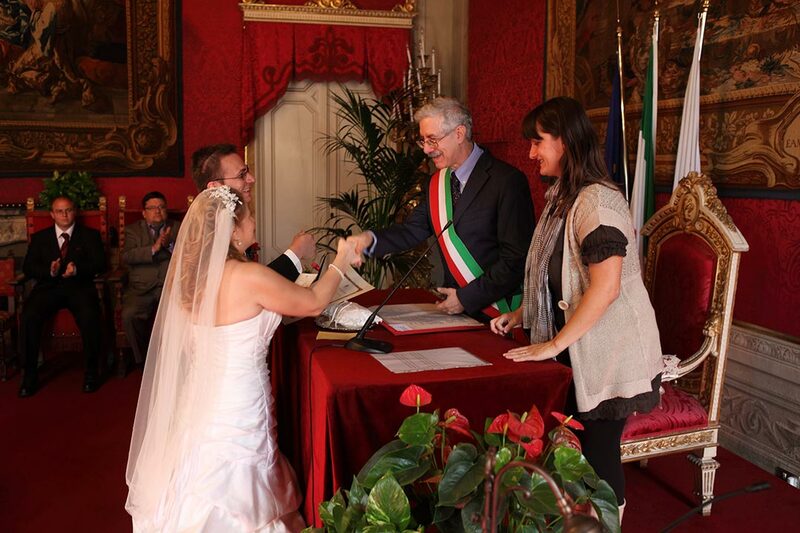 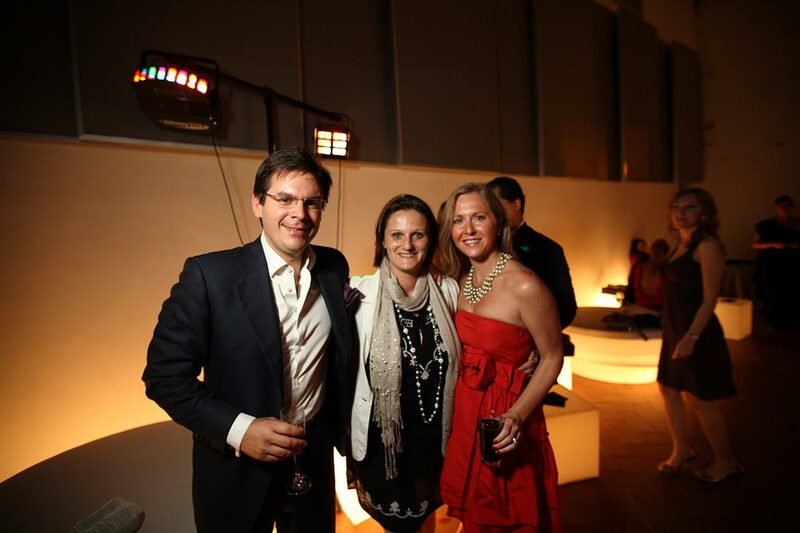 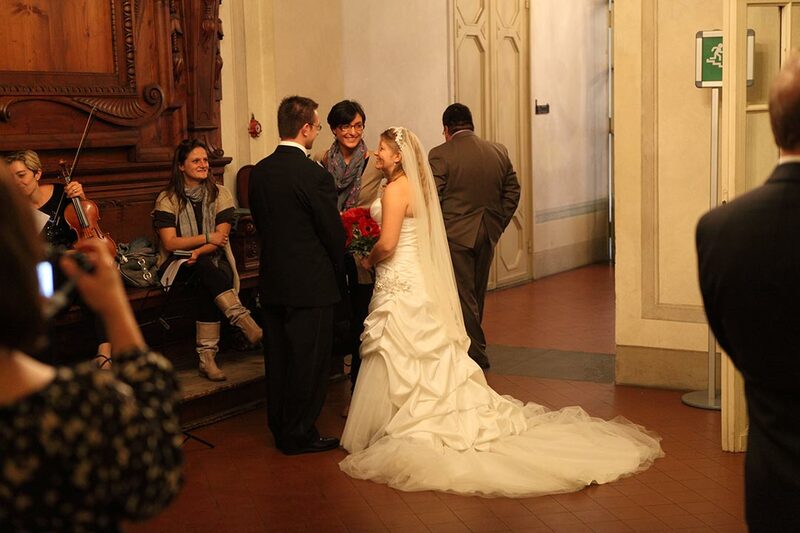 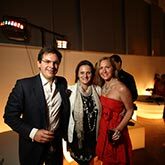 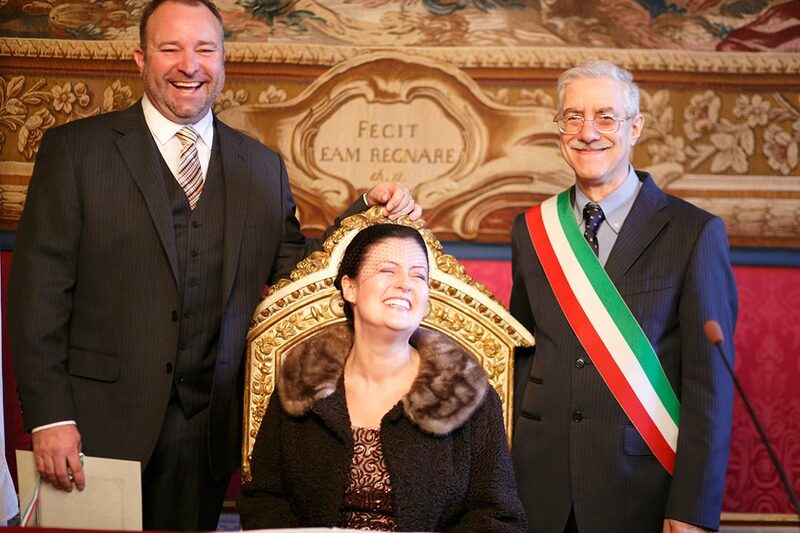 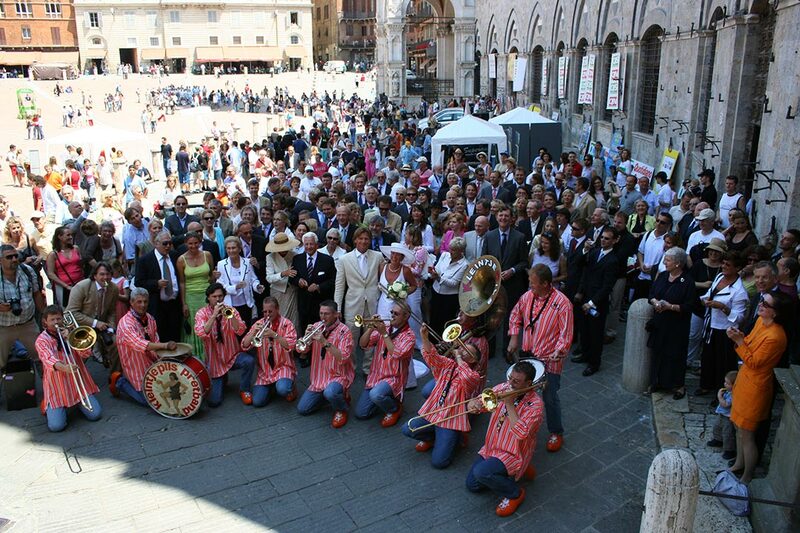 I help couples of every nationality and I handle the back and forth with their Embassies and Consulates in Italy. 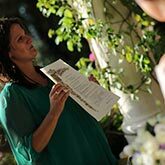 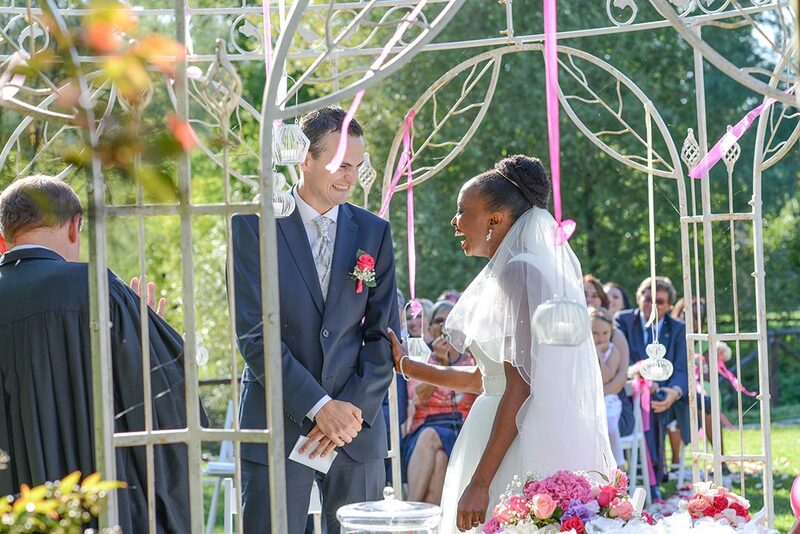 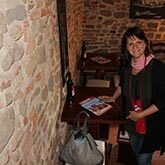 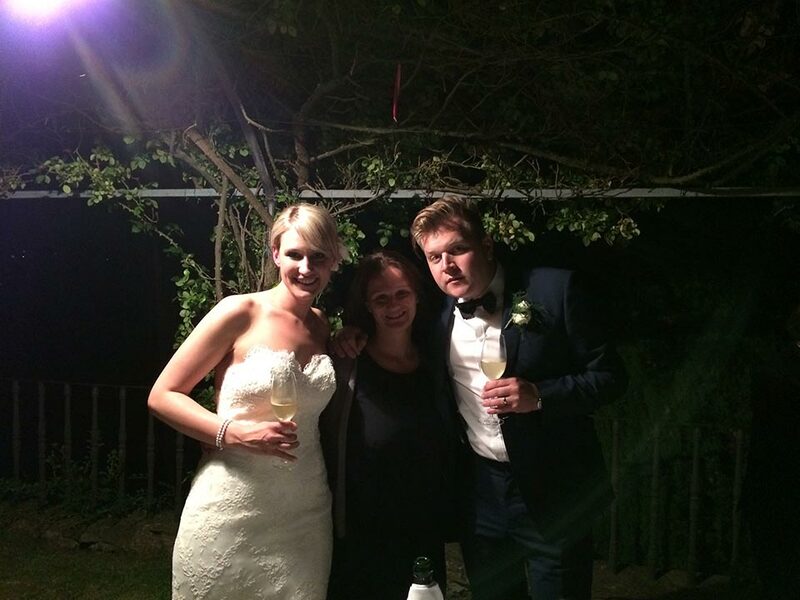 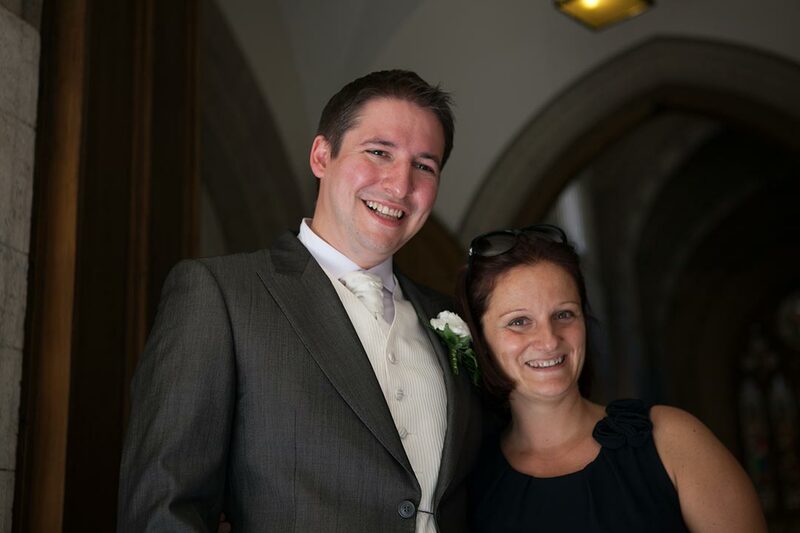 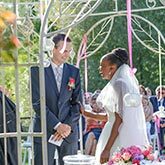 I am fluent in English, French and German and will be happy to be your interpreter during your official ceremony. 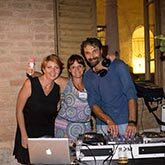 For other languages I will happily provide mother tongue interpreters. 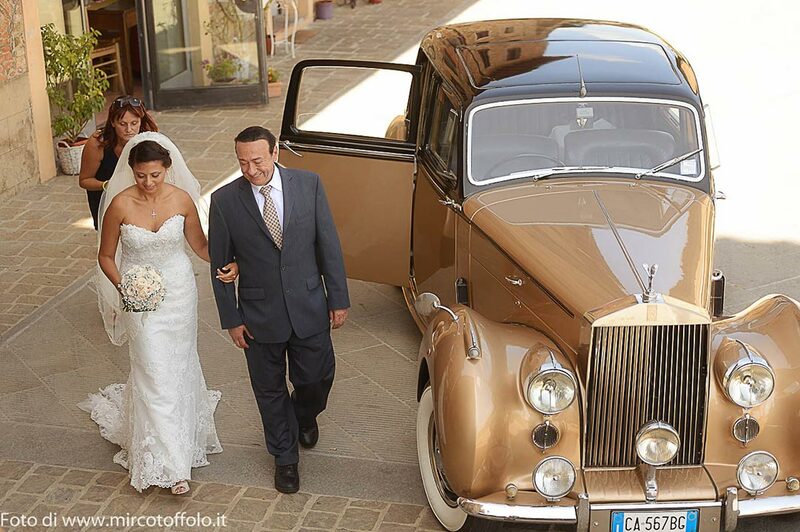 from Imagine the bride and her father on their way to the ceremony. 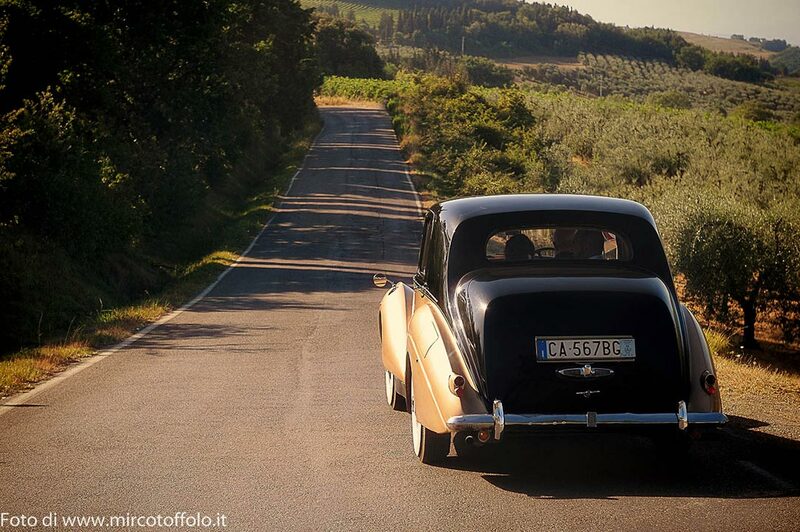 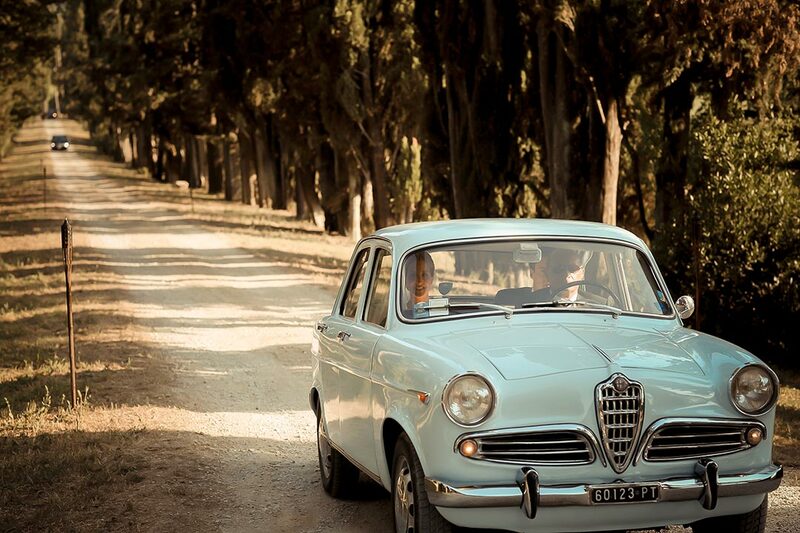 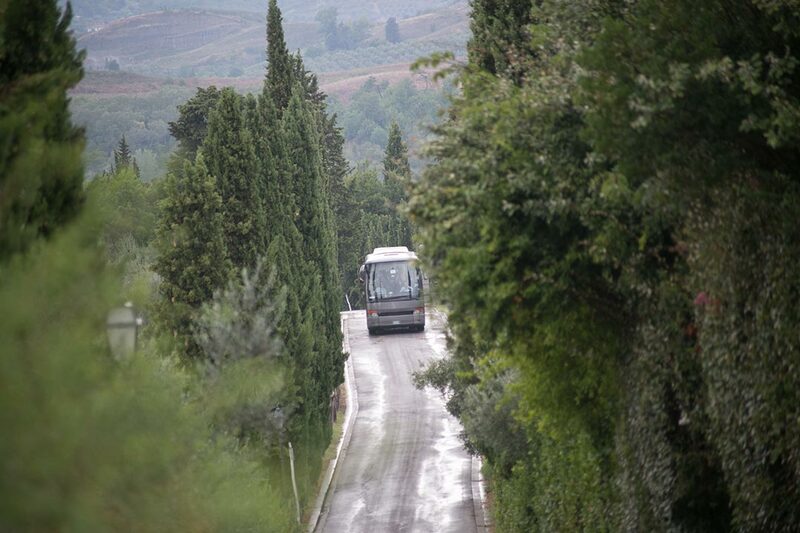 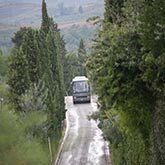 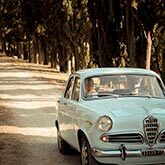 Imagine a country road immersed in the quintessential Tuscan landscape or a picturesque street in one of Italy's famous cities of art... What could be better than to enjoy the view on board of an Italian old-timer. 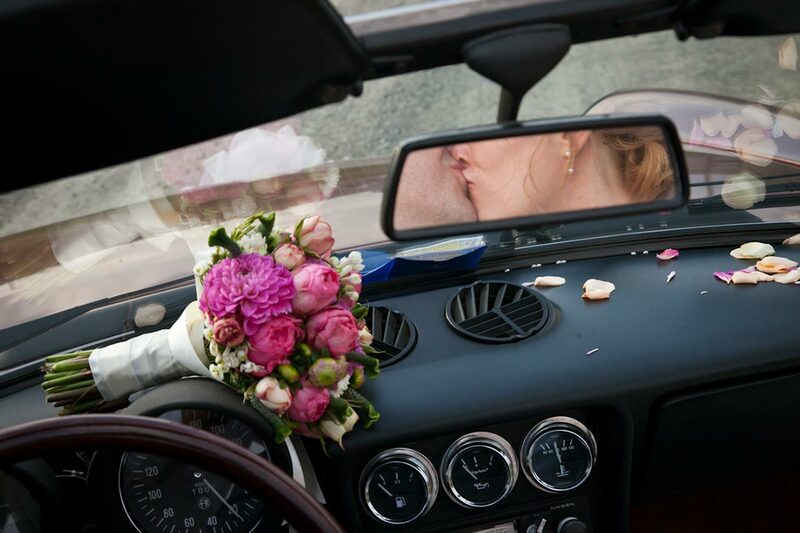 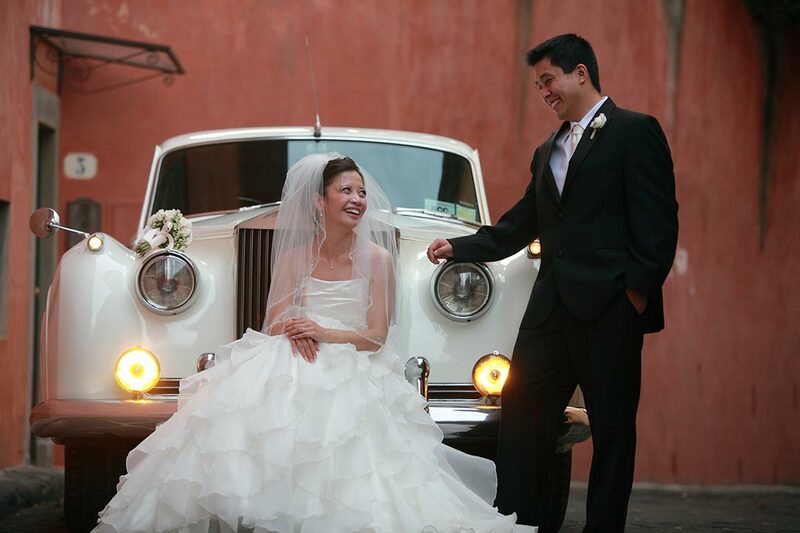 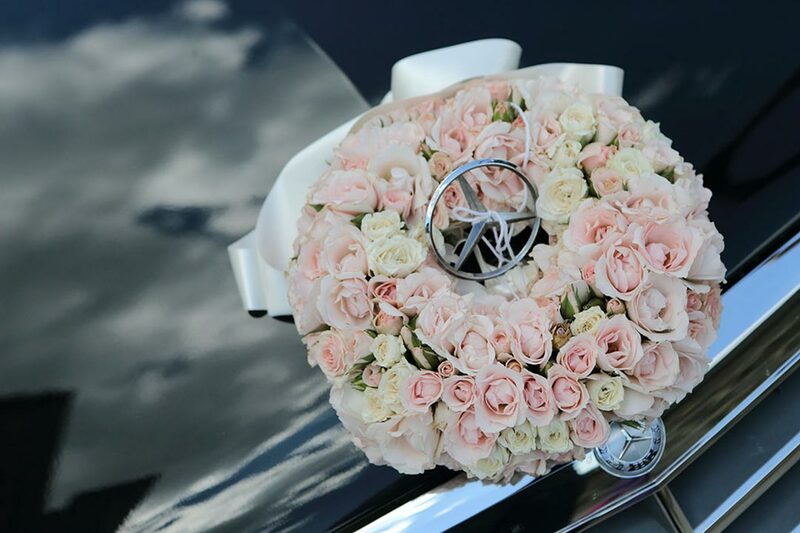 The kind of car chosen will depend on the style of the wedding and the distances. 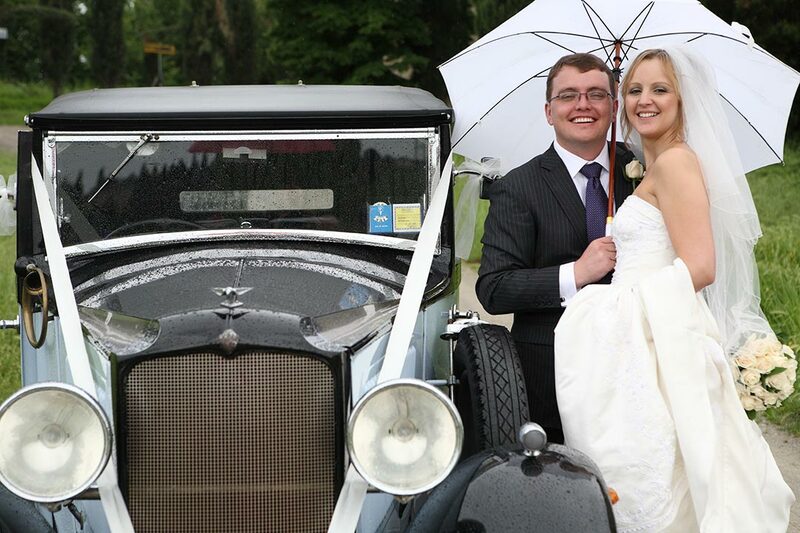 For the bride and groom we can also arrange an elegant horse carriage to pick them up, like in fairy tales! 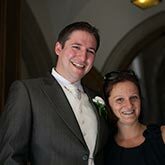 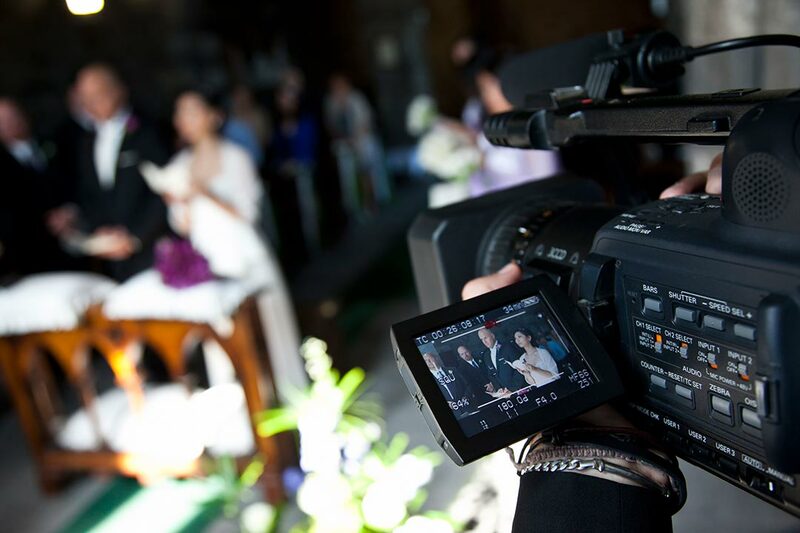 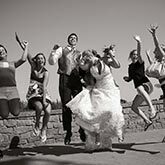 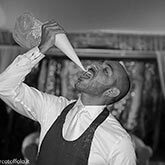 The photographer has one of the most important jobs on the day of your wedding. 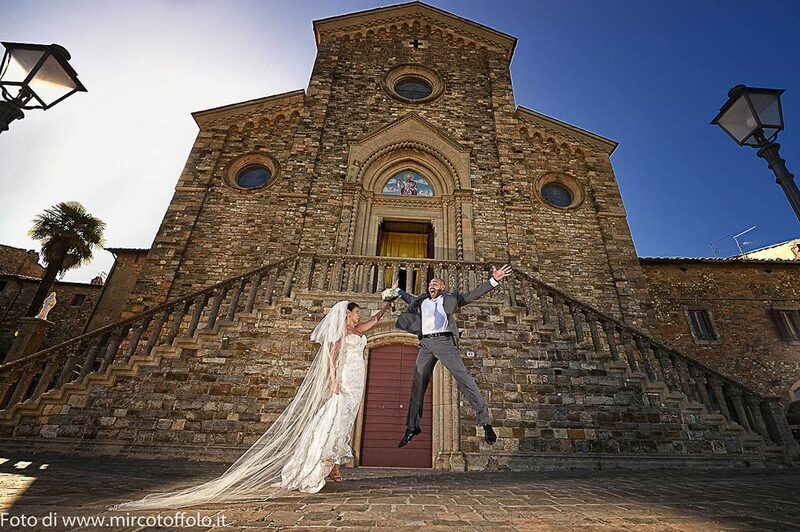 He captures the magic moments of that day in the way you wish.... he is an imperceptible friend that creates what, in the future, will be a fundamental part of the memories of your marriage... We work only with the best professionals in the area, photographers that are specialized in wedding photography and are at your complete disposal to understand your ideas and specific requests. 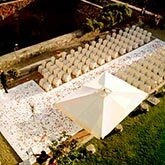 We take immense pride in the unrivalled quality of our services. 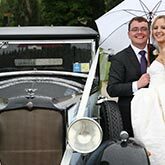 A great number of our clients have been referred to us from other couples that we have assisted in the past – the best indication of the excellent quality of the services that we offer. 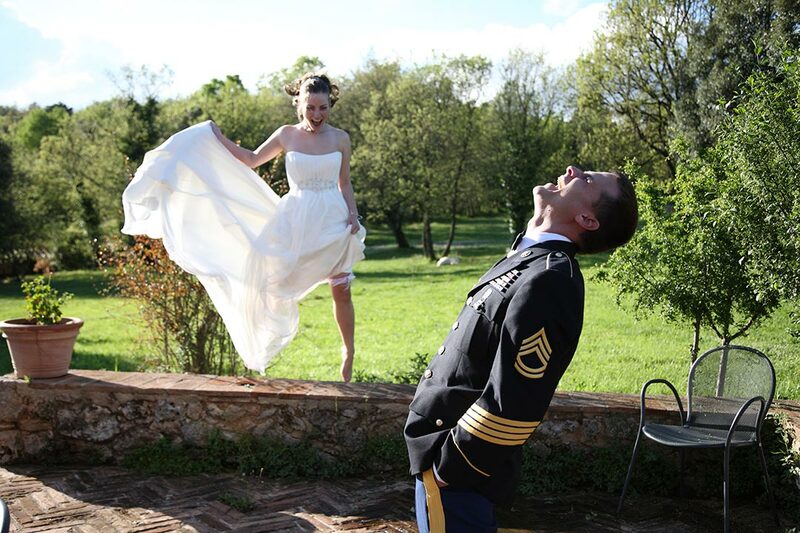 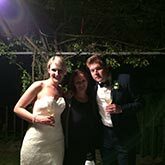 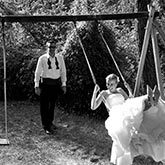 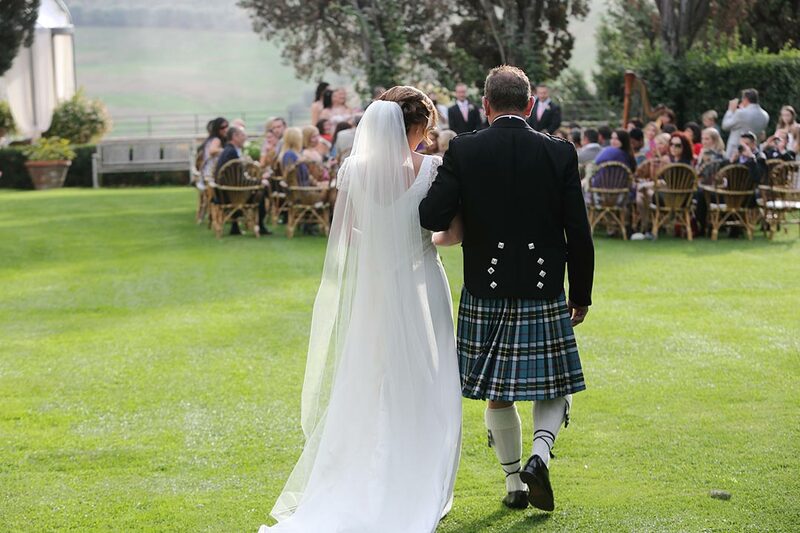 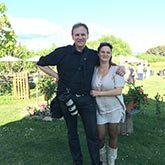 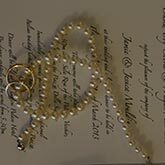 Your Special Happening has been planning weddings for 20 years now and our knowledge and experience in the field is what makes us one of the best agencies around. 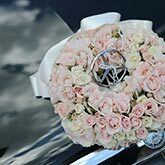 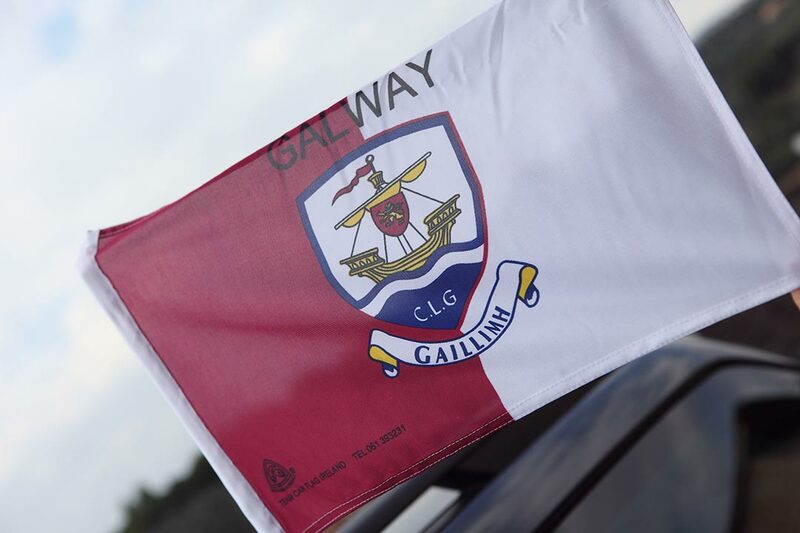 We constantly strive to offer our clients absolute top quality service and professionalism. 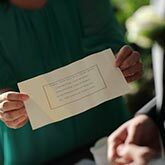 Collecting all the RSVPs for the event can be a headache for the bride and groom. 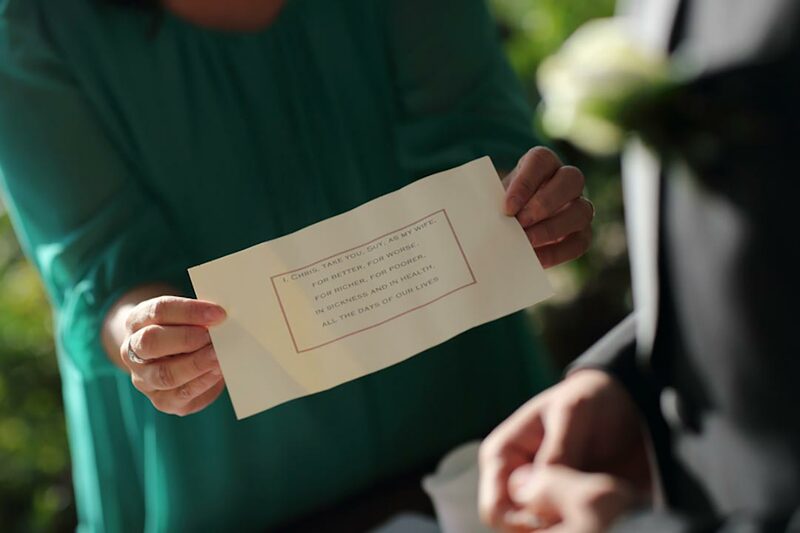 We are more than happy to assist you: with our RSVP service, your guests will reply to us directly and we will take care of it from there! 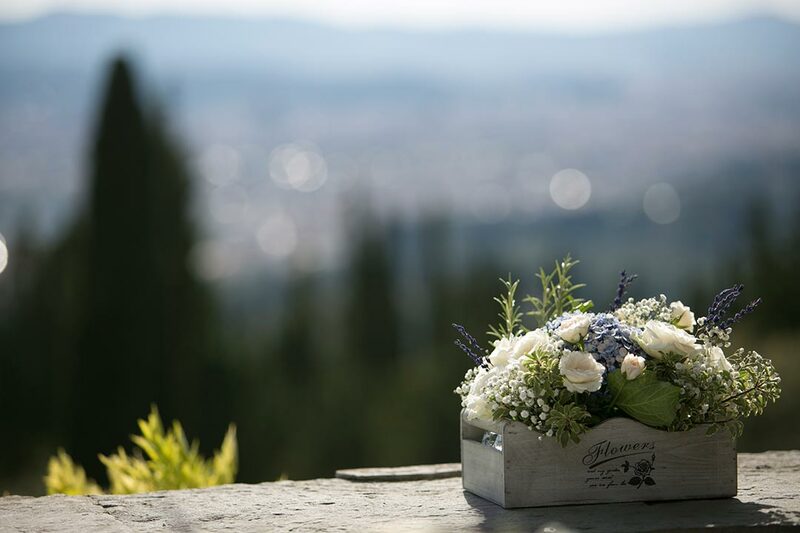 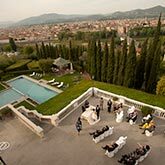 Tuscany, the Italian Riviera, the islands and Lake Como offer some of the most spectacular and romantic surroundings for a dream wedding. 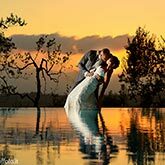 I am eager to lead you on a discovery of these stunning locations to help you find the place that reflects the perfect wedding that you have always dreamed of. 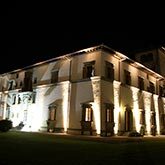 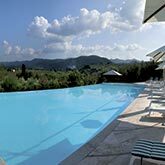 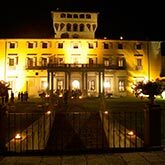 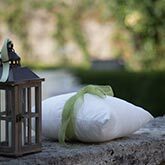 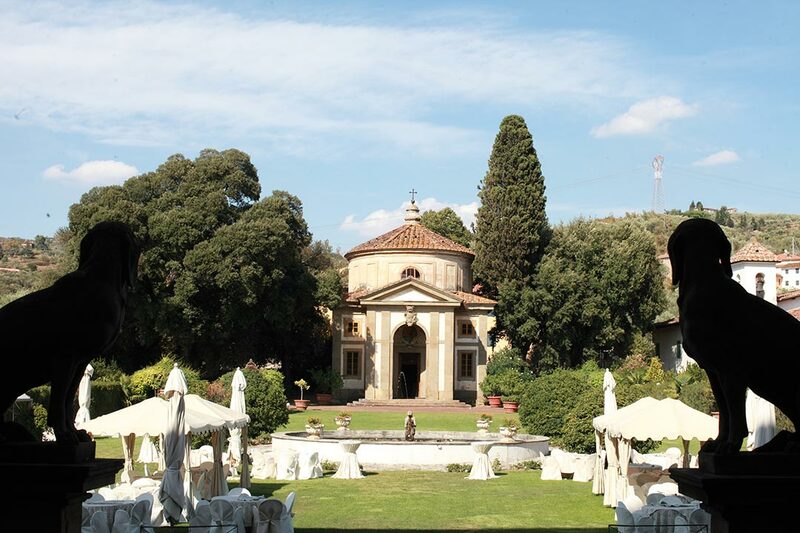 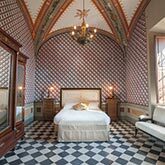 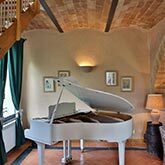 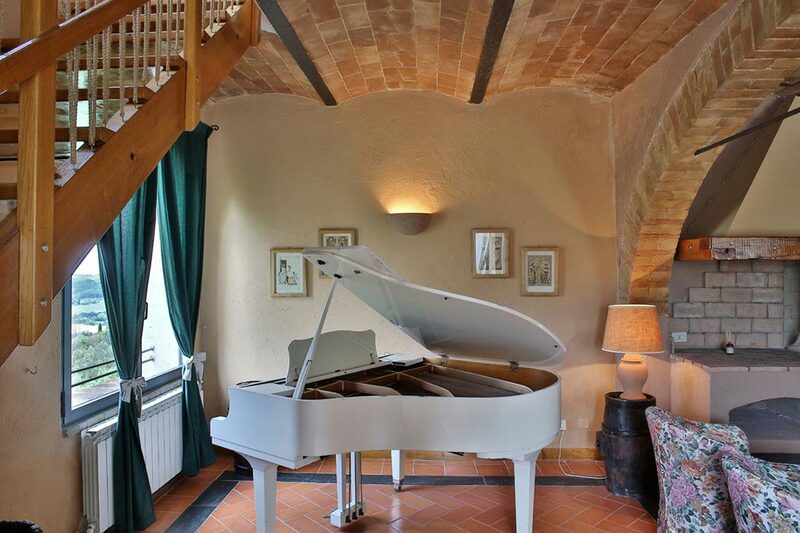 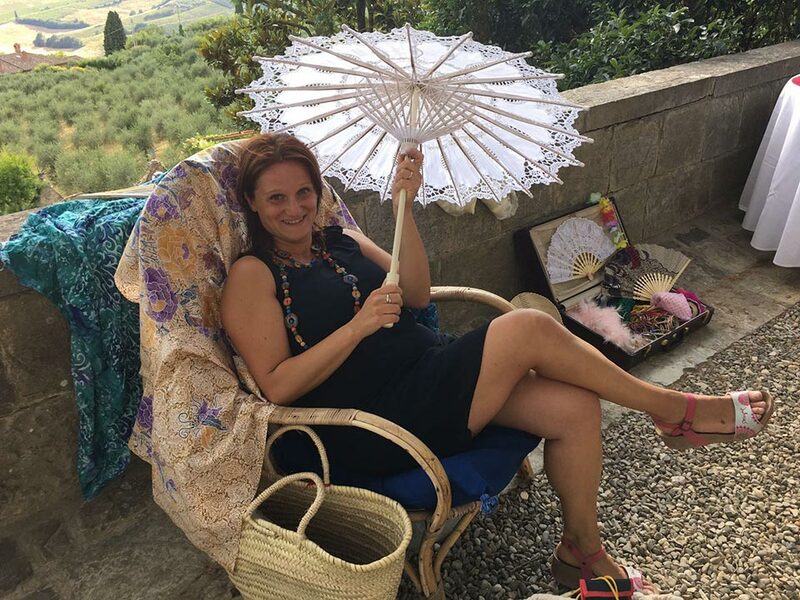 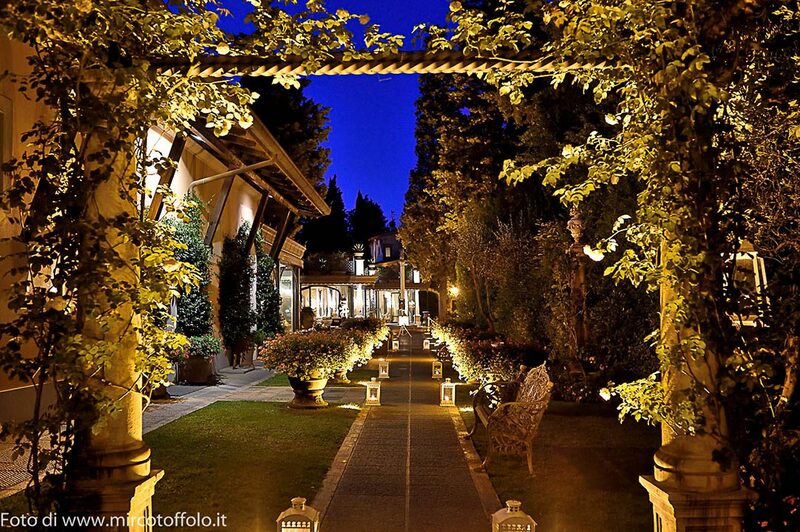 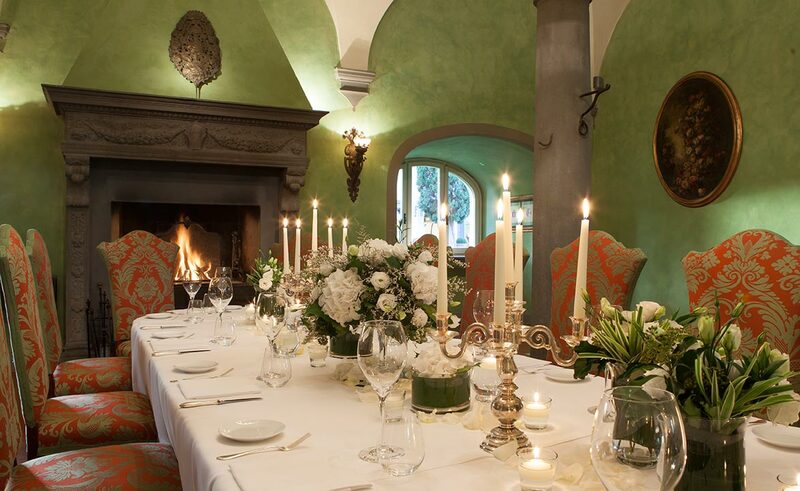 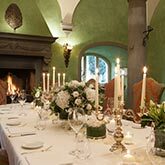 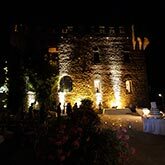 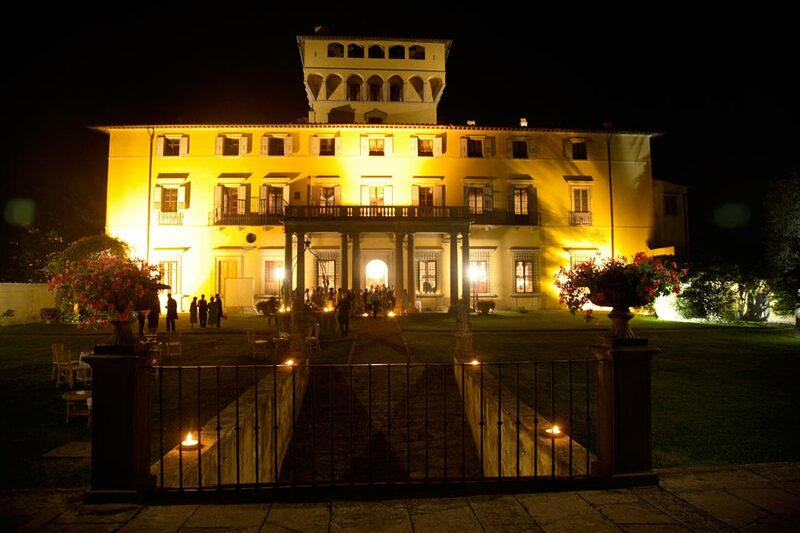 A romantic terrace facing the seaside, a colourful garden surrounded by rolling Tuscan hills, an elegant hall inside an historical castle, an intimate gazebo on the lake front... Whatever your preference I am thrilled to take you on this journey to find the ideal setting according to your personal vision. 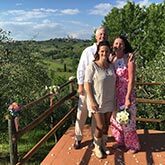 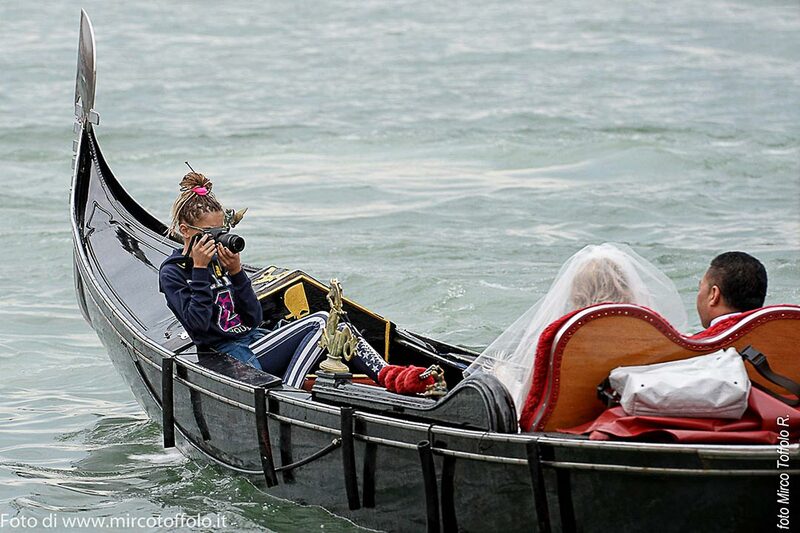 Beyond the wedding, whether you are dreaming of an Italian-style honeymoon or you and your guests want simply to take advantage of your time in Italy to explore the wonders of this amazing country, Your Special Happening is also an incoming tour operator. 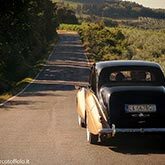 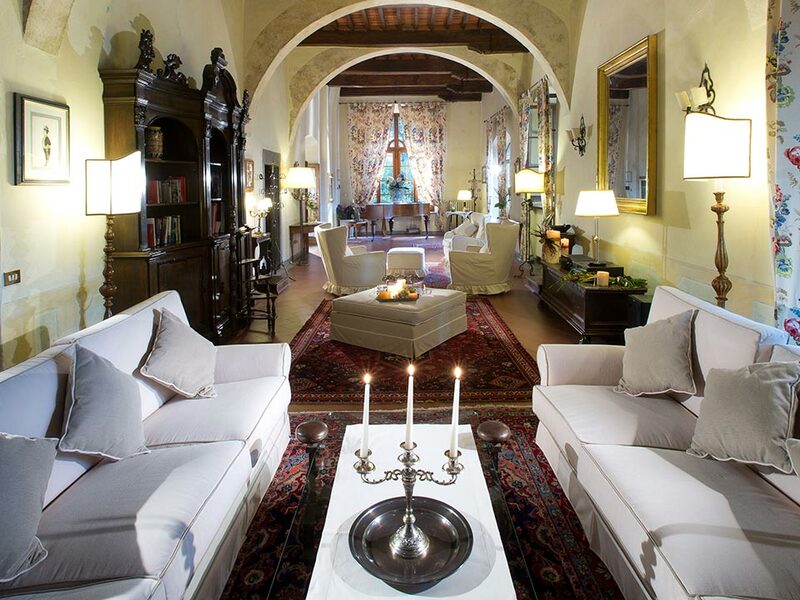 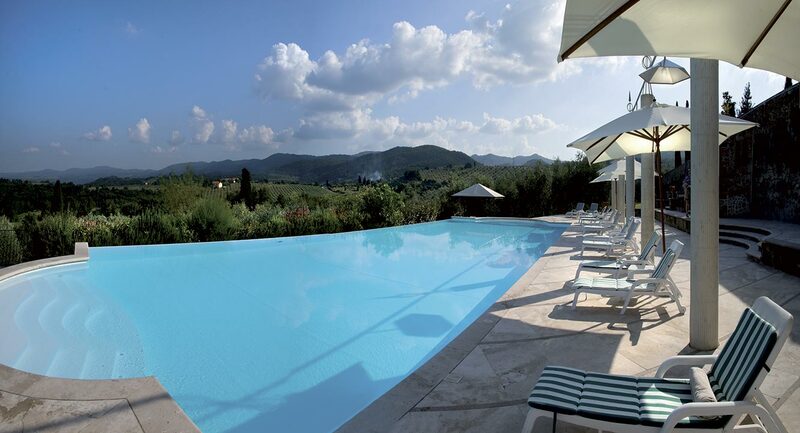 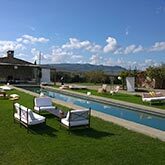 Visit our travel website at www.ladolcetoscana.com for more details. 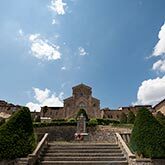 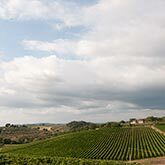 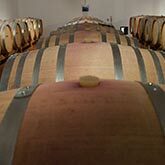 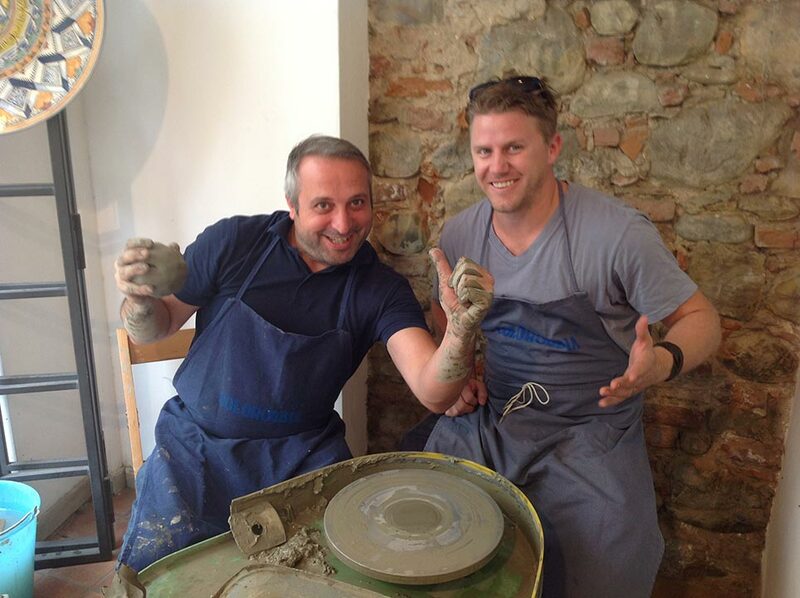 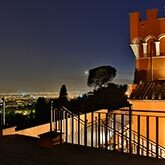 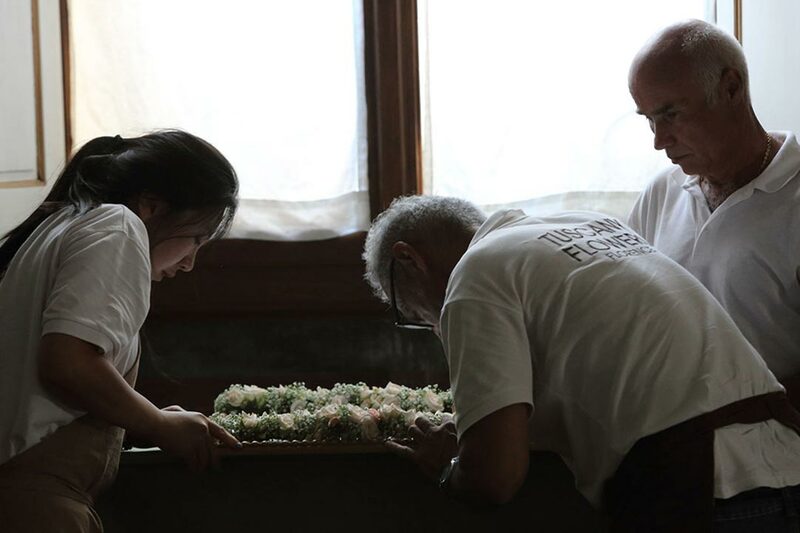 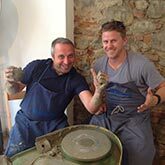 We offer a full range of services to ensure that you and your guests make the most out of your stay: group tours and private customised tours, off-the-beaten-path excursions, explorations through ancient cities and villages, wine tours and culinary adventures, discovery of Italy's many cultural and artistic wonders and much, much more. 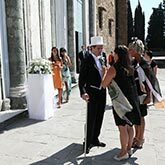 We can arrange accommodations and ground transportation during your stay and even book tickets for visits to the museums, events and venues of your choice. 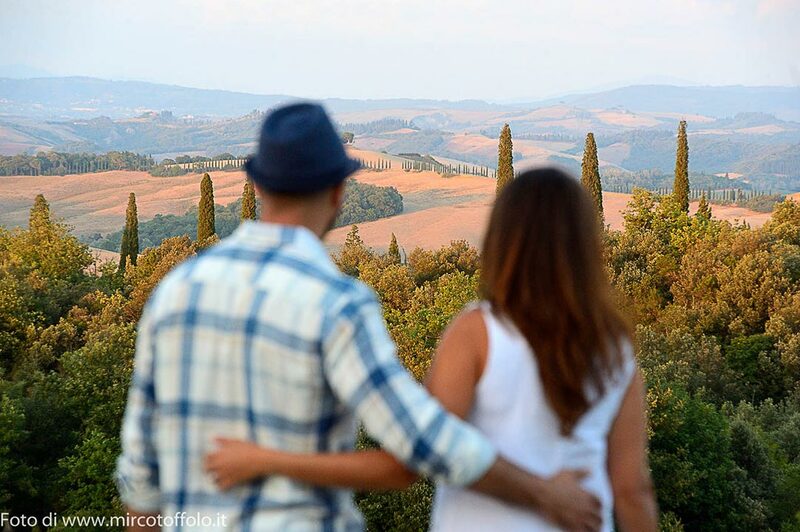 Join us on an amazing journey and discover the astonishing beauties of this land through the eyes of a local. 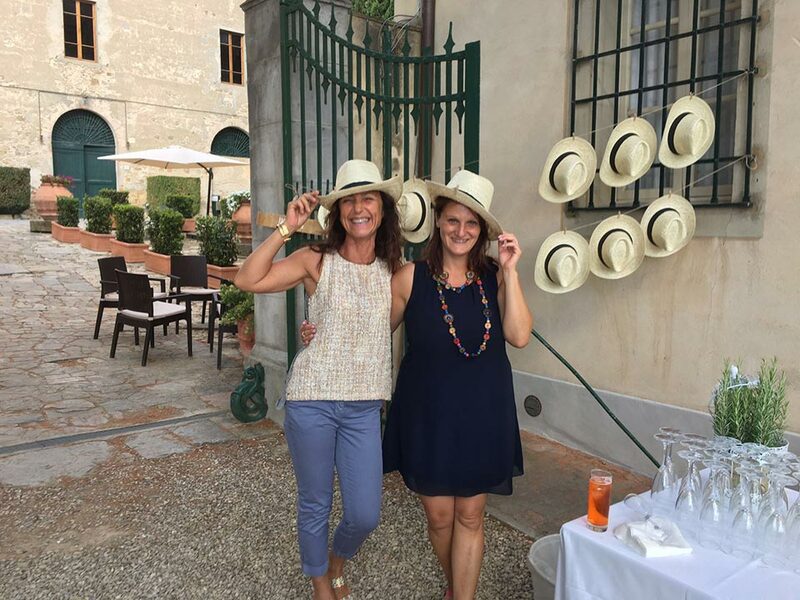 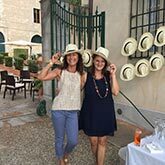 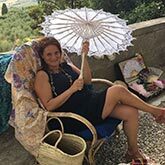 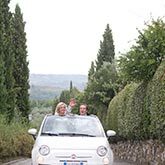 We offer you our first-hand knowledge and experience to ensure that your travels through Italy leave you with extraordinary personal insight into the culture and remarkable memories that will stay with you a lifetime. 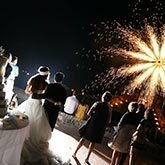 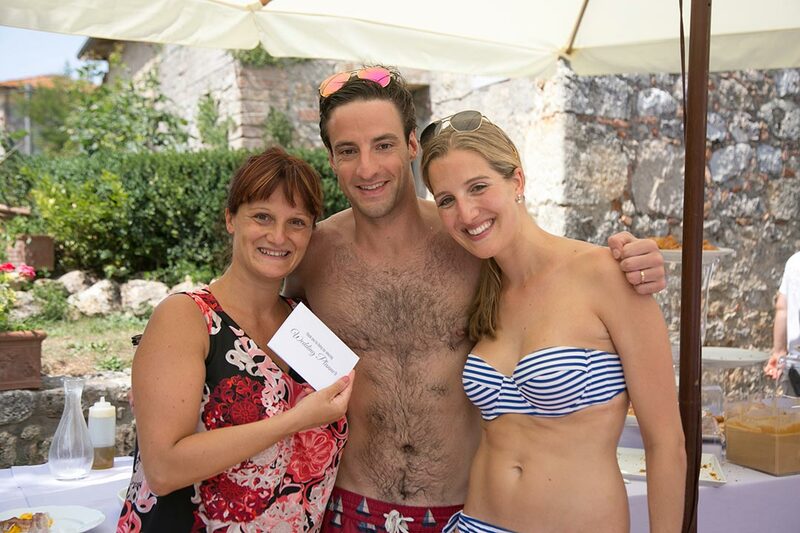 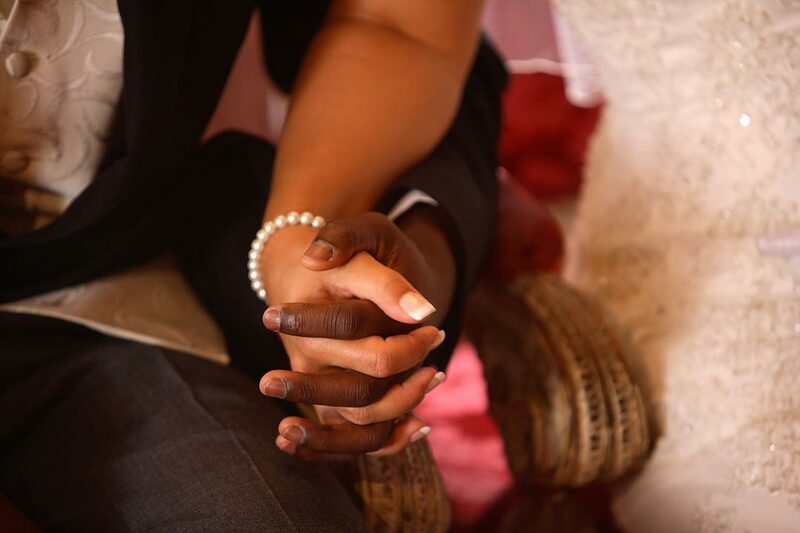 Unforgettable moments...couples that choose the services of Your Special Happening often love to share their experience with friends and other couples. 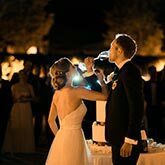 We constantly receive wonderfully touching testimonials from our clients that are the perfect conclusions to our amazing moments shared together. 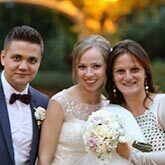 These testimonials are the best way for us to summarize our philosophy and give you a clear idea of our style. 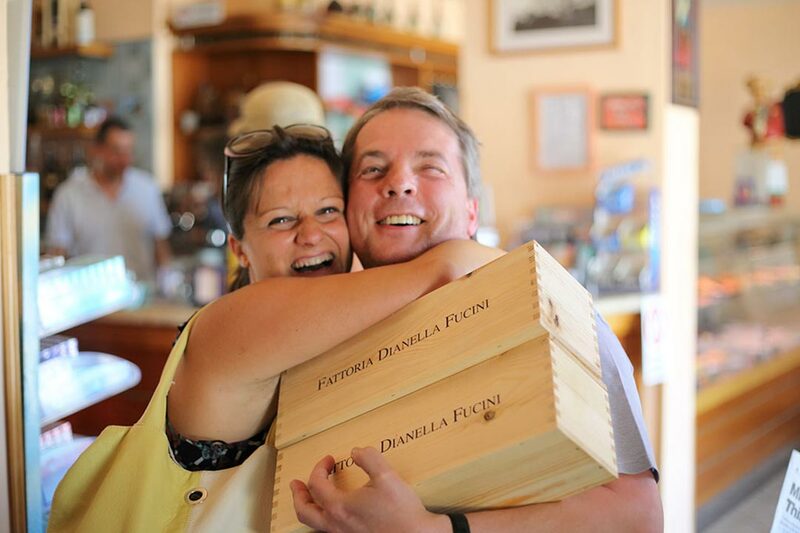 When couples send me pictures of their newborns addressed to “Our lovely Italian aunty...”, this is what fuels my passion for this job – knowing that I have had a hand in such happiness! 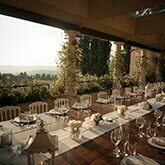 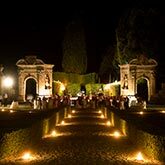 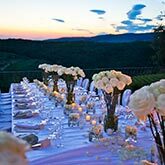 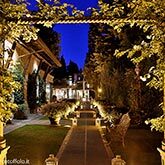 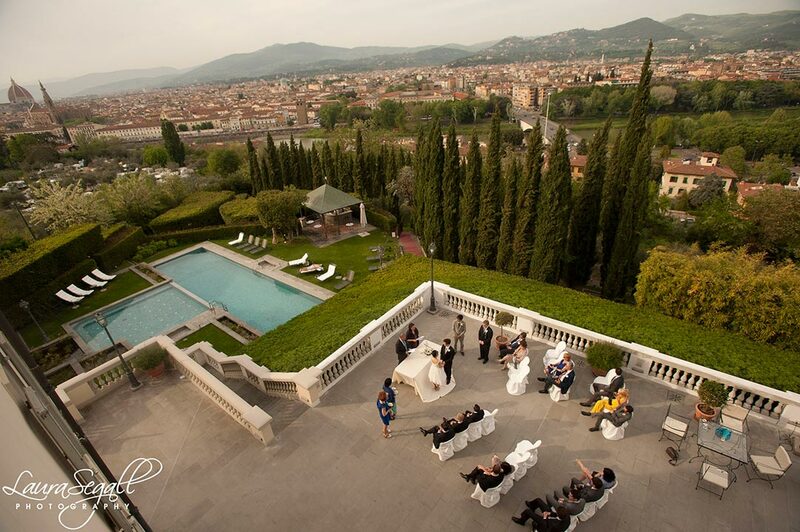 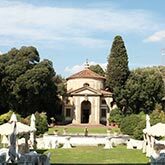 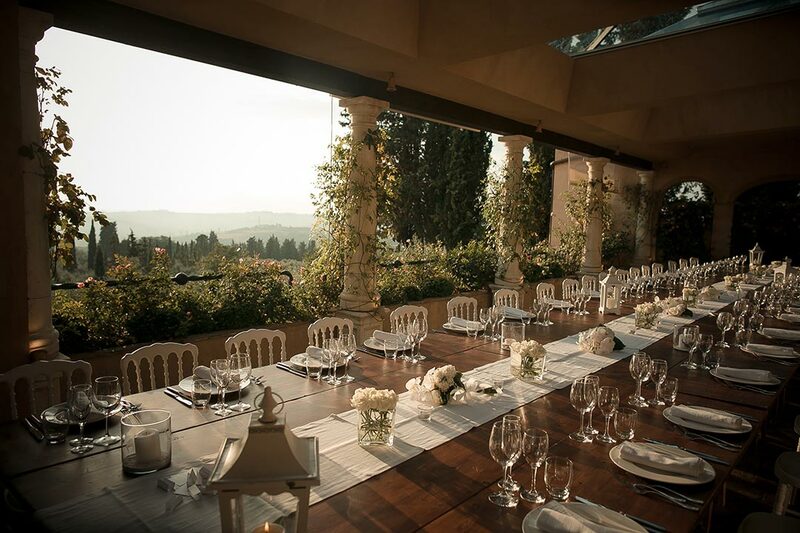 Italy and especially Tuscany, offers a vast selection of beautiful venues and villas that are perfect settings for dream weddings. 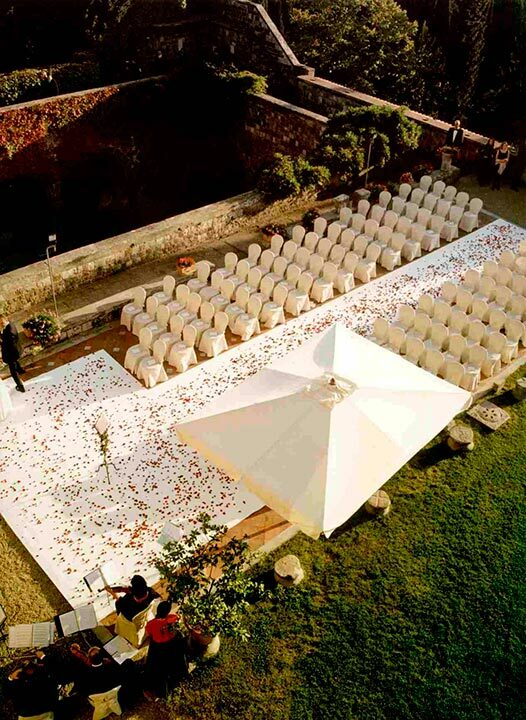 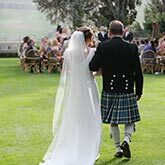 Each venue has particular qualities that can be perfect for one couple but not for another. 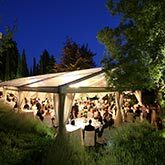 The selection therefore of the appropriate venues to recommend to our clients is a very important service that we offer. 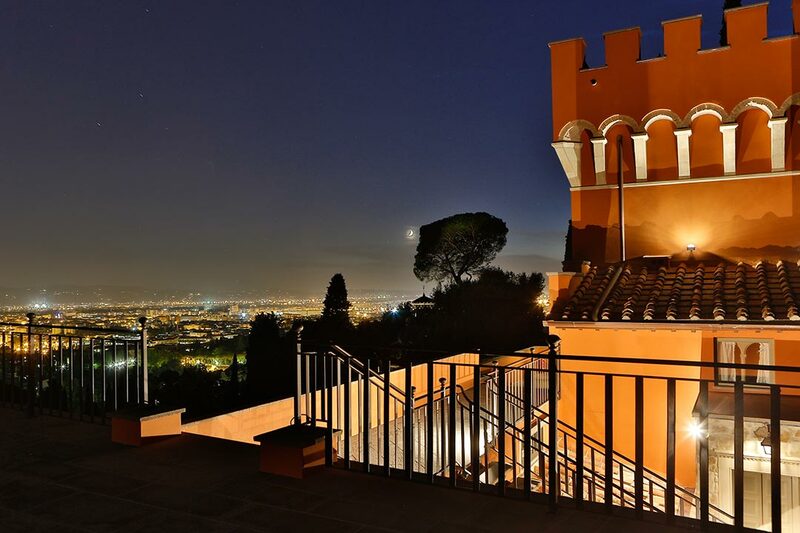 I will guide you in the search for the perfect location that responds to your vision. 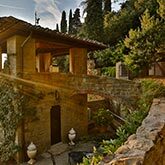 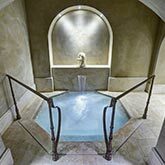 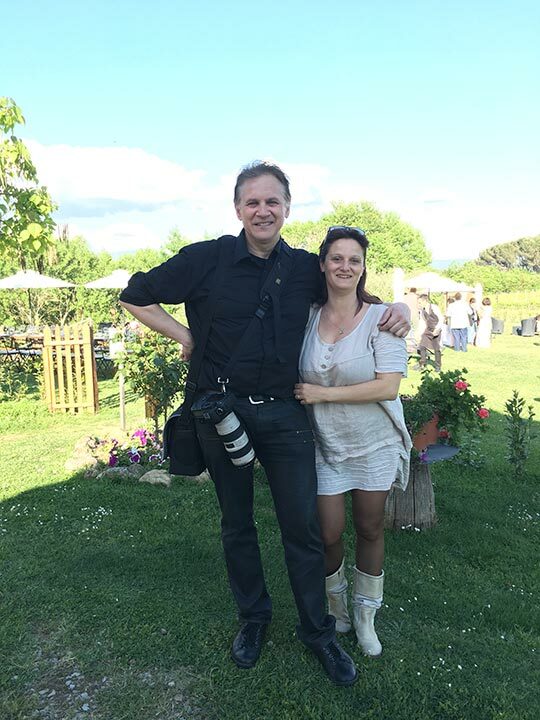 We have been collaborating with the must stunning locations in Italy for years and our excellent reputation in the field helps us to obtain special rates and conditions that we then pass on to our clients. 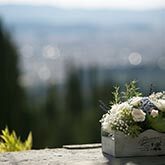 W for Why Choose Happening? 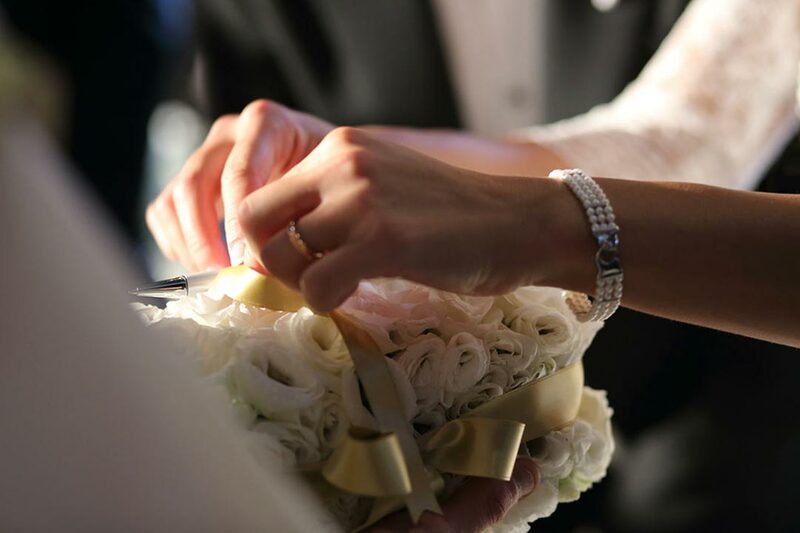 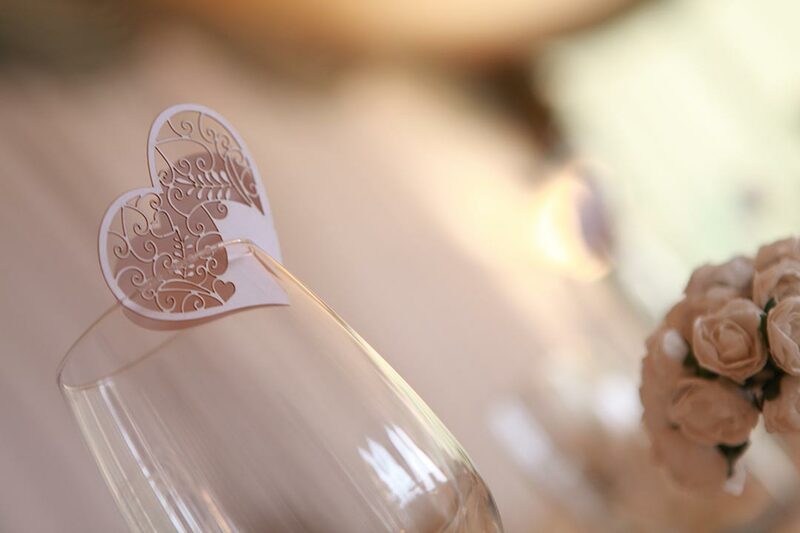 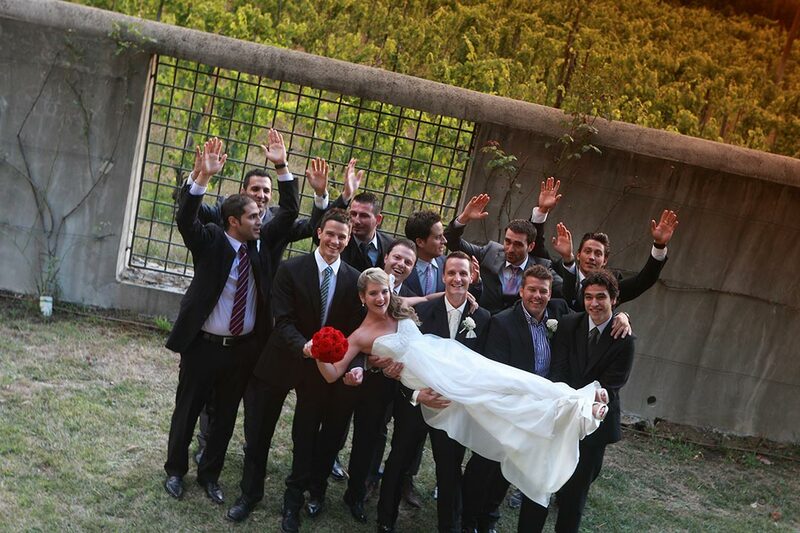 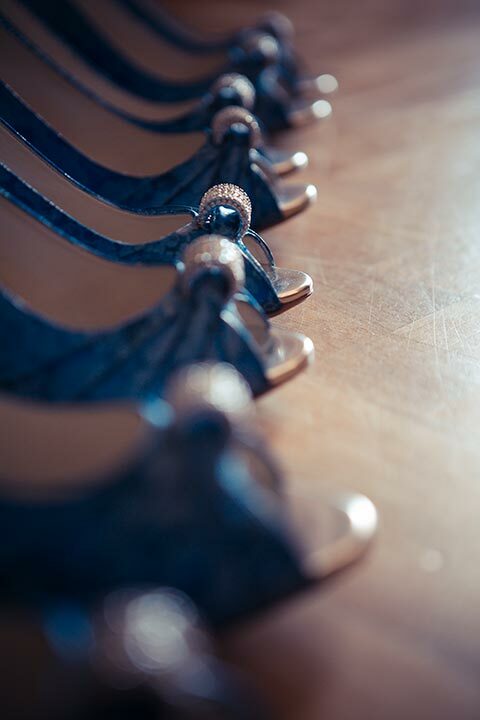 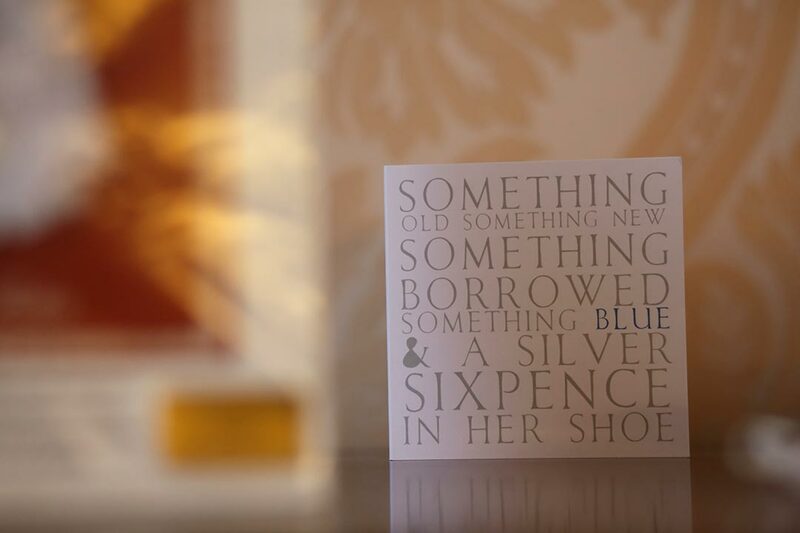 Our team's enthusiasm, dedication and years of expertise will ensure that you have the wedding of your dreams! 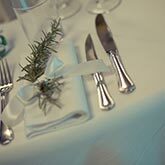 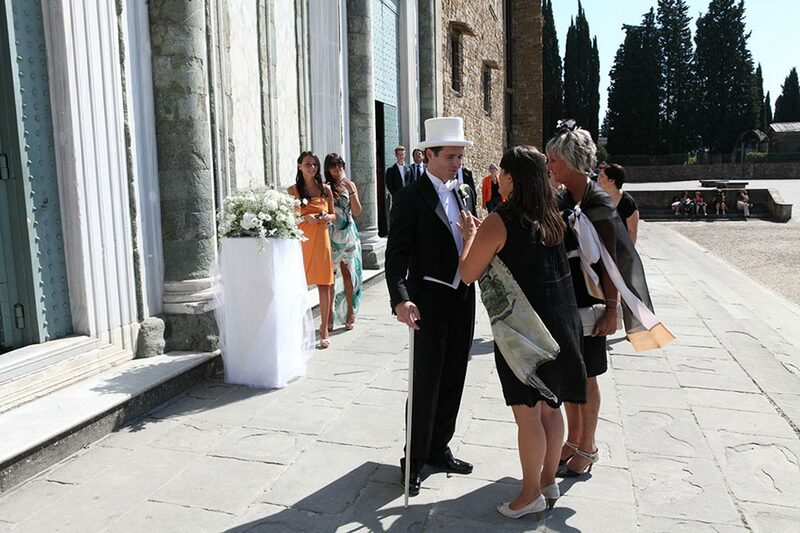 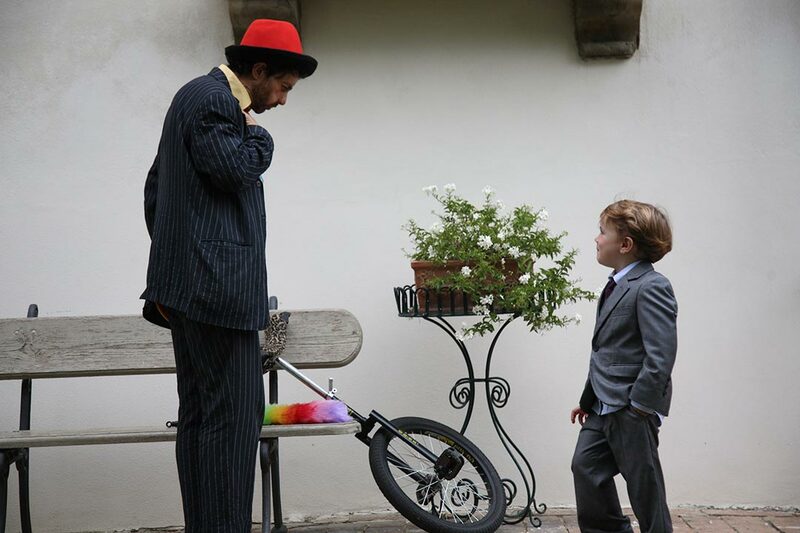 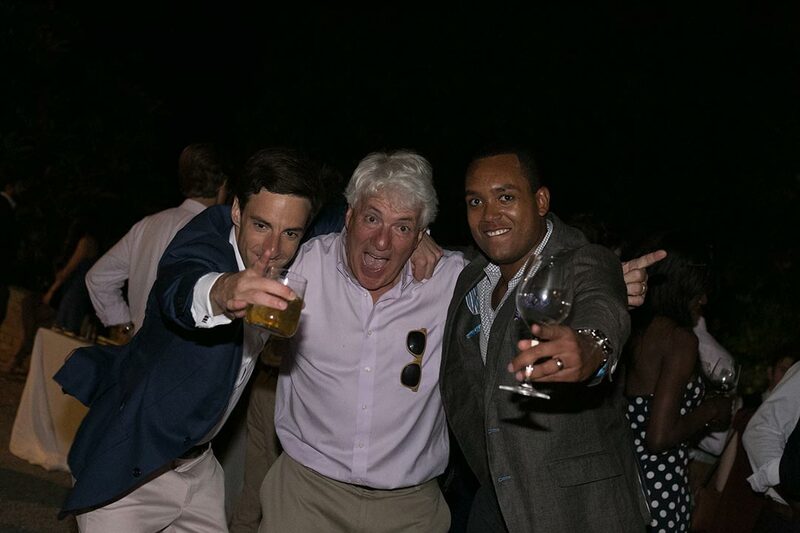 Whatever kind of wedding you choose, we guarantee an absolute high level of service all along the way. 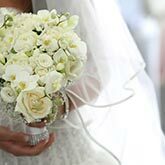 My presence on the day of your wedding will ensure perfection and zero worries for you so that you can enjoy every single moment of this joyous day. 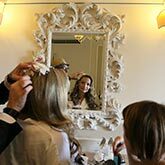 Now that you know all about the services that we provide and what our past clients have to say about us, you can rest assured that your wedding day will be absolutely perfect just as you have always dreamed!